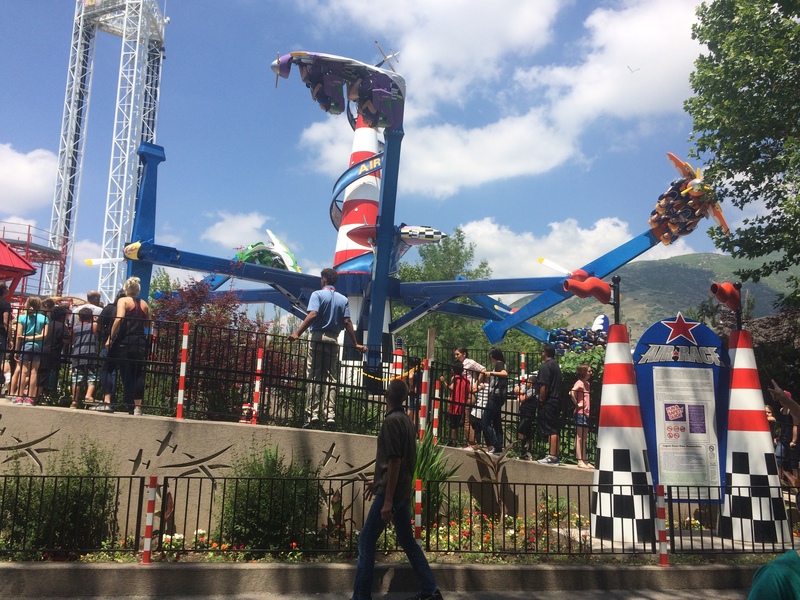 I really enjoyed this park because it ha a good mix of old and new roller coasters like the Roller Coaster that is the 9th oldest coaster in the world and Cannibal, the parks newest and North America’s steepest roller coaster at 116 degrees. 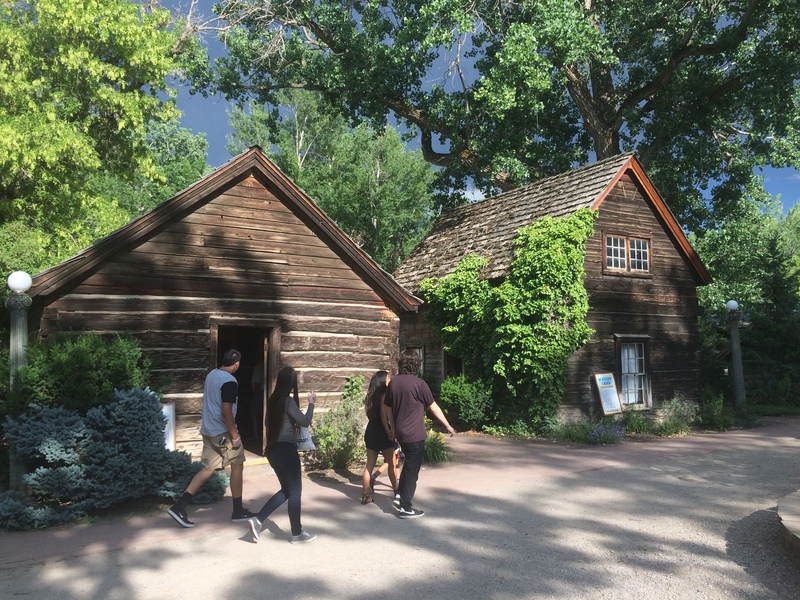 Lagoon also has an incredible historic area called Pioneer Village which contains buildings that were moved to the park from around the state of Utah and are much older than the park itself. 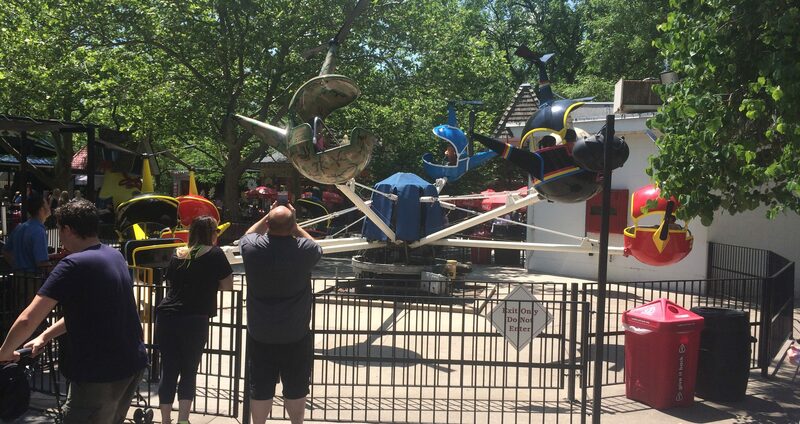 This park has a great collection of flat rides like the Rock-O-Plane which hasn’t been manufactured in the last fifty years and the Rocket which will launch or drop riders to/from 200 feet in the air. 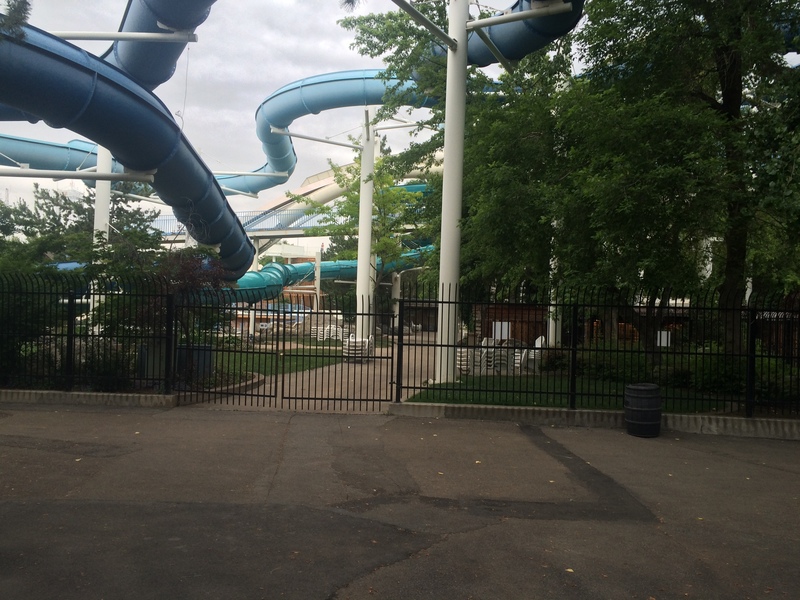 But before we go into the park, let me tell you a little about Lagoon’s long and rich history. This park actually predates the current location as it originally opened as Lake Park on the shores of the Great Salt Lake about three miles west of the current location. The Denver & Rio Grande Western Railroad originally opened this resort in 1886 as a bathing resort and it wasn’t alone. There were several of these bathing resorts along the shores of the Great Salt Lake and chief among them was Saltair several miles further west on the lake shore. 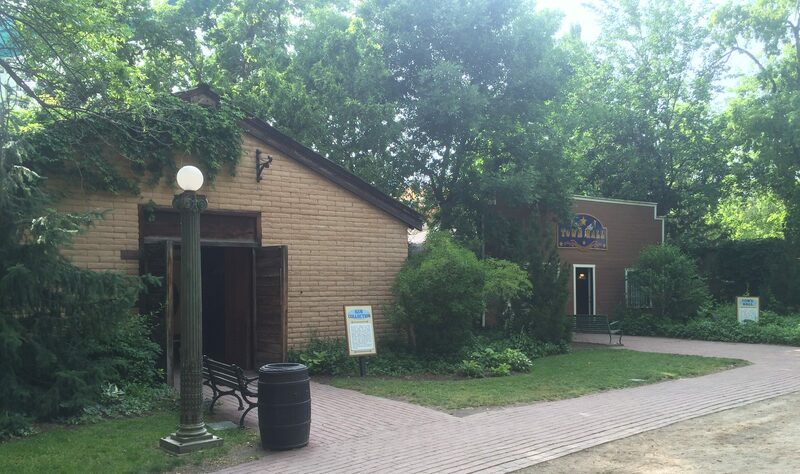 The resort mainly featured a dance hall, changing rooms, and gardens, as well as a train station for the D&RGRR. Unfortunately, the water levels in the lake can change drastically and many of these resorts were built at a time of high water. The lake levels dropped as the years went along which forced those resorts to adapt or close. SaltAir did adapt by extending its pier and establishing a new beach farther out with a small train to transport their guests to the beach. Lake Park did adapt but ended up closing in 1895. Simon Bamberger, who was Vice President and 25% owner of the park and building his own railroad nicknamed the “Bamberger” from Salt Lake City to Ogden, decided buy most of the original buildings at Lake Park and had them transported about three miles west to a 40 acre plot of land that Simon had bought. That location became Lagoon Park which opened on July 12, 1896 with a train station on the north end of the park. It should be noted the was named for the lagoon that was dredged for the park during its construction and was much larger, at 9 acres, than it is at the present day. 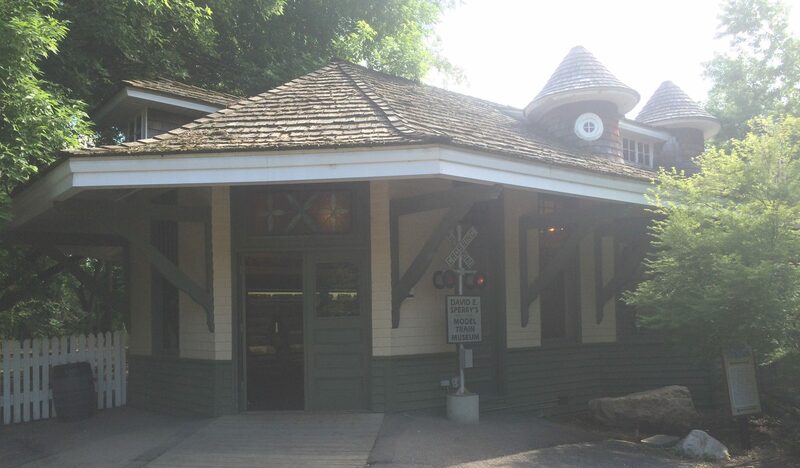 Train service to the park continued on “The Bamberger” until it shut down on September 6, 1952. 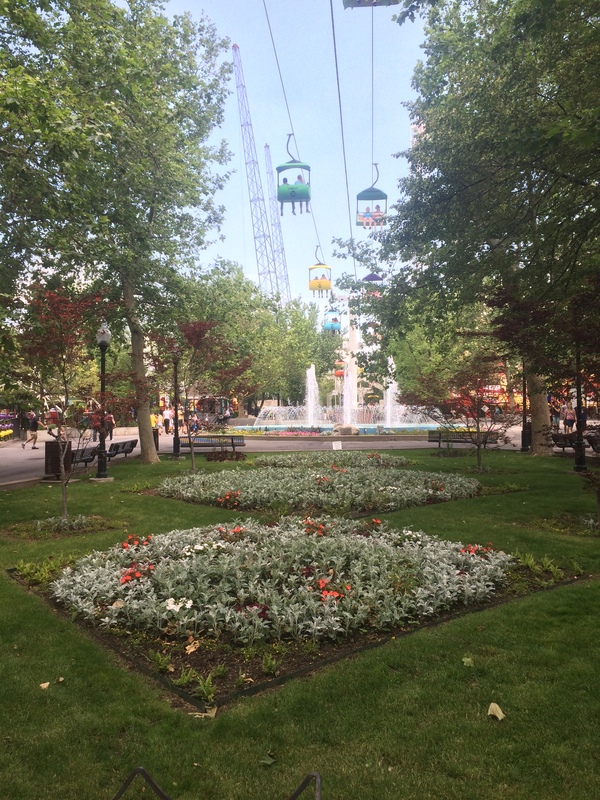 The park originally opened with a dance hall, bowling alley, a shady Bowery, and good restaurants. The first attraction installed at the park was a Shoot-the-Chutes ride in 1900. Here is an example of what a Shoot-the-Chutes ride was like. This video, from the Library of Congress’s YouTube Channel, was shot at Luna Park in Coney Island, New York, USA. That is the same time when park guests swim and boat in the lagoon. 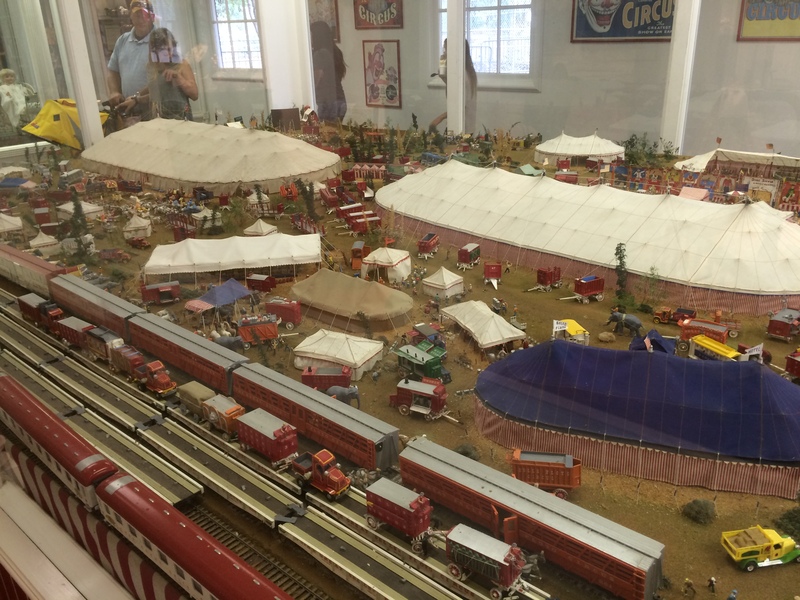 If you get tired, then you could take a spin on the parks new carousel from the Herschell-Spillman Co. and a miniature railroad. In 1901, the park hosted a minor league baseball team from the Inter-Mountain League. That stadium and field was located north of the wooden roller coaster in what is now the north parking lot. The park also had a horse racing track for the first couple of years until gambling was made illegal in the state. That track was later turned into an automobile race track. Among those that raced were racing pioneer Barney Oldfield, who set speed records on the ground and altitude records in his biplane at the park. Oldfield, was one of the early pioneers in racing that stretched from 1902 to 1918 and was the first man to go 60 mph (100 km/h). He also set speed records on the famous beaches of Daytona Beach in Florida. Oldfield also has his name enshrined at Daytona International Speedway as an entire section of stands (grandstands, box, and tower sections) are named after Oldfield. Also, this park used to have a full liquor bar in the 1910’s. The town line literally ran through the bar so that half of the bar sat in unincorporated Davis County and the other half sat in Farmington. 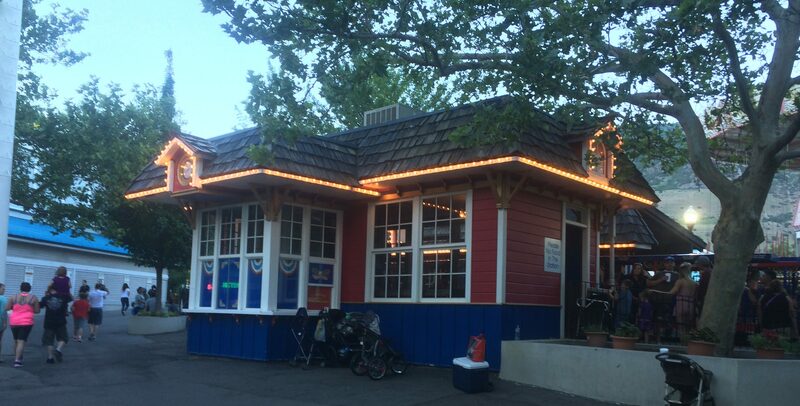 One year, the park forgot to renew their liquor license for the city so the park decided to move all of its’ liquor sales to the part that was in Davis County when the city decided to enforce their laws. In 1927, the park decided to fill in part of the lagoon and create a pool filled with 1.5 million gallons of water that was “Fit to drink”. At the time, this was one of the largest pools in the US and was one of the first filtered swimming pools in the west. That brings us up to the 1940’s and in 1942, the park closes for three years during World War Two. 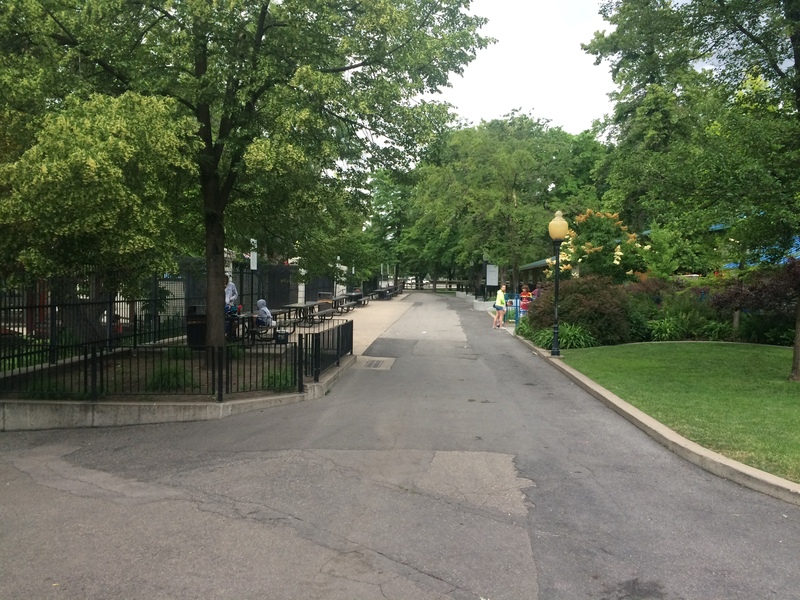 That was a particularly low time for the park because the park was in real bad shape and the Bamberger family even considered razing the park entirely. 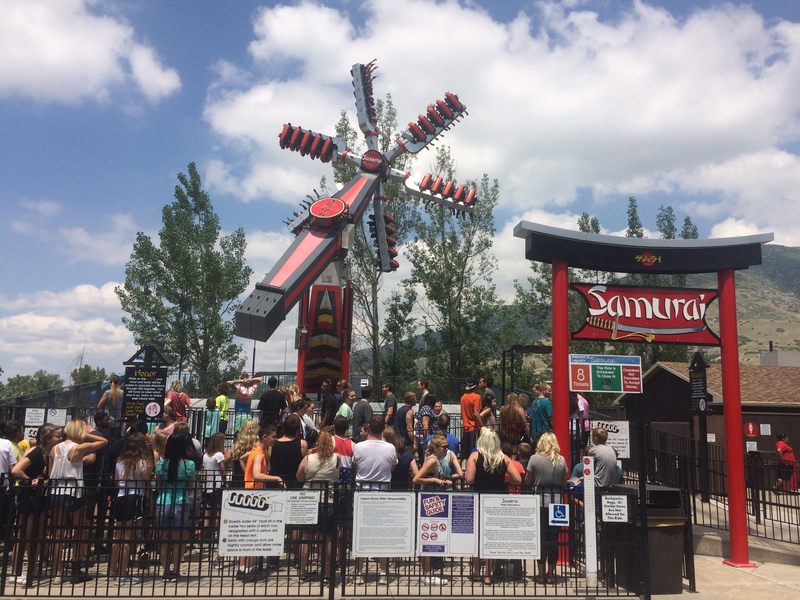 Then Ranch S. Kimball and Robert E. Freed decided to lease the park from the Bamberger family and then created their own company called the Utah Amusement Co and it has been successful ever since then and the Freed Family eventually bought the park from the Bambergers in 1983. 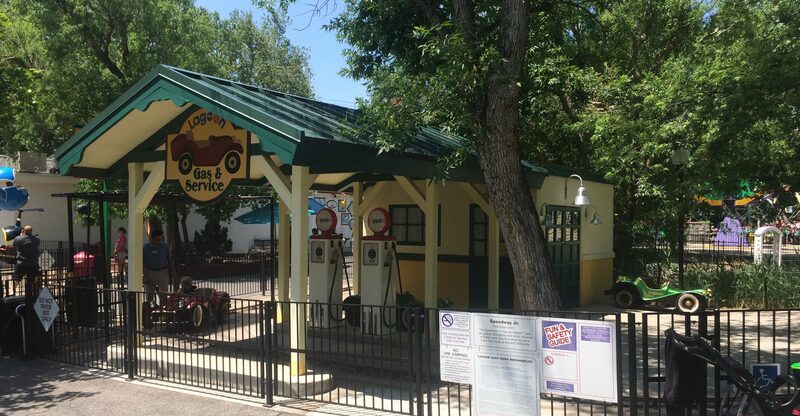 Unfortunately, when the Utah Amusement Co took over the park, there was a town ordinance that prevented African-Americans from using the swimming pool and ballroom but the Freed family worked with the town to get rid of that ordinance and it finally happened in the 1940’s. In November of 1953 a devastating fire destroyed the midway and the front half of the roller coaster and everything that was damaged was rebuilt, replaced, or repaired in time for the 1954 season. Lagoon was gaining in popularity at this point and would soon be more popular than the SaltAir resort which ended up closing in November of 1970. 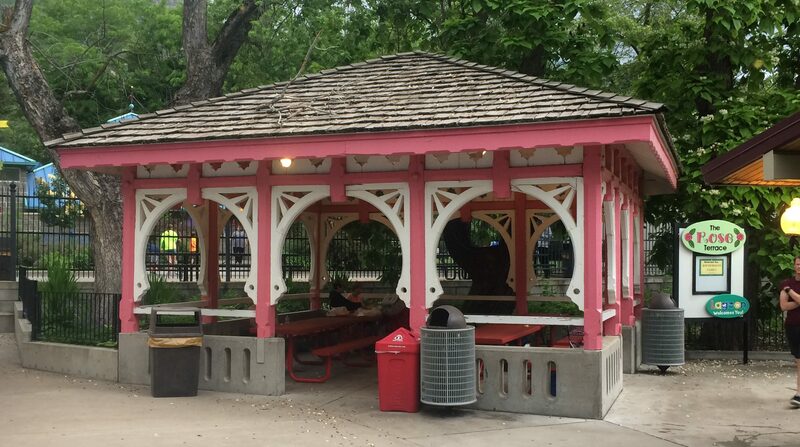 There are still pieces of history inside the park like this picnic shelter called the Rose Terrace. 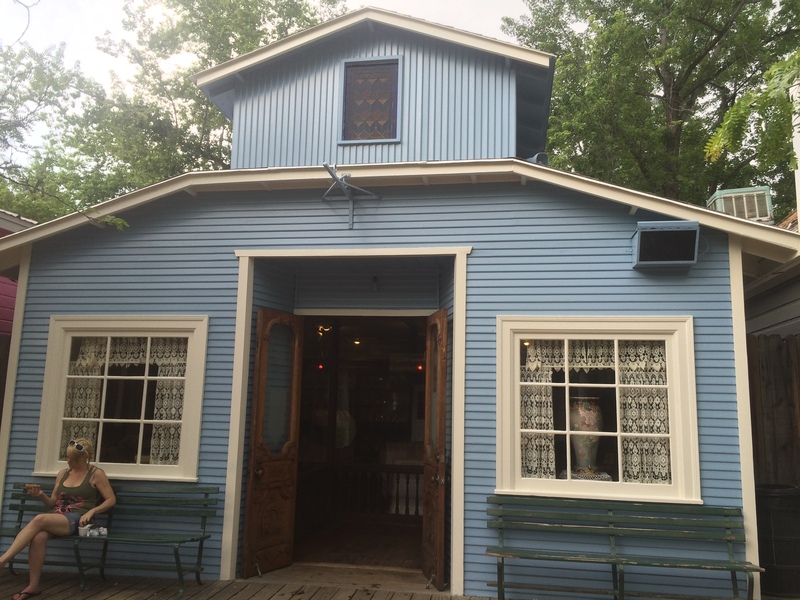 The Rose Terrace used to be the cupola on top of the original train station that operated at the old Lake Park. 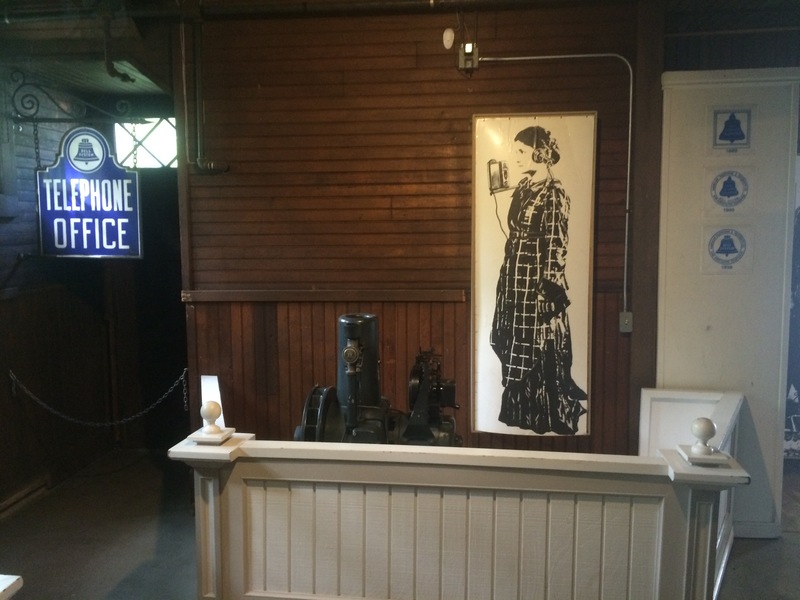 That station was dismantled and moved to the park where the Maple Terrace sits now. Below is an image of the original station with its cupola that is now the Rose Terrace. 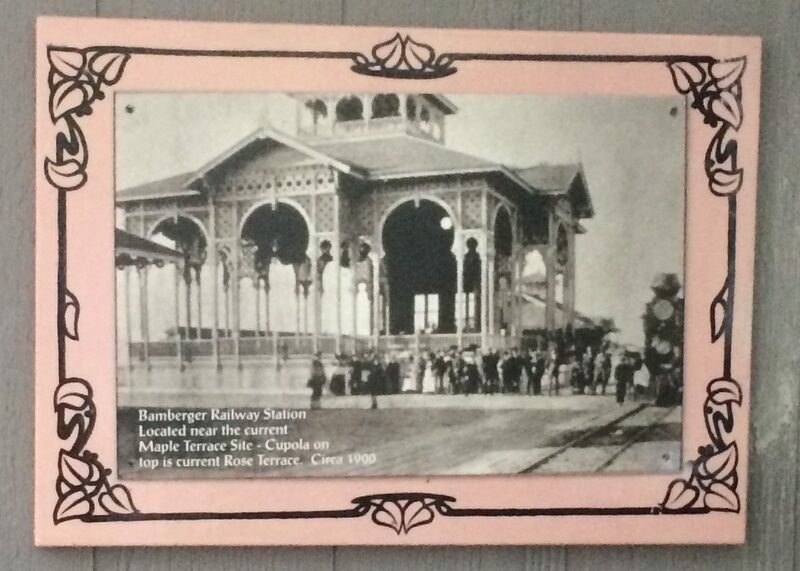 Here are some photos of what I believe was the original location of the Bamberger train tracks which marked the eastern boundary of the park at one point. 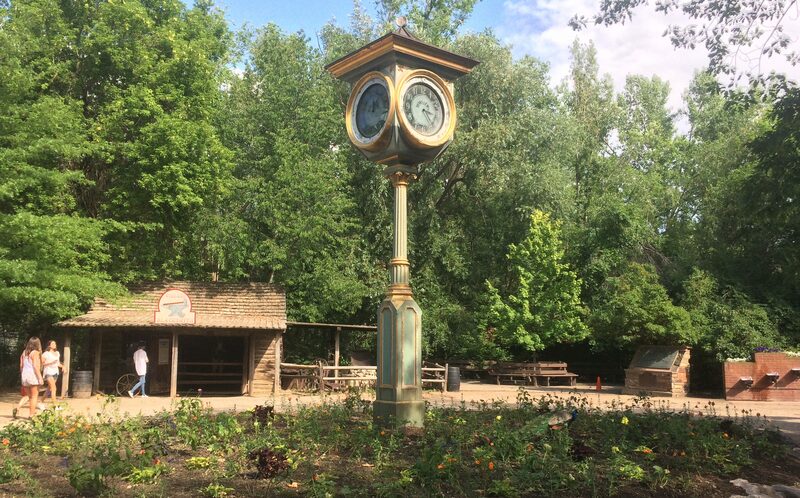 The photos start in the southern end of the park near the Pioneer Village and end at the northern end of the park. It should be noted that Atari (the original home game console) founder Nolan Bushnell worked at Lagoon Park managing the midway games while earning his Electrical Engineering Degree at the University of Utah. Now let’s go in, now that you have a basic understanding of the history of the park. 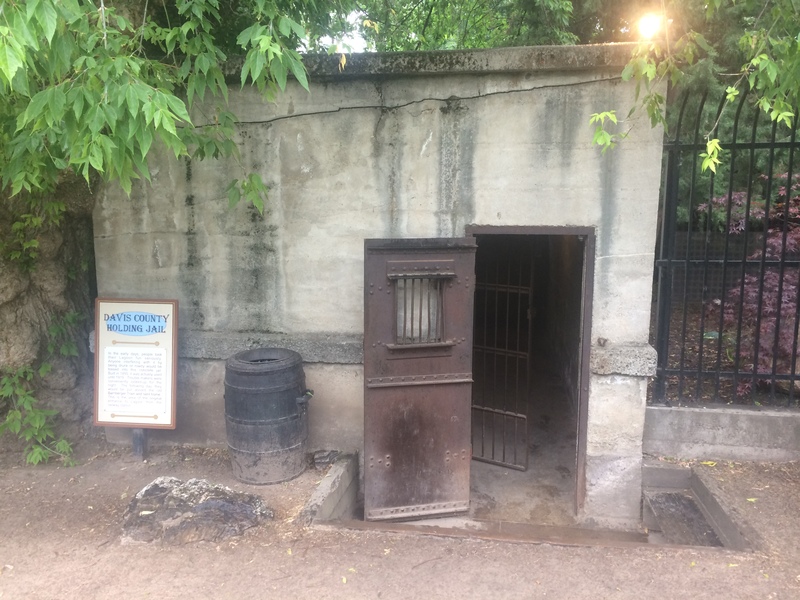 Before you enter the park, I should let you know that the park doesn’t have any kennel facilities but it appears that they do let dogs in with the caveat that they must always be on a leash and that they be good mannered. They (dogs) cannot be brought on any rides for the obvious reasons. There are also several different ticket options so check with the park to see what best fits your needs. They also sell a season pass for parking as well so it would be a good idea to buy if you intend on going more than five times in a year as parking was $10 per vehicle per day when I was there. 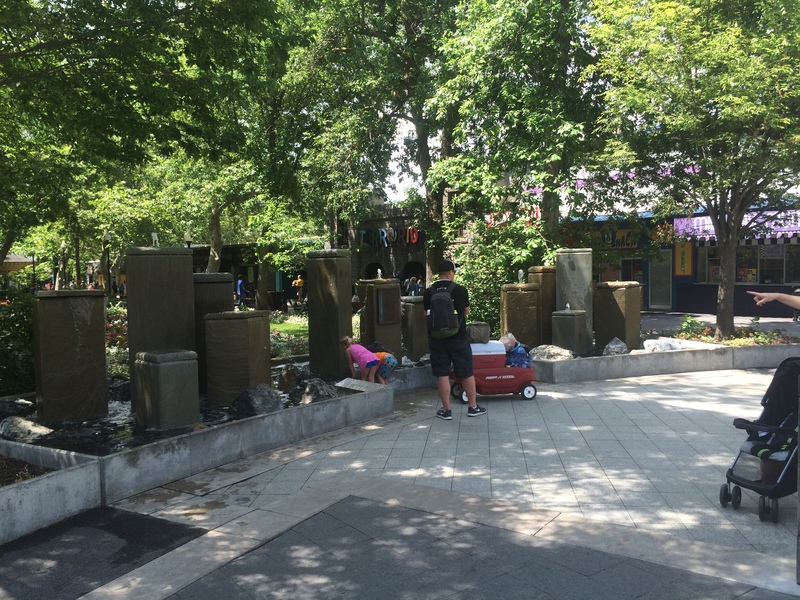 The park also lets you bring in food as there are several picnic groves in the park. You can also rent a table or a picnic pavilion for the day. Smoking is prohibited throughout the park with the exceptions being these smoking areas. Once you’ve bought your ticket, you’ll need to go through the main gate and get your hand stamped and then your off to the races. 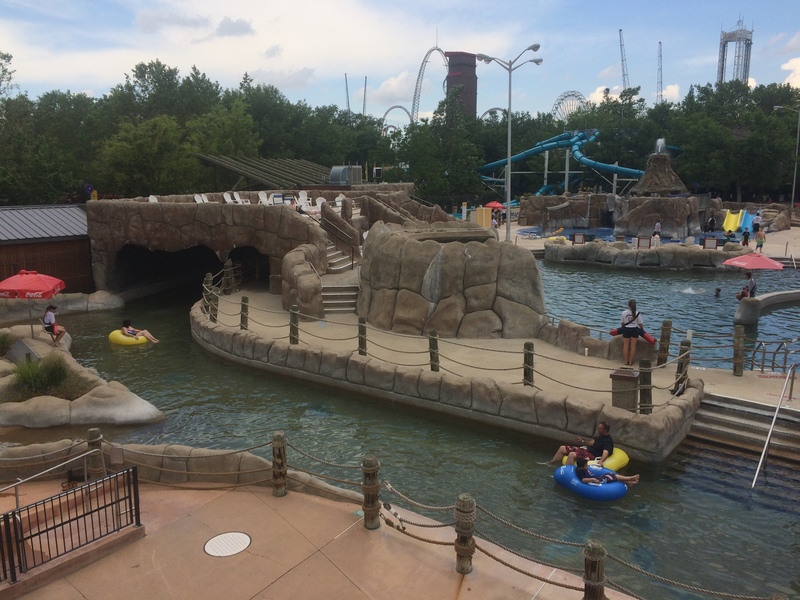 Lagoon basically has four areas which are the Midway, Pioneer Village, Kiddyland, and X-Venture (an area that has attractions that cost extra). 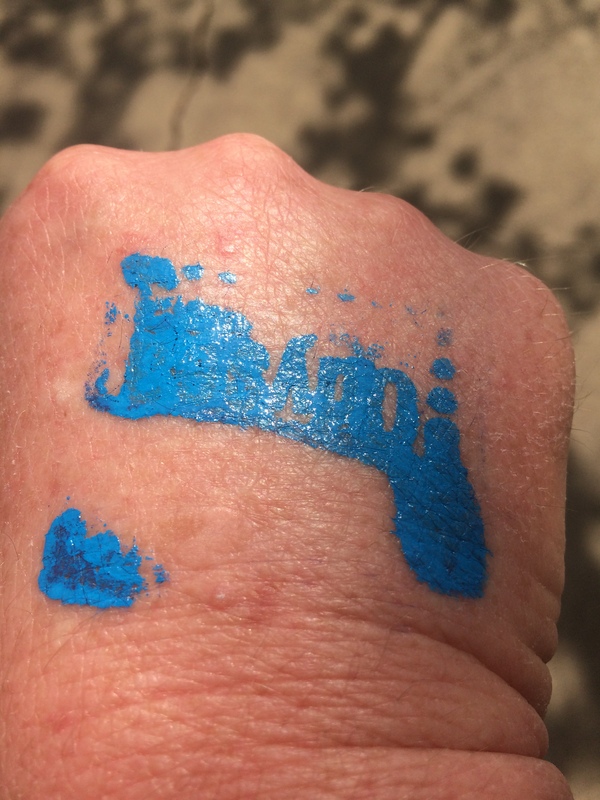 DO NOT rub it off as you’ll need to show it at the entrance to the rides. 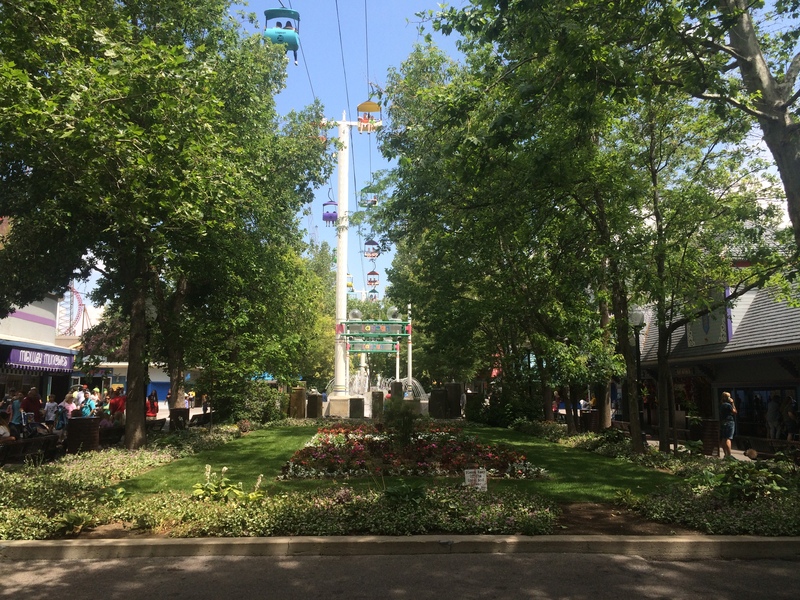 Our first area called the Midway, this will also be the last area of the park as the entrance to the park is in the middle of the Midway. 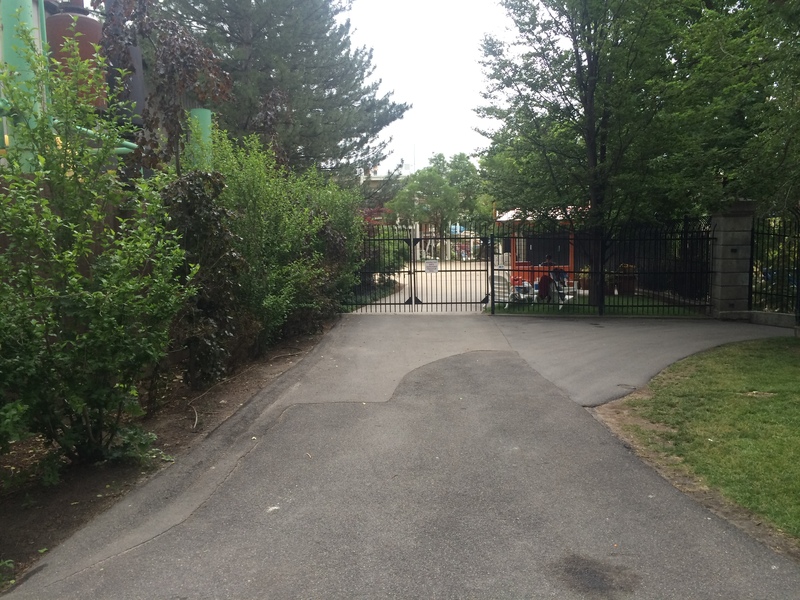 The area immediately past the gates contain large family locker rentals, first aid, information, an ATM machine, and stroller/wagon/wheelchair rental and lost & found. 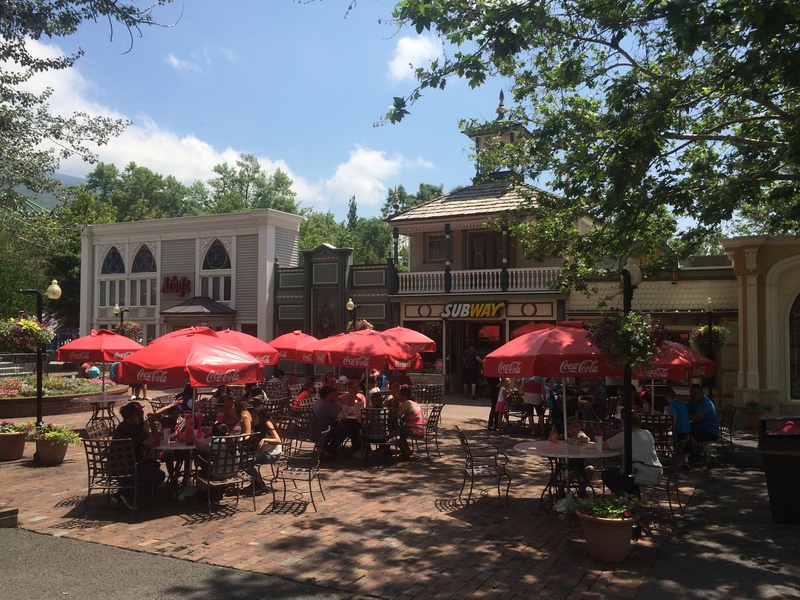 There are several food and drink stands located throughout the park but there are no indoor restaurants with the exception of the Subway and Arby’s restaurants that are in the northern part of the Midway and Pioneer Village areas. 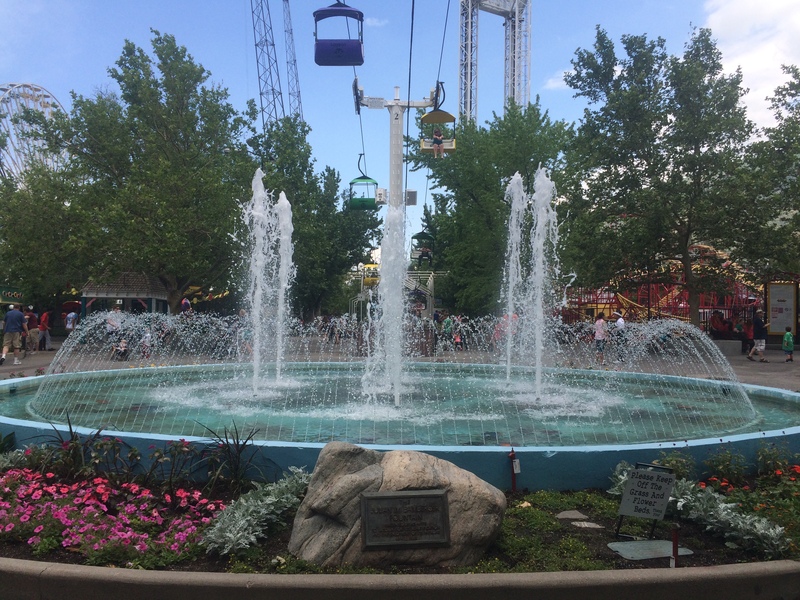 Now we come to the main Midway where the Midway fountain is located. 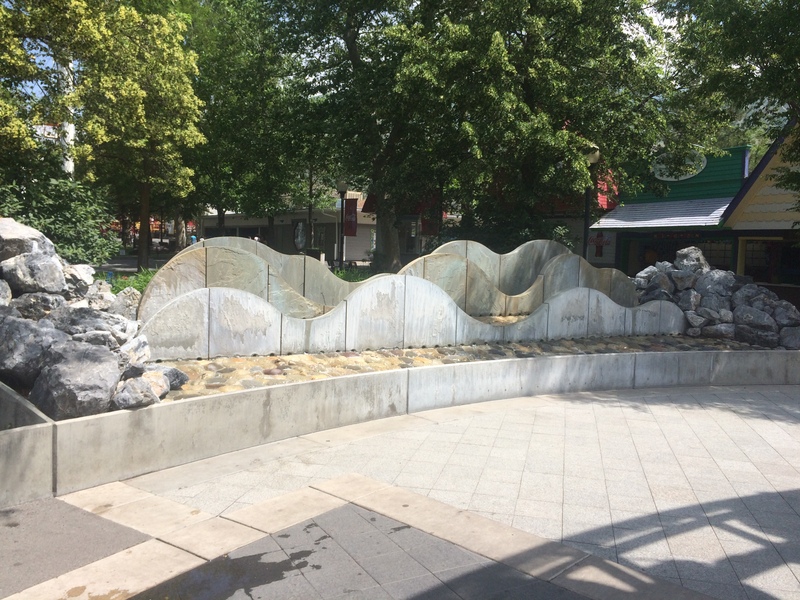 This fountain is flanked by four other fountains. 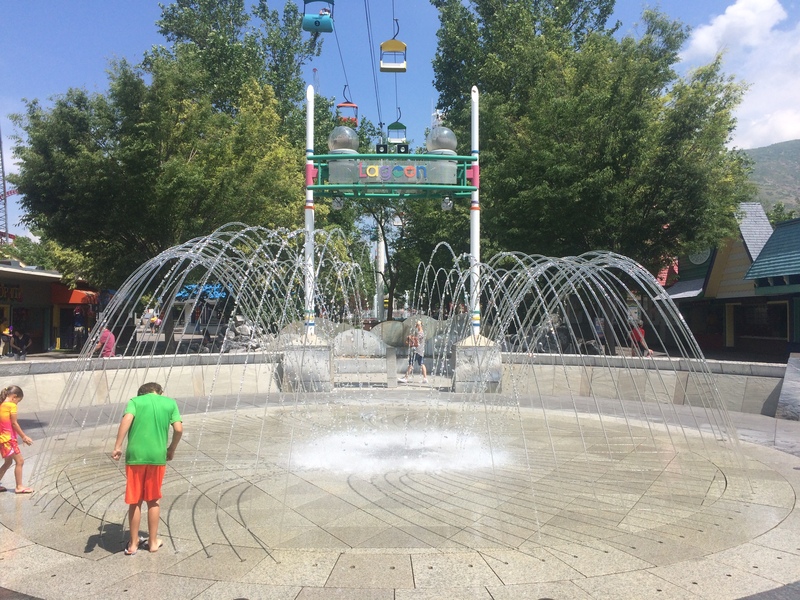 One of those fountains is a moveable marble sphere that can turn in any direction. 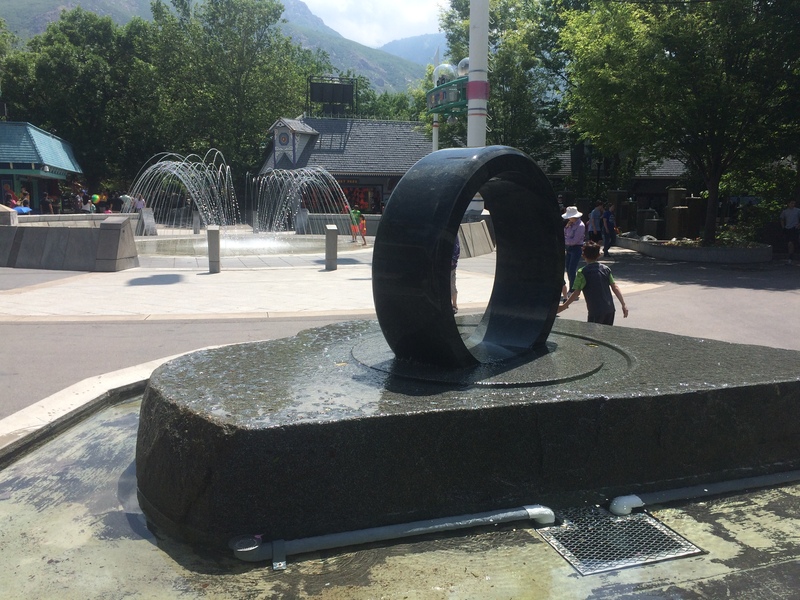 There is another fountain that is a rotating marble circle that rotates in all directions as well. 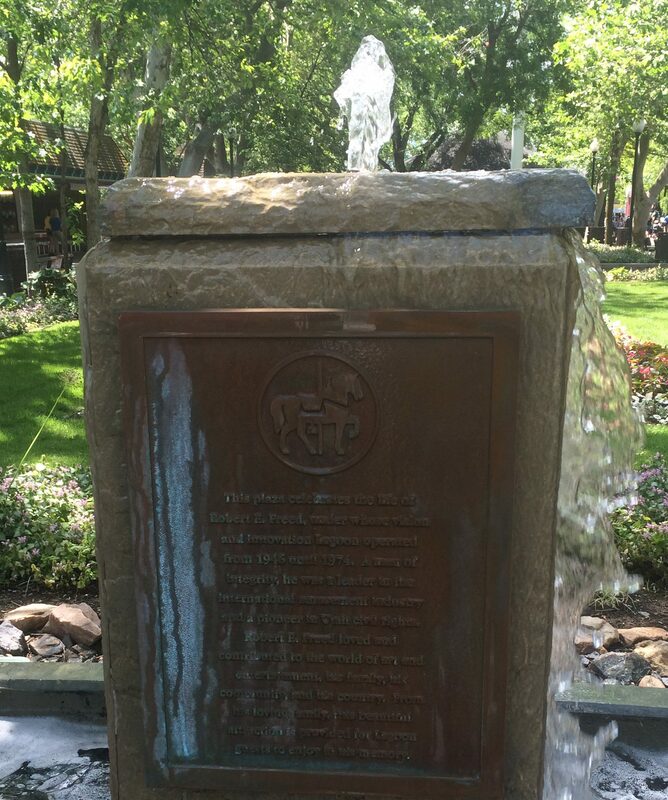 The other two fountains are more decorative with one of them having a dedication plaque. Now we’re at a point where we can turn left and go to the northern part of the Midway, go straight into Kiddyland, or turn right and head towards the southern part of the Midway. So lets turn right and go south. 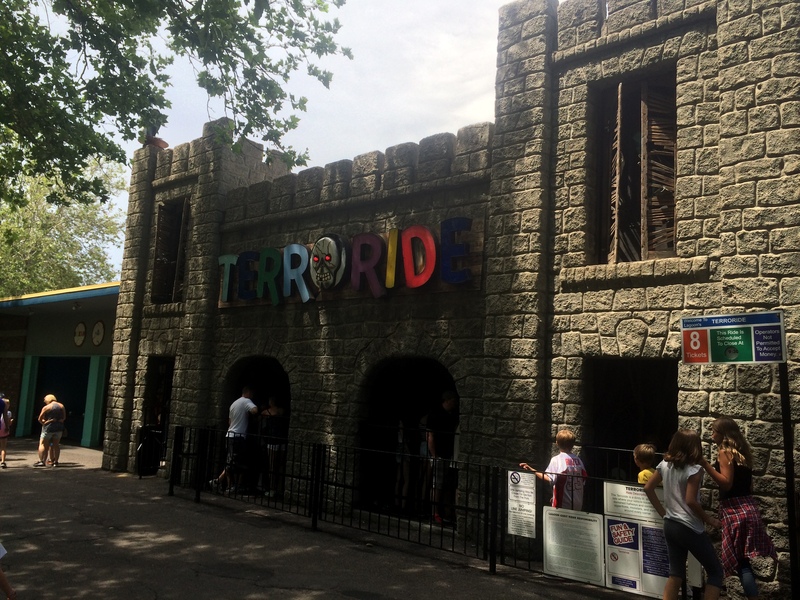 The first attraction on our right is a classic dark ride from Bill Tracy called the Terroride. 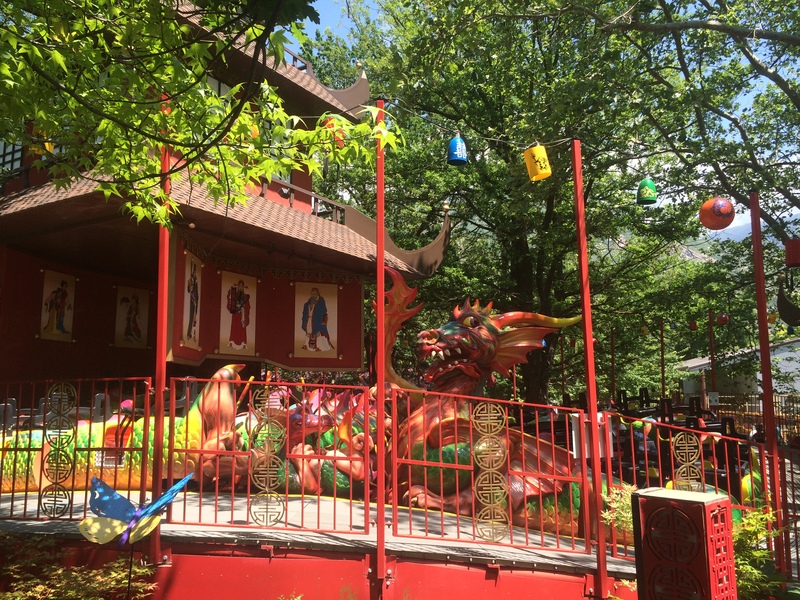 This ride was built in 1964 by Bill Tracy who was a famed dark ride builder in the 1960’s and 70’s. 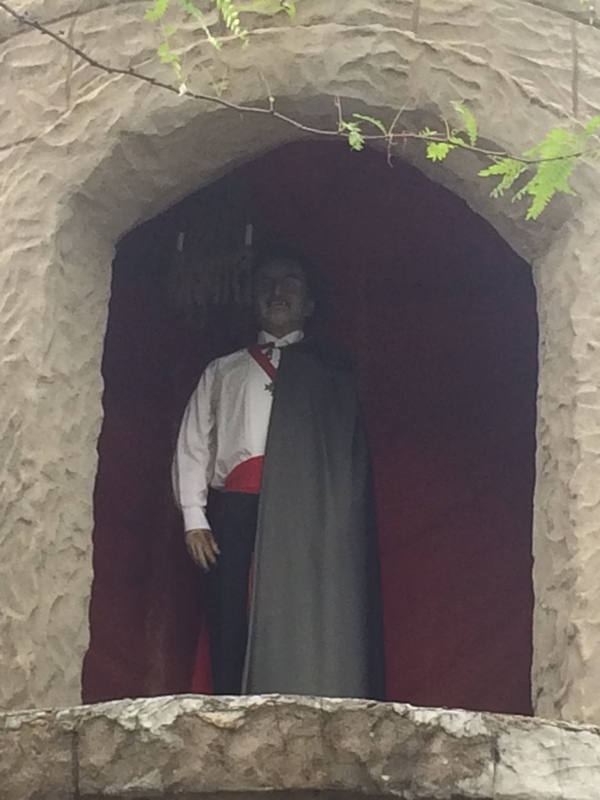 His rides are a bit on the scary side as he had an eye for the macabre so it may not be suitable for those that scare easily. There are only eight of these classic dark rides from Bill Tracy and Lagoon has two of them. The other one will be talked about towards the end of this review. I though this ride was really fun and a bit nostalgic at the same time. Here’s my on-ride video from my YouTube channel. Next up is e parks gift and souvenir shop where you can buy just about anything with the Lagoon’s rides and logos on them. 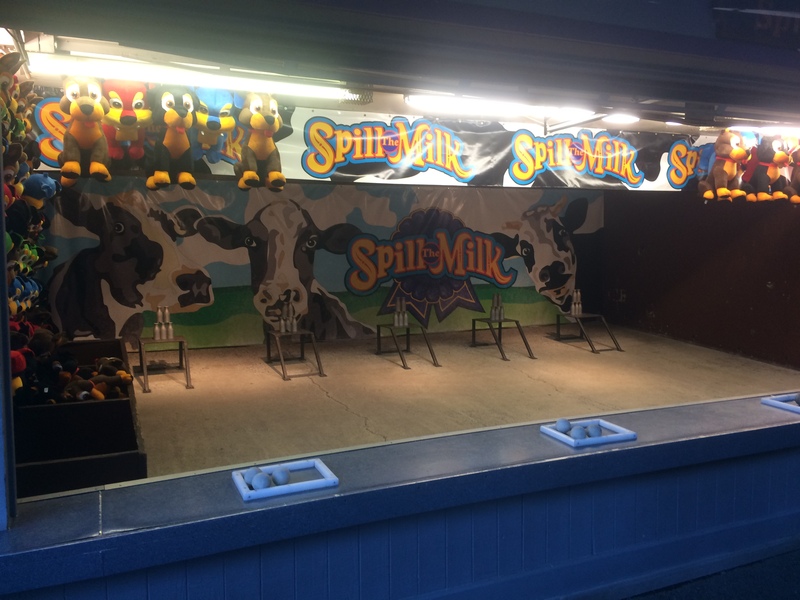 Then there’s a classic old midway game called “Spill the Milk” it is one of the few, original Spill the Milk games that uses their original metal milk bottles. Next up is one of the parks jewels. 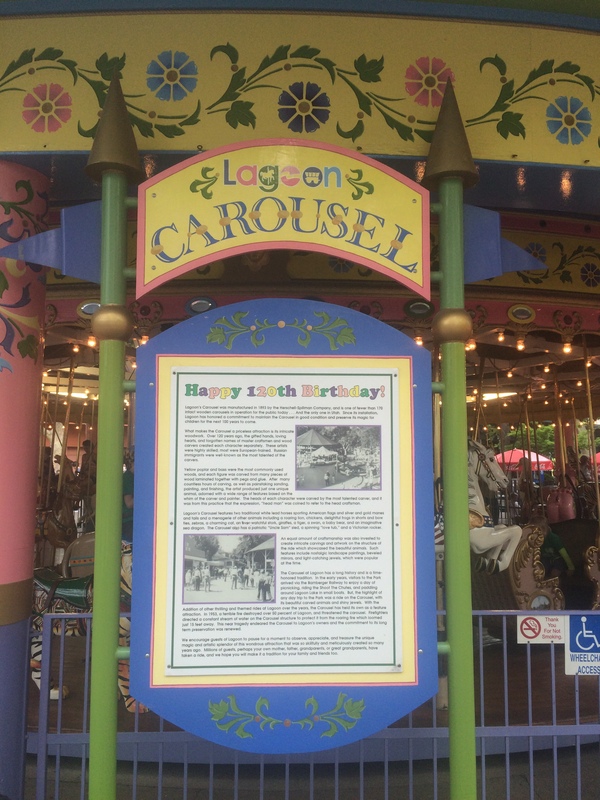 This classic carousel has a nice long history that began before it came to Lagoon. 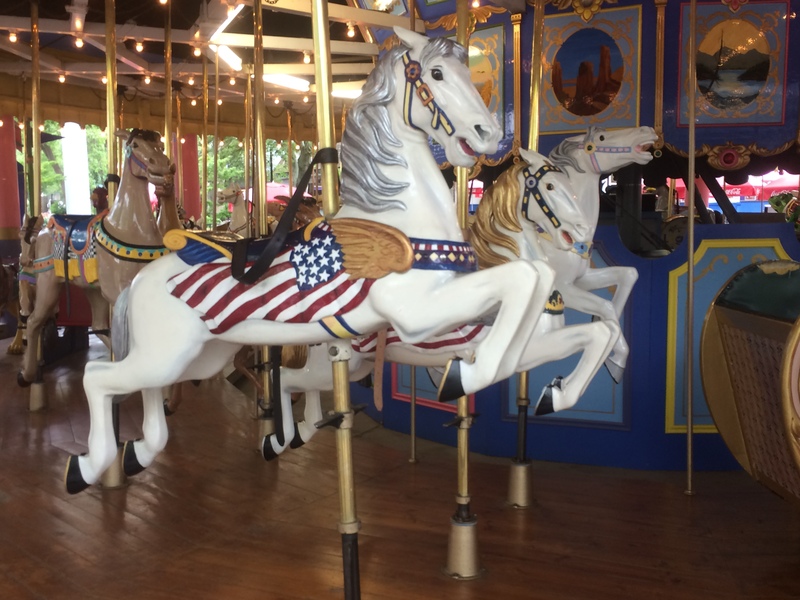 Unfortunately, it is not know where this carousel first operated but what is known is that it was built by the Herschell-Spillman Co and was added to the park in 1906. 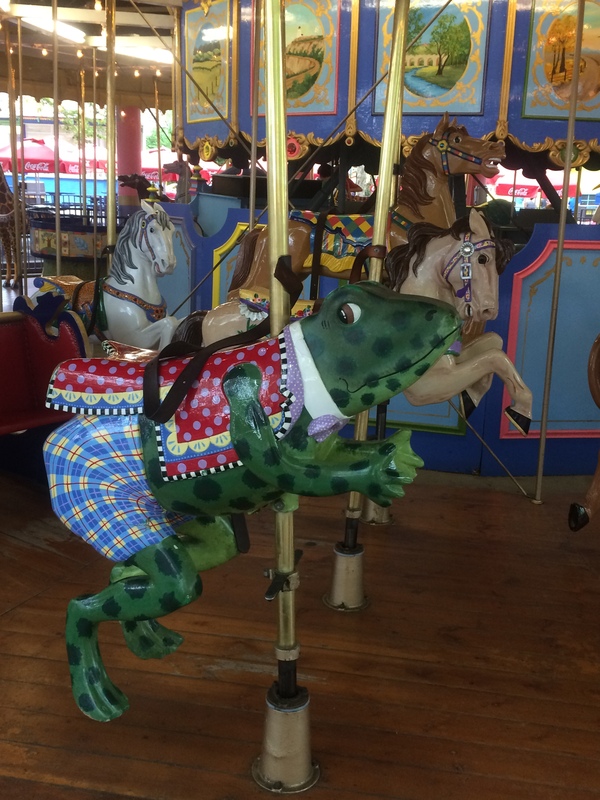 This carousel was almost consumed by the fire in 1953 if it were not for the fire departments constantly pouring water on it to keep it from burning. 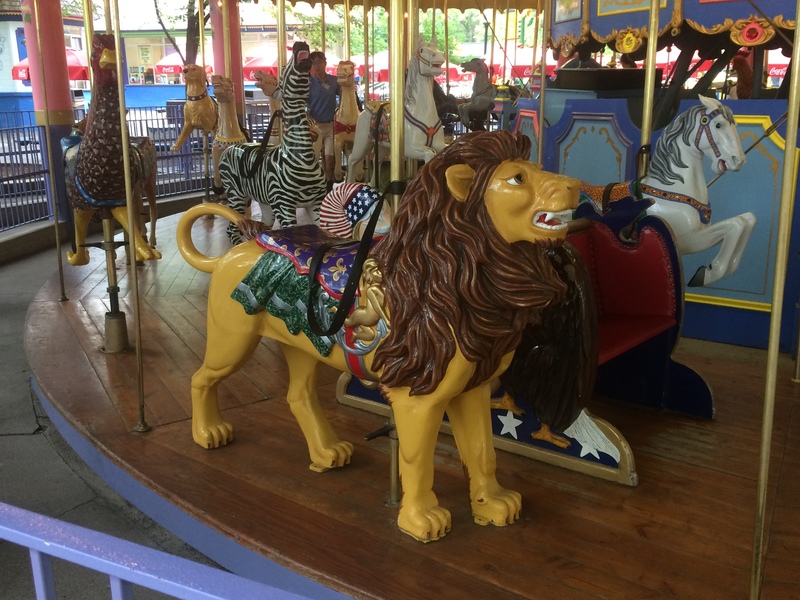 This is a menagerie carousel because it contains more than just horses. 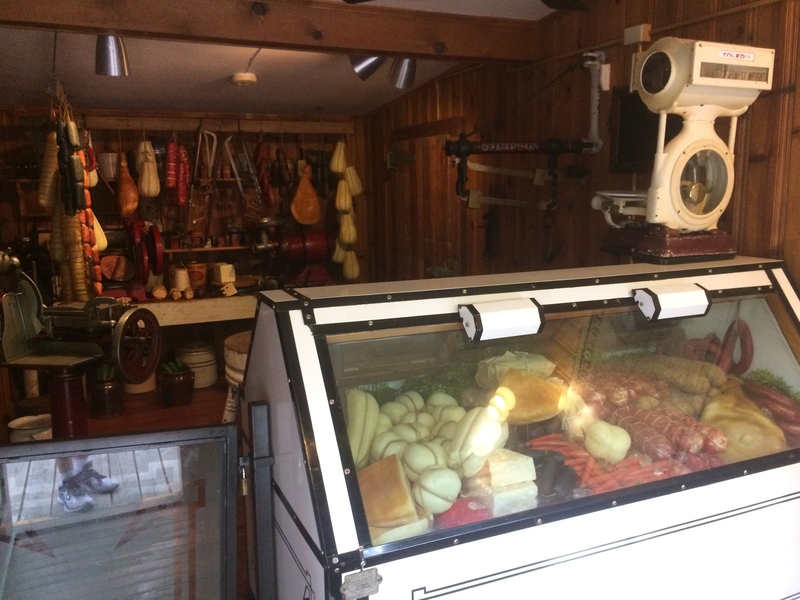 This machine contains 27 jumping animals, 2 standing animals, and 19 menagerie animals with 1 llama, 1 cat, 1 deer, 1 dog, 1 dragon, 2 giraffes, 2 frogs, 1 lion, 1 goat, 2 mules, 1 pig, 1 stork, 1 tiger, 2 zebras, 2 roosters, 1 kids swan, and 1 kids bear. There are 2 chariots with one of them being an Uncle Sam chariot and the other a rocking chariot. 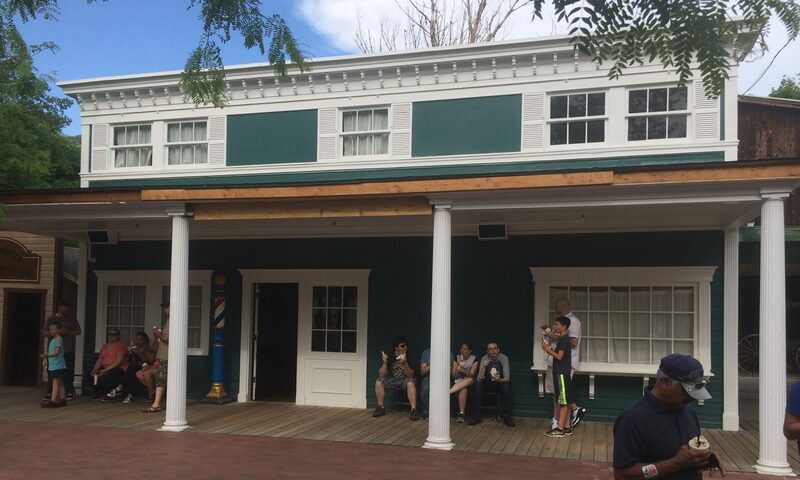 They added one “Lover’s Tub” that spins for the parks 100th anniversary in 1987. 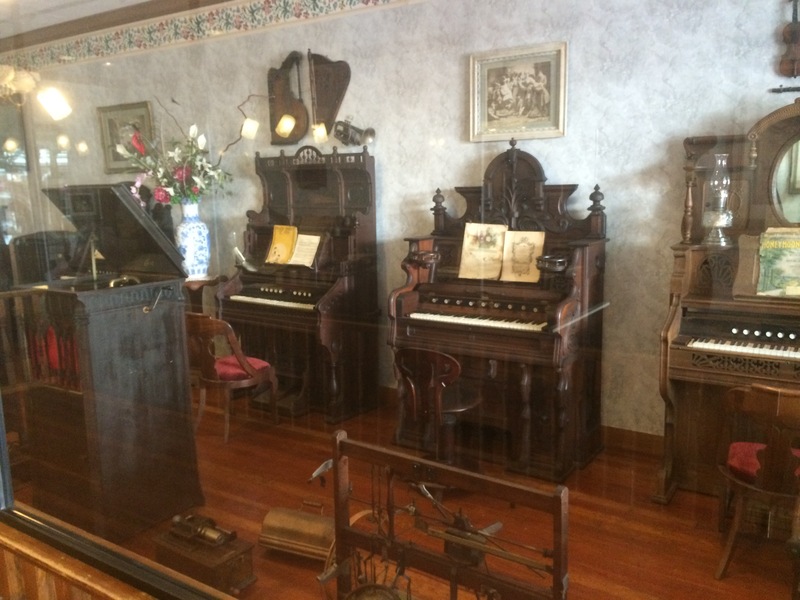 There is a band organ there but it is not functioning and likely will never operate. 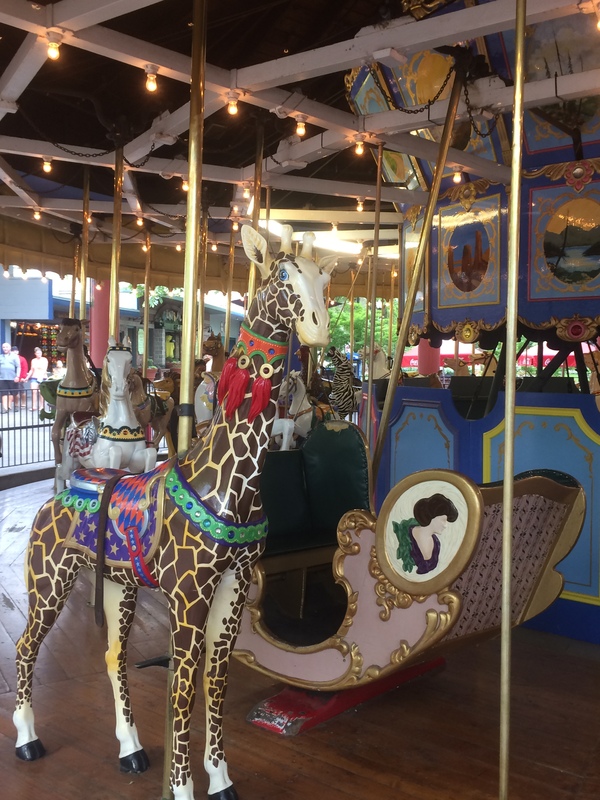 Here is my off ride video of this beautiful carousel. Next up is a classic coaster. This coaster is actually quite old as it opened here in 1921. 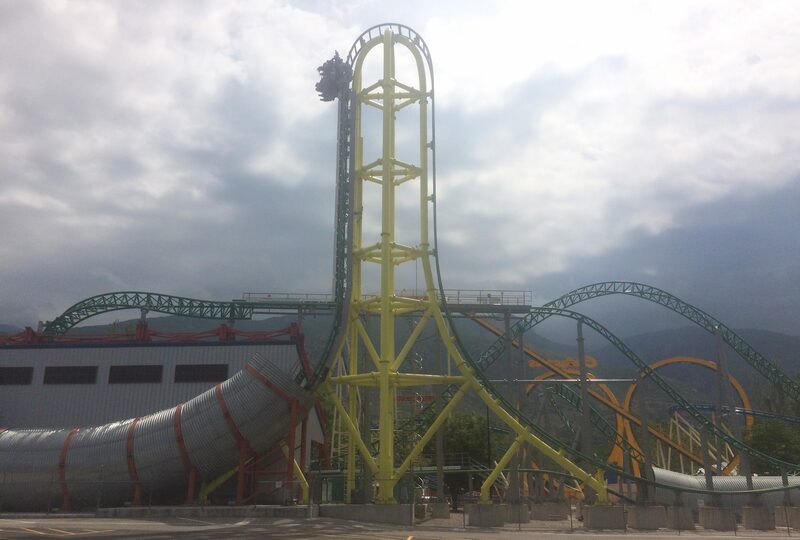 It is a double out and back coaster meaning that it goes out to a point then it turns around and comes back, and then goes back out and turns round before coming back into the station. 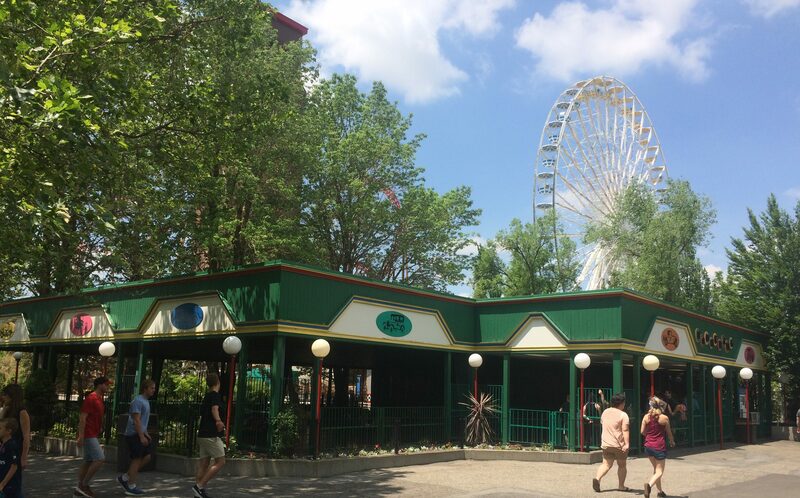 It originally opened as the Pippin Dips back in 1921 and has since changed names a few times operating as the Lagoon Dips, Giant Coaster, Silver Coaster, and then Roller Coaster but that isn’t the end of its history. 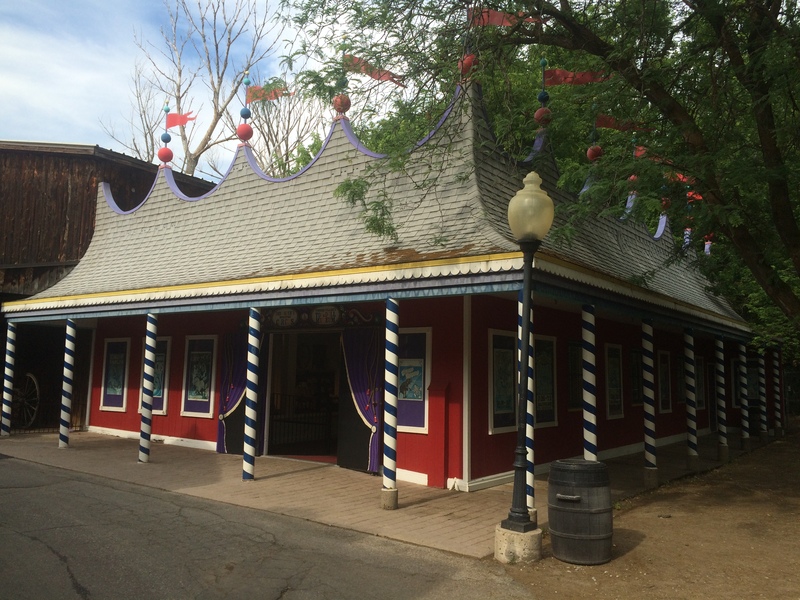 It was also damaged by a fire in 1953 that started in the old dance pavilion that was on the north end of the midway. That fire consumed the western half of the midway and the station and lift hill of the Roller Coaster. The locals still call it the White Coaster most likely due to the fact that the Roller Coaster was painted white until the early 2000’s. 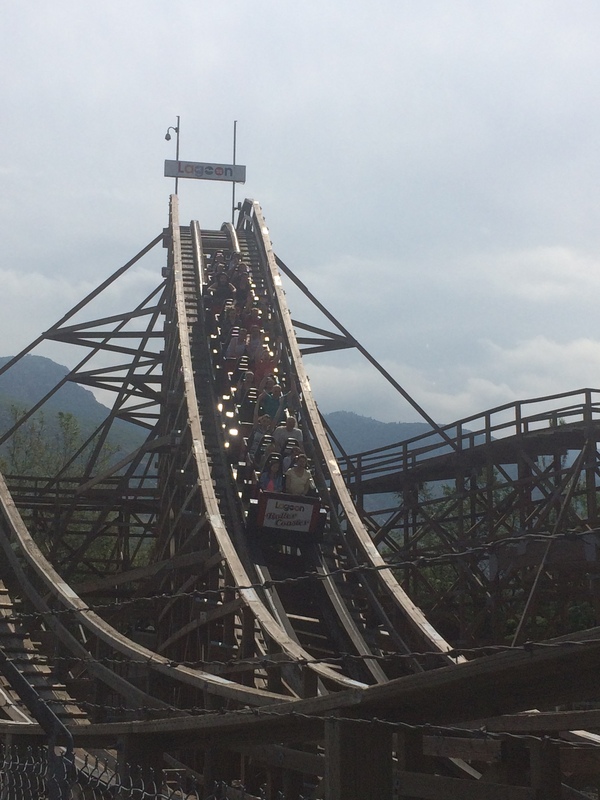 The reason the early wooden coasters were painted was because they were built before pressure treated wood was used and painting the coaster was quite effective in protecting the untreated wood and white was most commonly used as it was the least expensive color to buy. This coaster isn’t a rough as you might think it is which is a testament to the park on how well they maintain this old lady. This is actually one of the smoothest wooden coasters I’ve been on and it is completely re-ridable. 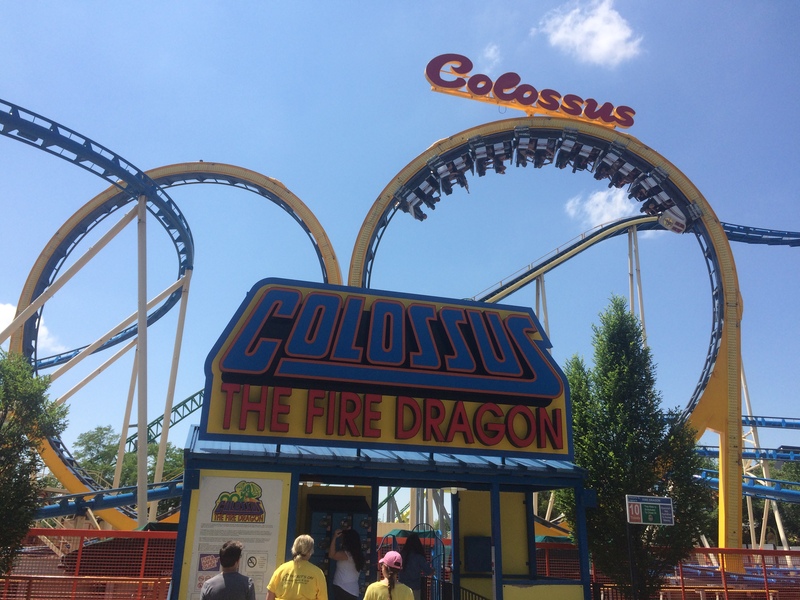 This coaster was designed by the famous John A Miller and built by the Colorado Construction Co. Miller was from the New York firm of Miller & Baker, the same firm that designed the famous Coney Island Cyclone, only 13 of Miller’s coasters survive to this day. 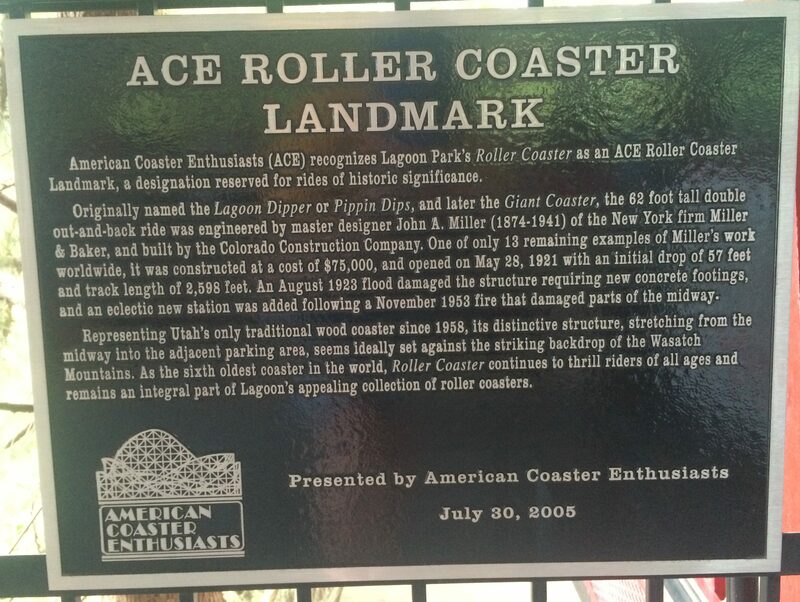 It is because of this history, that ACE (American Coaster Enthusiast), a world-wide club that is dedicated to the enjoyment and preservation of roller coasters around the globe, designated the Roller Coaster as a Coaster Landmark. A plaque was given to Lagoon on July 30, 2005 explaining its historic significance. 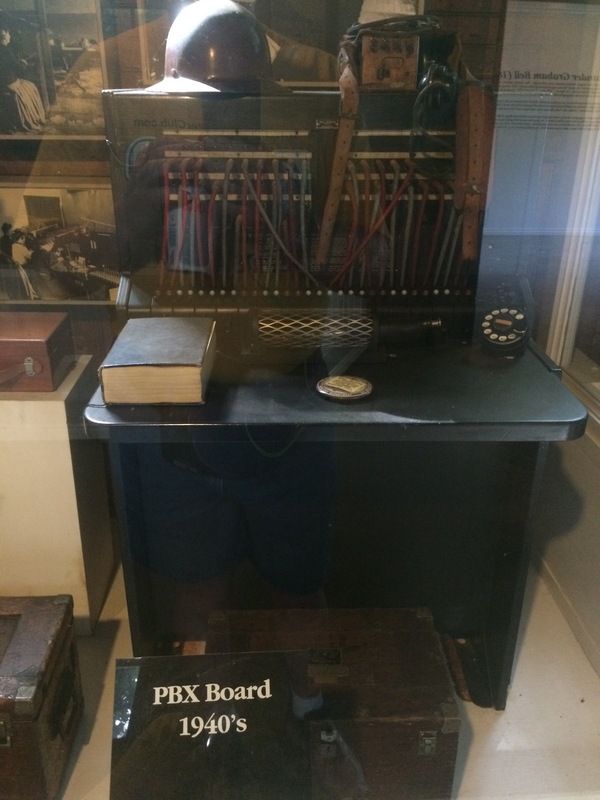 The plaque now sits in the station house near the exit. 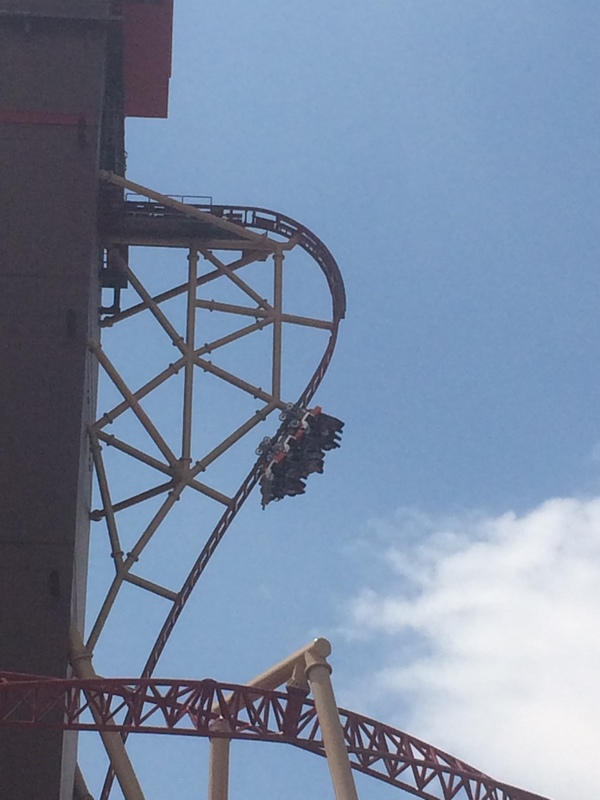 This coaster is 62 feet high, 2,500 feet long, and has a top speed of about 45 mph and I found the front car (first three rows) is the best place to sit on this coaster as riders get a nice pop of airtime on certain hills. As a rule, the park does not allow single riders in the front or back row of this coaster. Here’s an off ride video of the Roller Coaster. Here is an on ride video from CoasterForce’s YouTube channel. Now we’ll sit for a spell and enjoy a stage show at the Carousel Theater. 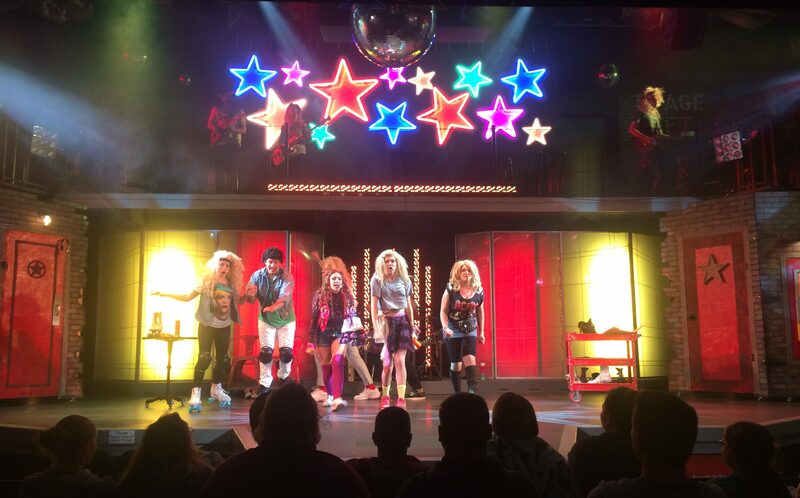 This particular story is set in the 1980’s and features roller skates and hair band music like Bon Jovi, Van Halen, and others so be prepared to be taken back in time. The name of this show is called Anyway you Want it but there are different shows so check the show time listings. Next up is a ride that will truly get you soaked. This is a Top Spin model from Mondial that was installed here in 2001. This ride literally flips riders head over heels during its two-minute ride cycle. 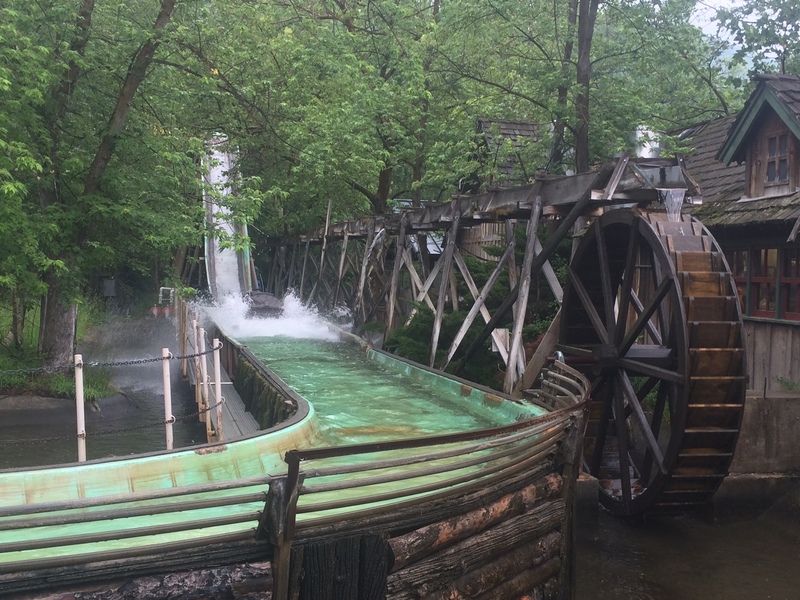 There is an added attraction which gets riders absolutely soaked. The water jets spray water literally into the gondola so I wouldn’t recommend riding if you don’t want to get soaked. Next up is an old classic ride that will have you flipping head over heels. This is a real classic as there are so few of these left today. 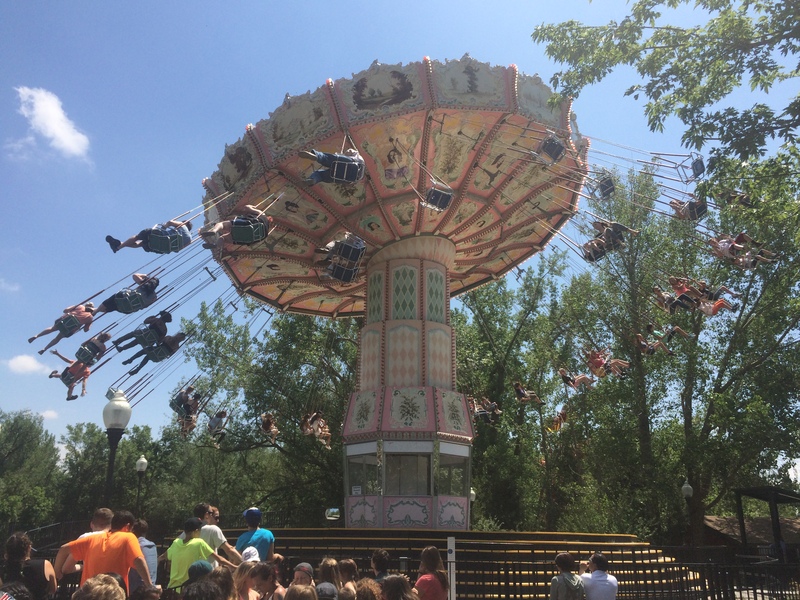 This ride was built by the Eyerly Aircraft company and installed at the park in 1954. 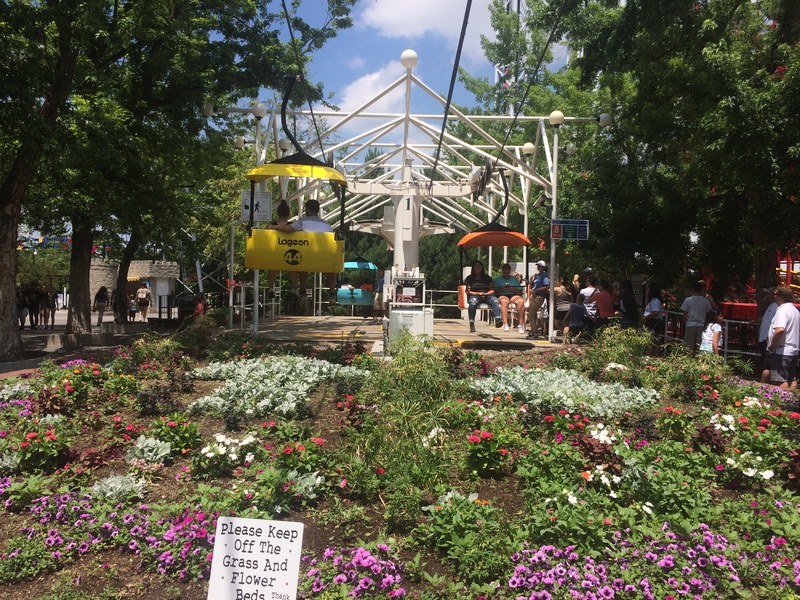 It operates like a Ferris Wheel but allows riders to flip over as many times as they want thanks to a lever inside the gondola that acts as a holding brake for the gondola. Here is my off ride video from my YouTube channel. The next ride will twist and turn you around. This coaster was built by Maurer Sohne and it opened here in 1998 but it wasn’t the first wild mouse coaster at the park. 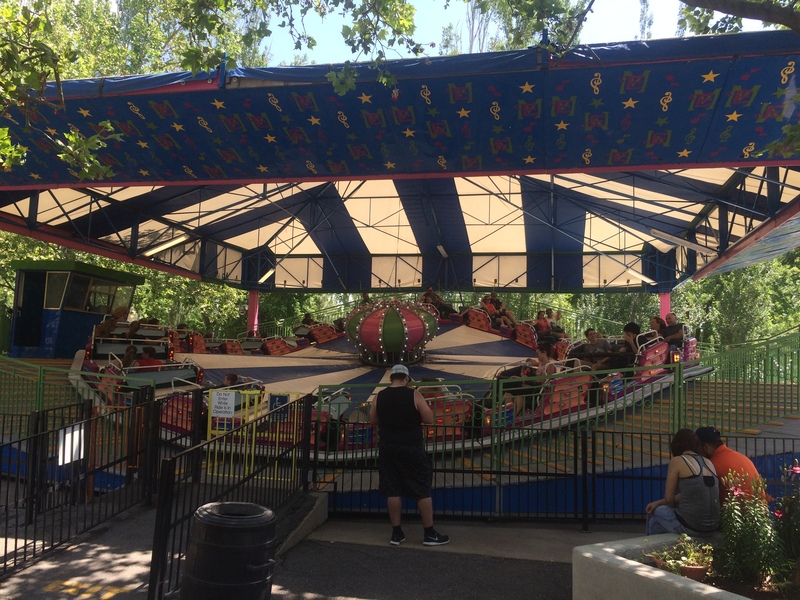 The first Wild Mouse was a wooden one that lasted from 1965 to 1971 on the north midway. Then, in 1973, a steel wild mouse coaster was built and named the New Wilder Mouse. That one lasted until 1989 when it was removed from the park. This one was built on the site of the old New Wilder Mouse coaster in 1998. This coaster, as with all wild mouse coasters, are filled with quick turns and sudden drops so make sure you hold on for this wild ride. 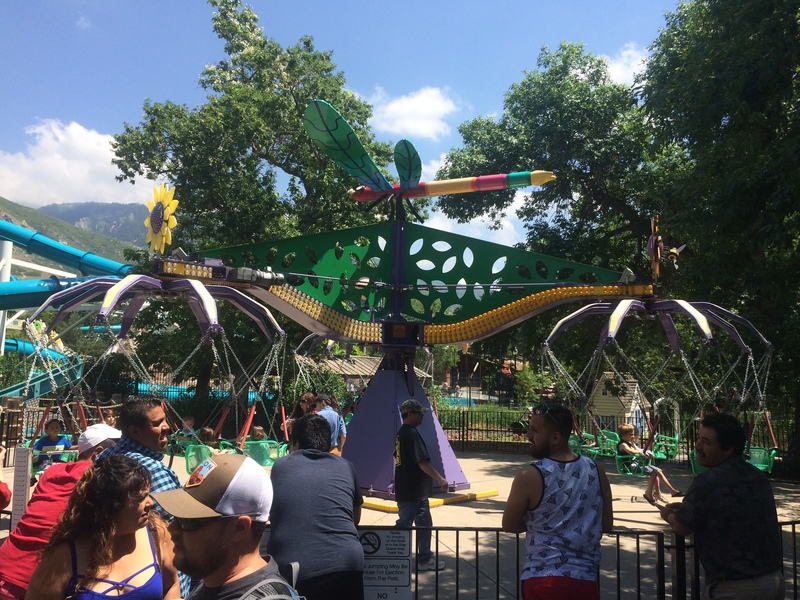 This one is 1,213′ 9″ long, 49′ 3″ tall, has a ride duration of about one minute and ten seconds with a top speed of about 28 mph. Here’s an on ride video from CoasterForce’s YouTube channel. The next coaster will spin you around in a different way. This spinning coaster is a Xtended SC 2000 model coaster from Maurer Sohne which opened here in April of 2003. This one is not like your typical spinning wild mouse coaster and really is quite fun to ride. 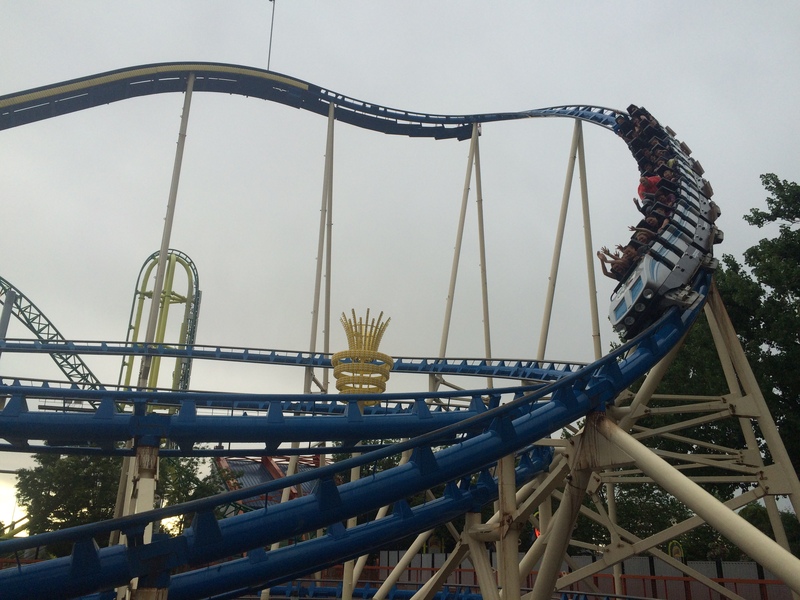 There are two rows that seat two people back to back in each car and, in my opinion, the row on the left as you are boarding the car, is the best row for the simple reason that you are facing backwards as the coaster descends its first drop. The car stays locked in from the station up to the top of the lift hill. 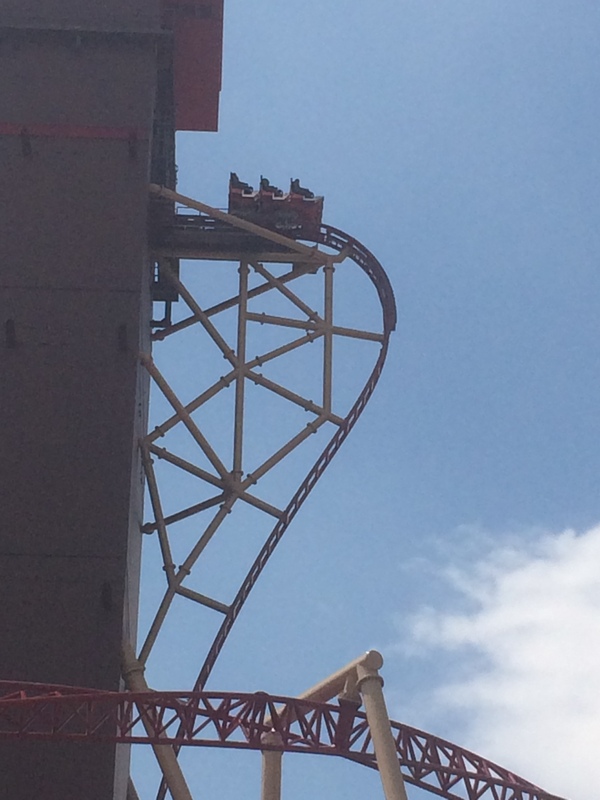 Once the car reaches the top of the lift hill, the spin mechanism is unlocked and the car is free to spin on its own making each ride a unique experience and the spin depends on the weight distribution of the riders. 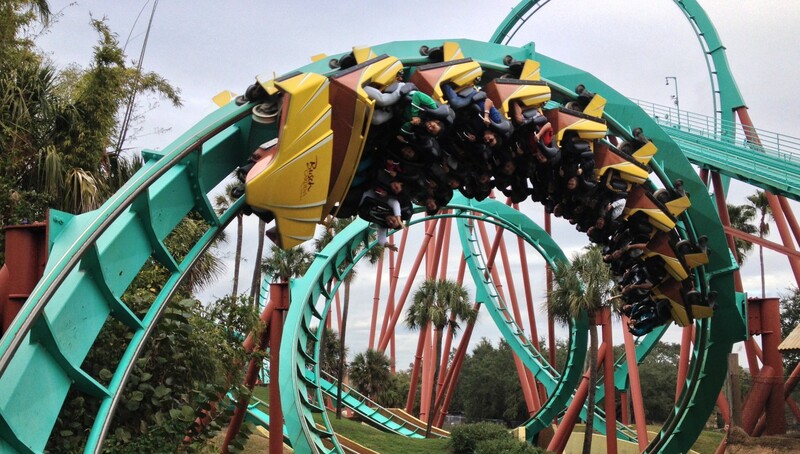 This coaster is 1,391′ 1″ long, 50′ 8″ high, and has a top speed of just over 37 mph. This coaster is quite smooth and really doesn’t jerk you around like the Wild Mouse does. Here’s my off ride video from my YouTube channel. And here is an on ride video from TheThemeParkPOV’s YouTube channel. As you can see, this coaster really is quite fun to ride. Our next ride is quite hot, fire hot in fact. This is one of the few double looping coasters from the Anton Schwarzkopf Co that are still around and the only Double Looping Schwarzkopf coaster left in the US. 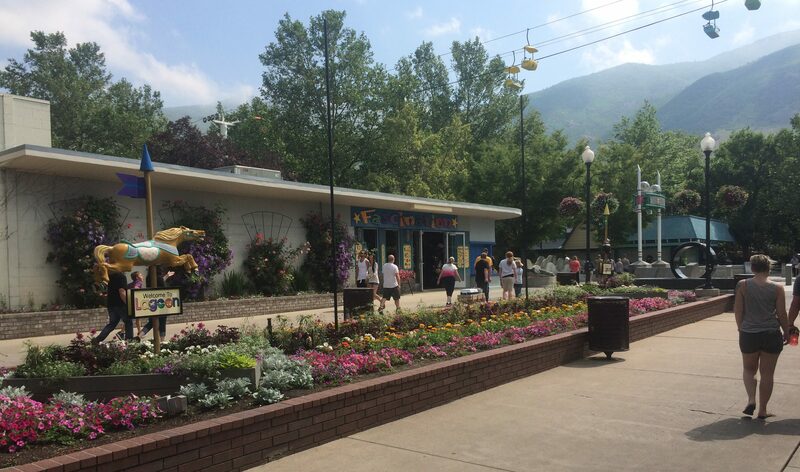 It actually toured with the W. Bruch & R. Robrahn fair company for two years before opening at Lagoon in 1983. This is another fun coaster to ride and pretty smooth as well though I do recommend you ride on the right side of the train as the left turn coming out of the second loop is quite sudden. 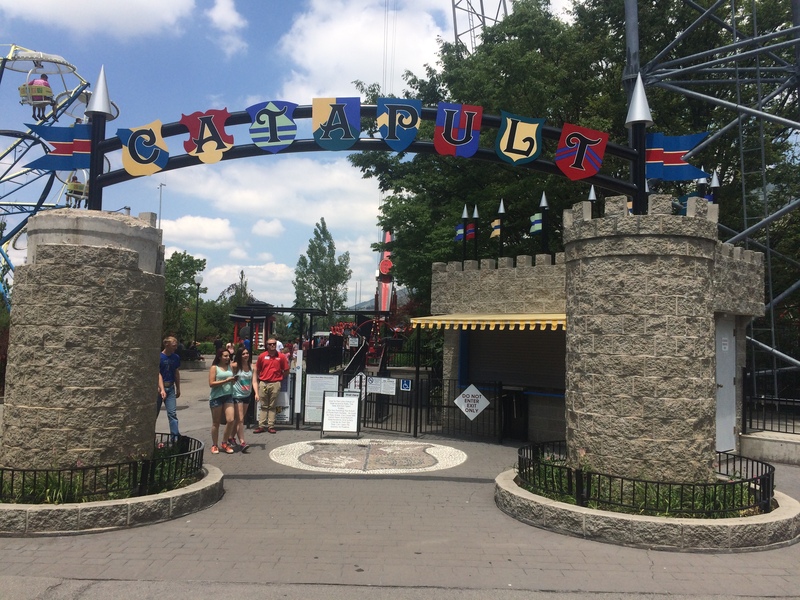 This coaster is 2,296′ 6″ long, 86′ 9″ high, has two inversions, a top speed of just over 49 mph, and a ride time of about one minute and forty-five seconds. Here’s an off ride view from my YouTube Channel. And here’s an on ride view from CoasterForce’s YouTube channel. Next up is the star attraction of the south midway. This is an incredible coaster but it is not for those with weak constitutions. This is a Tower Launch Coaster model from Zierer and so far, it is the only one that was built. 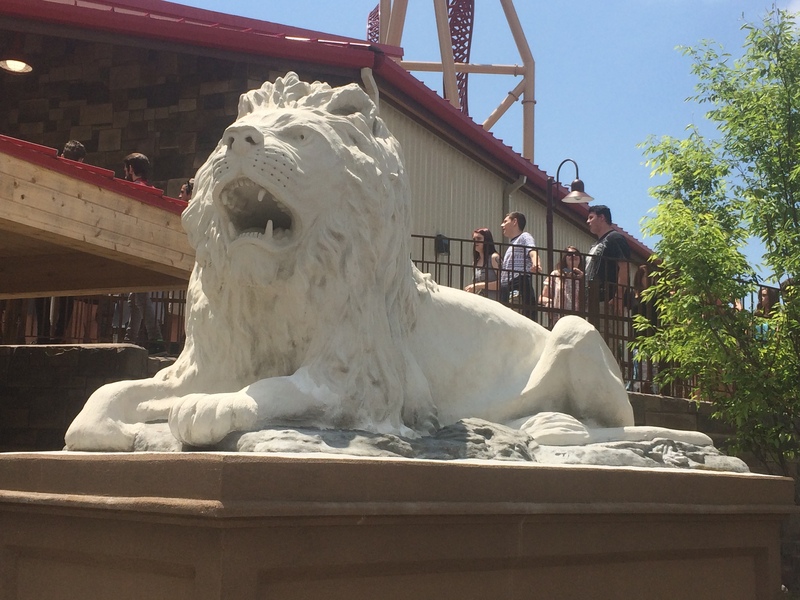 It opened here on June 1, 2007 and has been thrilling riders ever since. Riders are loaded into cars that have two rows with four riders per row for a total of eight riders per car. There are only lap bars on the cars but they are quite snug and they also lock the legs in so riders are quite safe. There also is a single riders line as well. 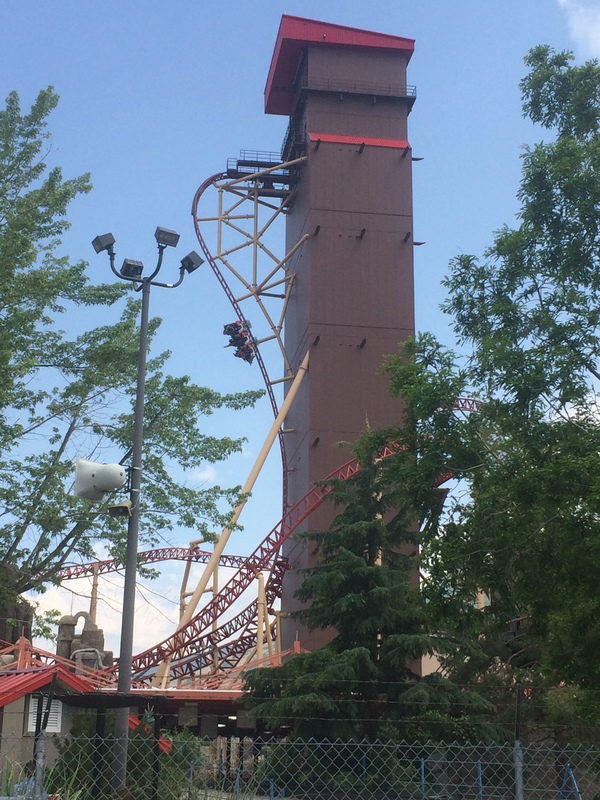 Once the train is dispatched, it goes around a 90 degree turn and then riders are shot up a 110 foot tower via a row of LSM magnets (Linear Synchronous Motors) and then straight down at a top speed of about 55 mph which provides lots of air-time coming down the other side of the tower. Then the train goes through a high-speed overbanked turn, then through a Zero-G Roll, then through an inclined turn and through the MCBR (Mid-Course Brake Run). Then the train dives into a series of dips, turns, and a tunnel before returning to the station and the completion of its 2,050′ 5″ journey. 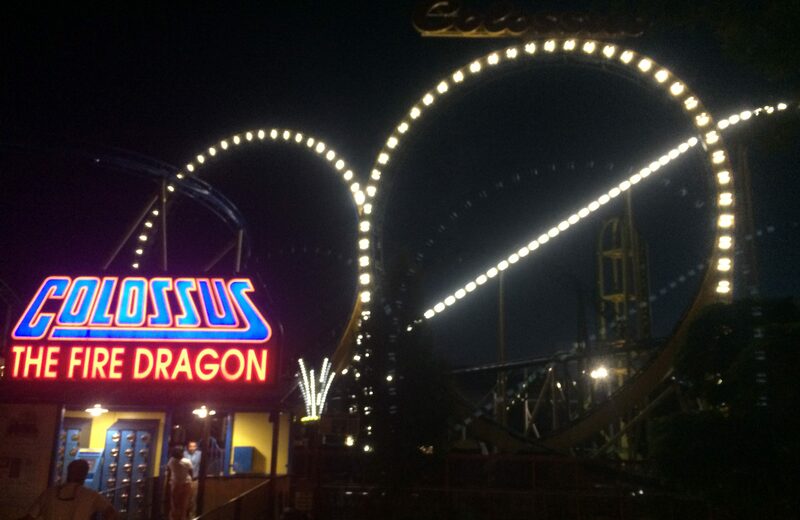 I really enjoyed this coaster and actually rode it several times during my three-day visit to the park. 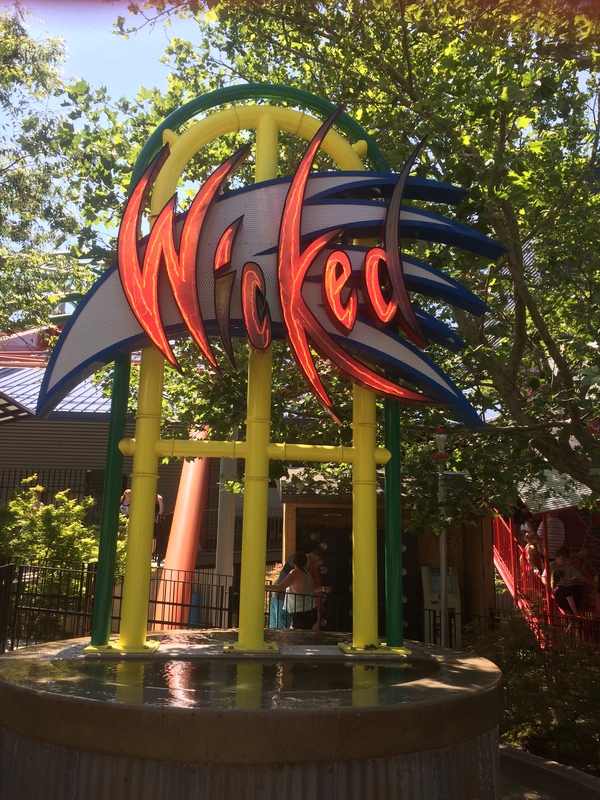 Here’s my off ride video of Wicked from my YouTube channel. The next couple of rides are pretty standard flat rides. This is a standard Musik Express ride from Zamperla that spins forward, then backward. This ride was installed here in 1982. 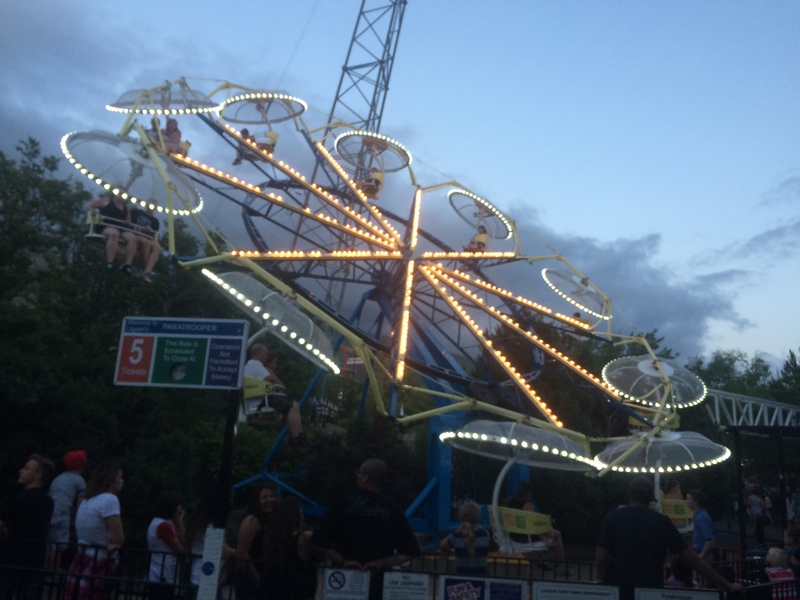 This ride is an Enterprise model from HUSS Mfg and was installed here in 1987. The ride basically starts off with 20 gondolas around the edge of a disc with up to two riders seated in each gondola. 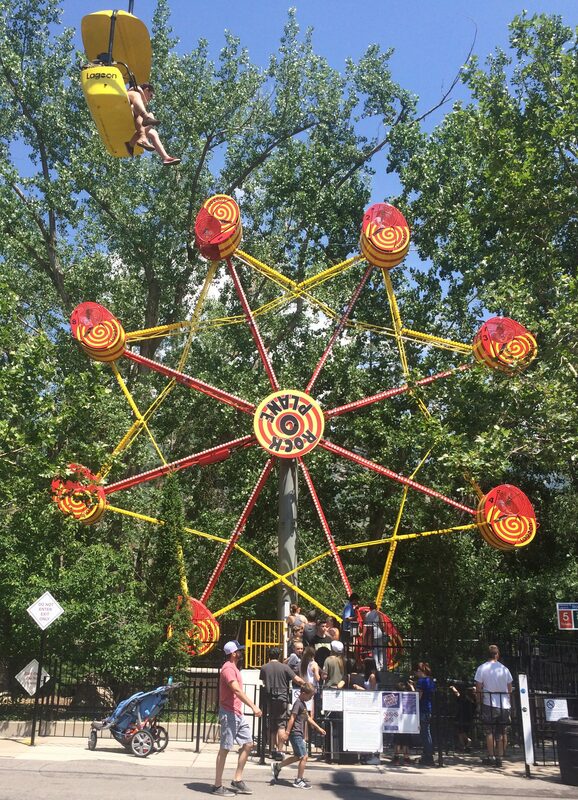 The ride then begins to spin once the riders are lock safely in their gondola and then the disc rises until it is almost at a 90 degree angle to the ground. Then the ride slowly retreats back to its starting position. Here is my off ride video from my YouTube channel. 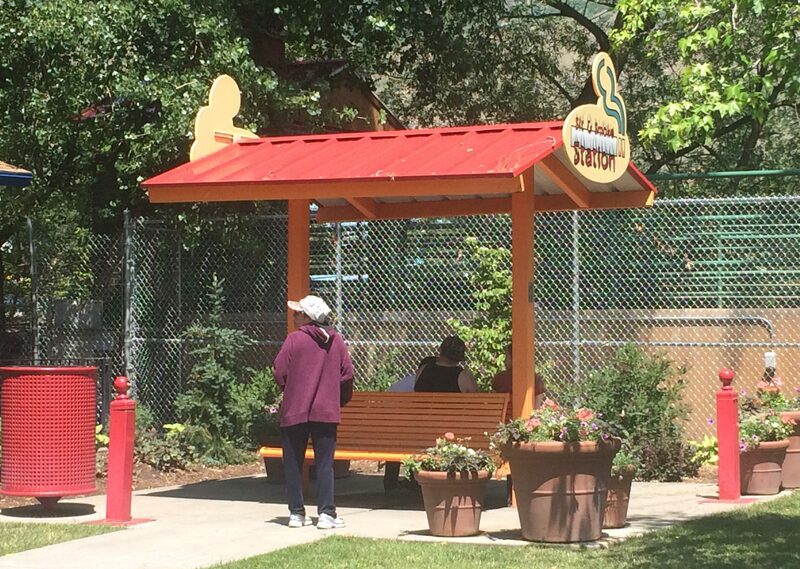 The next ride will take you on a leisurely trip across the park. This ride was installed in 1974 and I believe it was built by OD Hopkins & Associates and it takes riders on a leisurely trip over the midway to the north end of the midway. Riders must disembark and get back on to make the return trip. 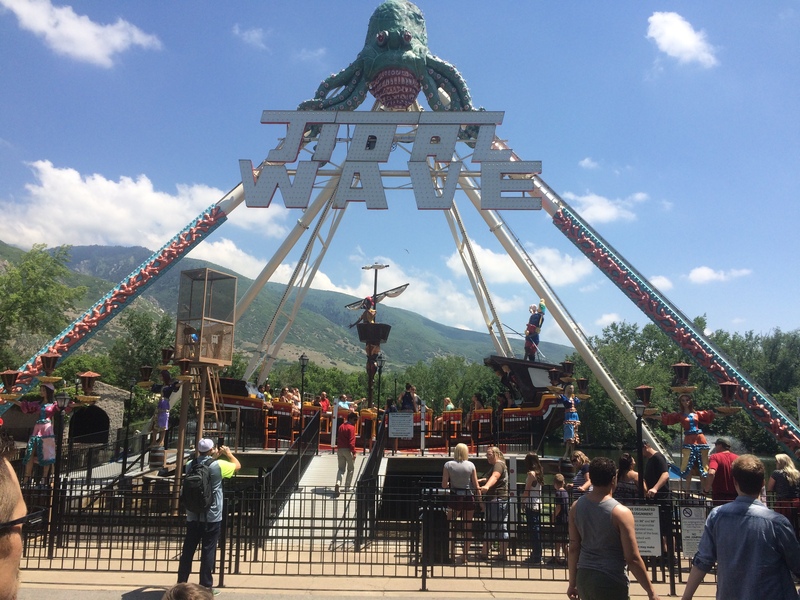 It affords riders many spectacular views of the midway, park, and the front range of the Wasatch Mountains. 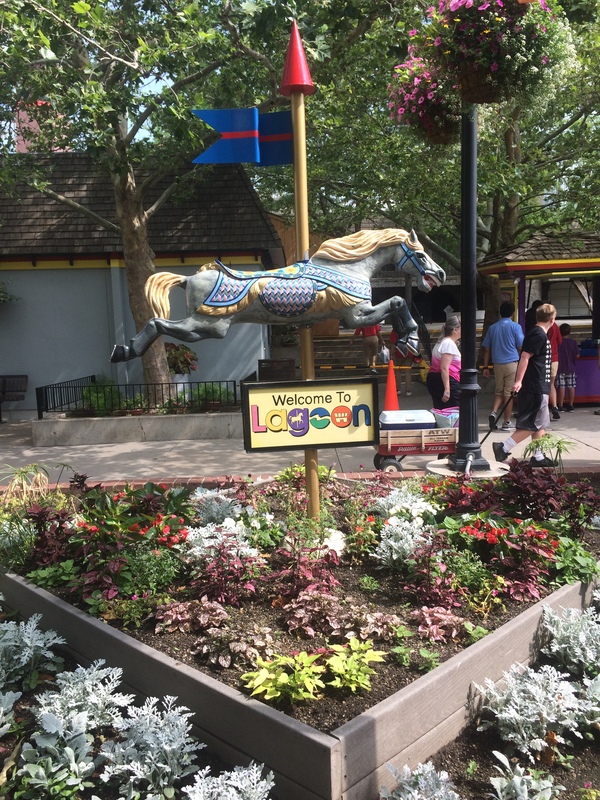 Riders will pass over some beautifully landscaped gardens along the midway and directly over the Julian Bamberger Fountain that was dedicated to the founder of Lagoon. Take a day and night ride view of the park from the south end of the midway to the north end of the midway and back by watching my on ride video from my YouTube channel. 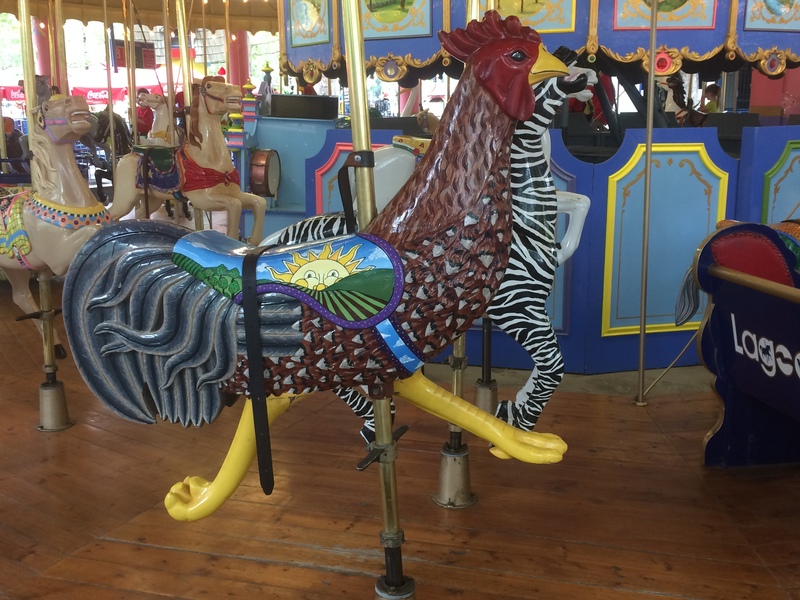 Our next ride will take you through a small zoo. 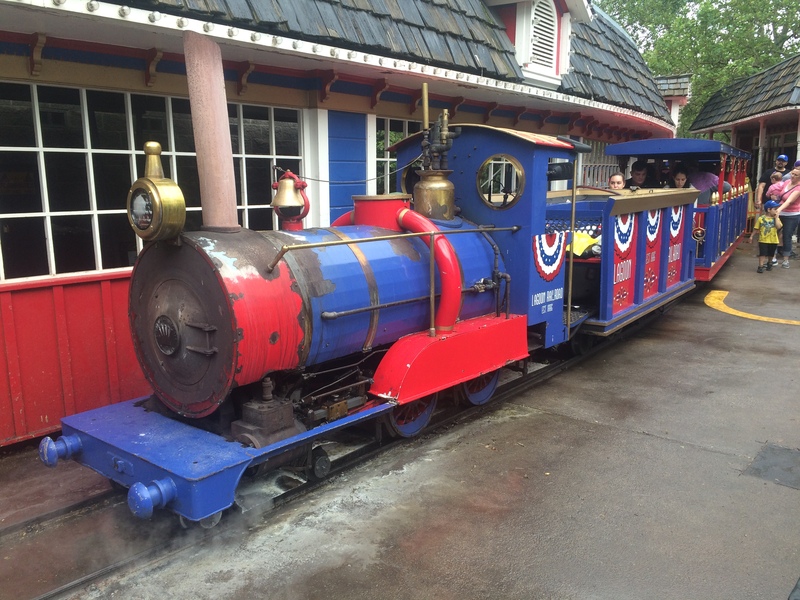 This train originally opened in 1967 as the Animaland Train but was changed to the current name in 1975. 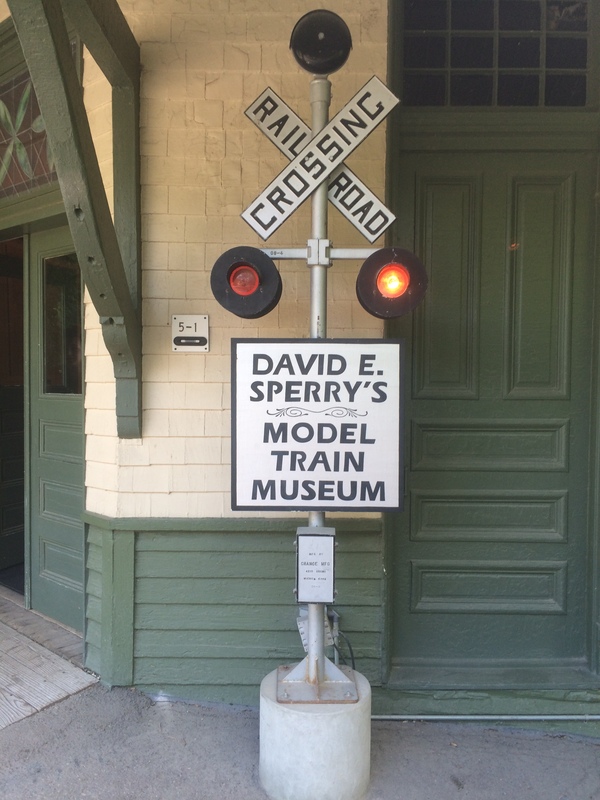 The train has two steam locomotives that were built by Crown Metal Products and run on a 2 foot narrow gauge track. 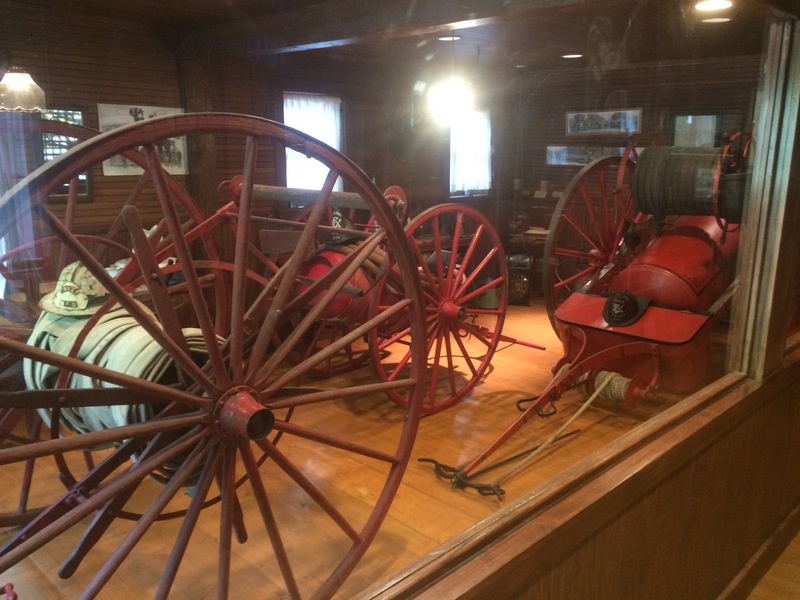 The two locomotives are the Houston and Meriwether and both run a 4-4-0 wheel configuration (4 guide wheels, 4 drive wheels, and 0 trailing wheels). The Meriwether actually was the “Old Ironsides” engine that ran on the residential side of the Pioneer Village before that train was retired. The train takes a clockwise trip around the lagoon and through a small zoo where you can see animals like a Jaguar, Cougar, Lion, Siberian Tiger, Brown Bear, Grey’s Zebra, Llamas, Golden Eagle, Camels, Miniature Donkey, Addax, Kangaroo, Fallow Deer, Peccary, Muntjac, Rocky Mountain Elk, Emus, Ostriches, a Bison, and others. Here’s my on ride video of the trip. The next two rides will swing and rock riders to their delight. 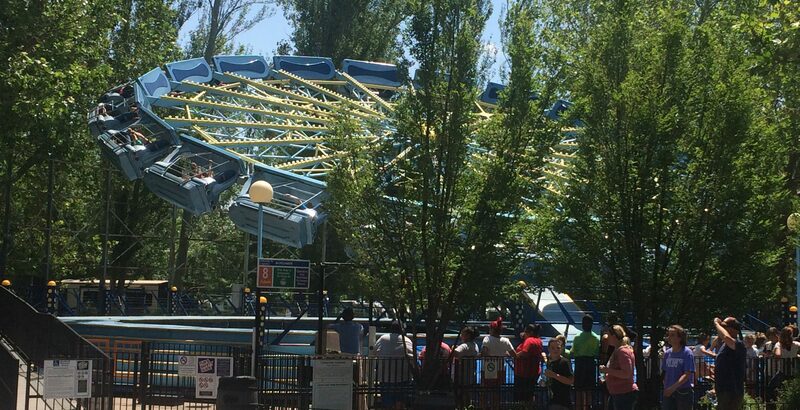 This ride is a Waveswinger model from Zamperla that was installed right on the lagoon here in 1987. This ride is a Pirate Ship model from Zamperla that basically rocks back and forth and does not go upside down and was installed in 1980. Next we’ll pass through Kiddyland, walk y the Lagoon-A-Beach waterpark and the old lagoon for which the park derived its name, and enter our next area. 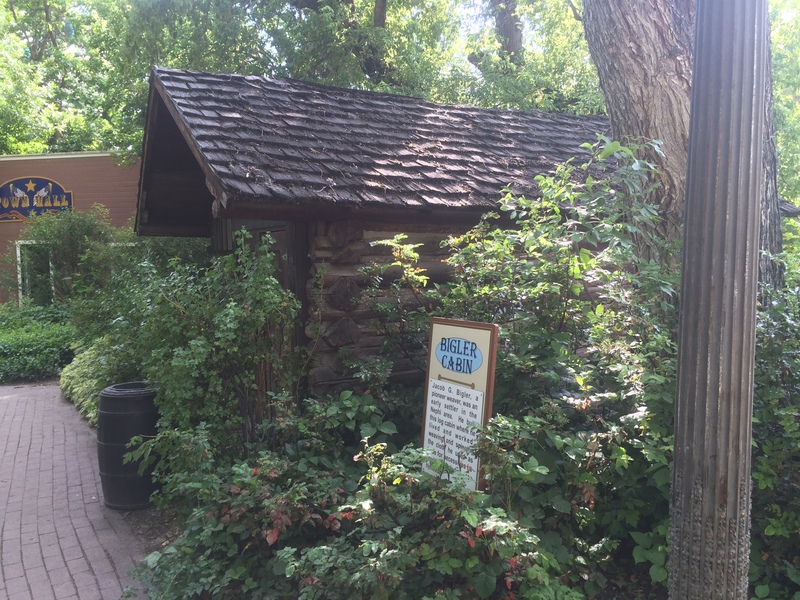 This area was created in 1975 when Lagoon purchased the Pioneer Village exhibit that was founded by Horace and Ethel Sorenson in 1938 and then later the Sons of Utah Pioneers. 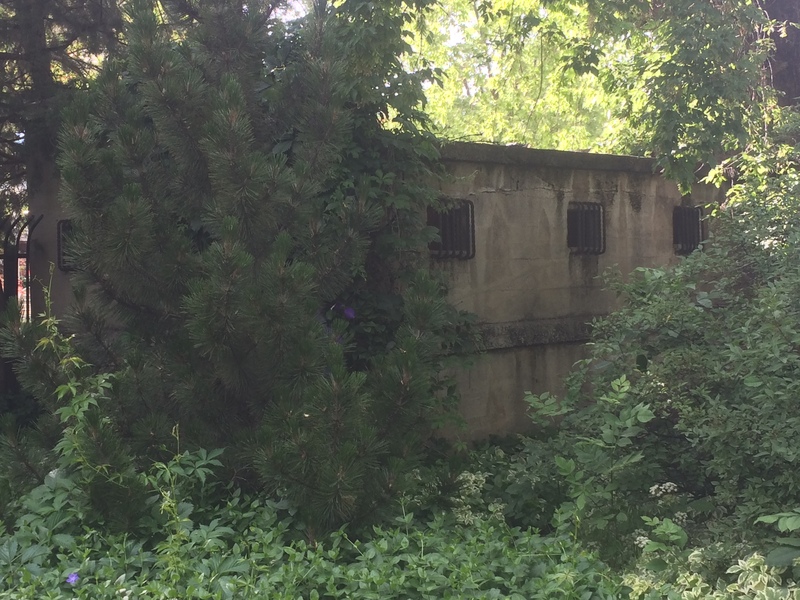 That property originally operated in Salt Lake City’s Sugar House area from 1953 to 1975. The village was moved to Lagoon and opened here in 1976 and they really have done a great job keeping up this area. 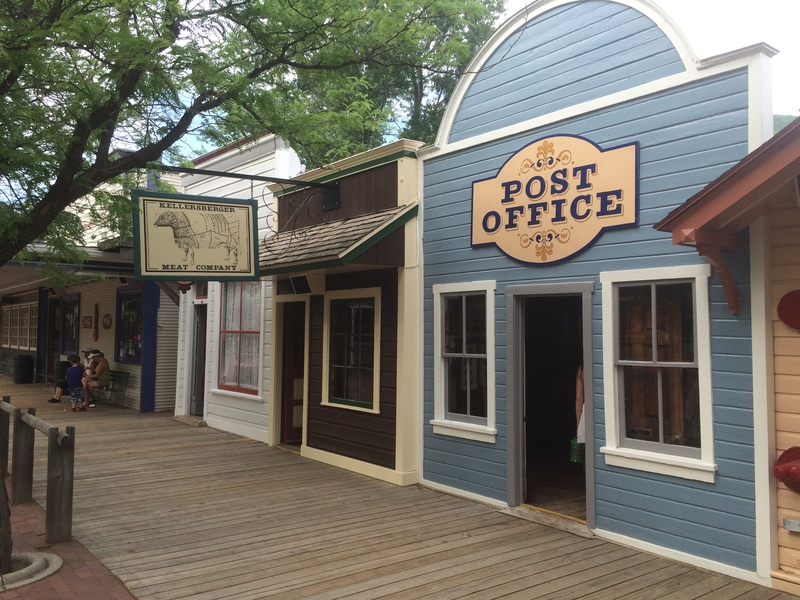 Pioneer Village originally opened with a 2 foot (610mm) narrow gauge railroad called “Pioneer Village Railroad”. That railroad featured a train called “Old Ironsides” which was a 4-4-0 locomotive from Crown Metal Products. 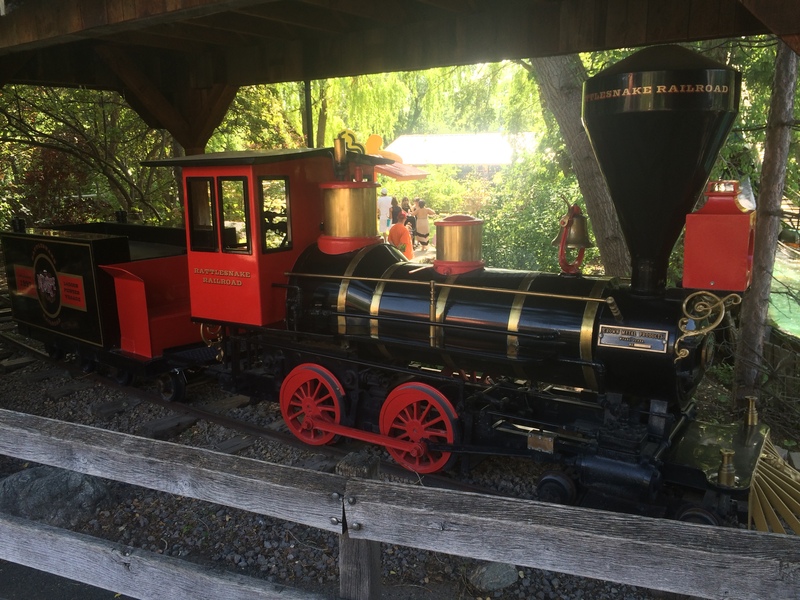 There also was a narrow gauge train that called “Lagoon Miniature Railroad” that ran around the residential area of Pioneer Village. 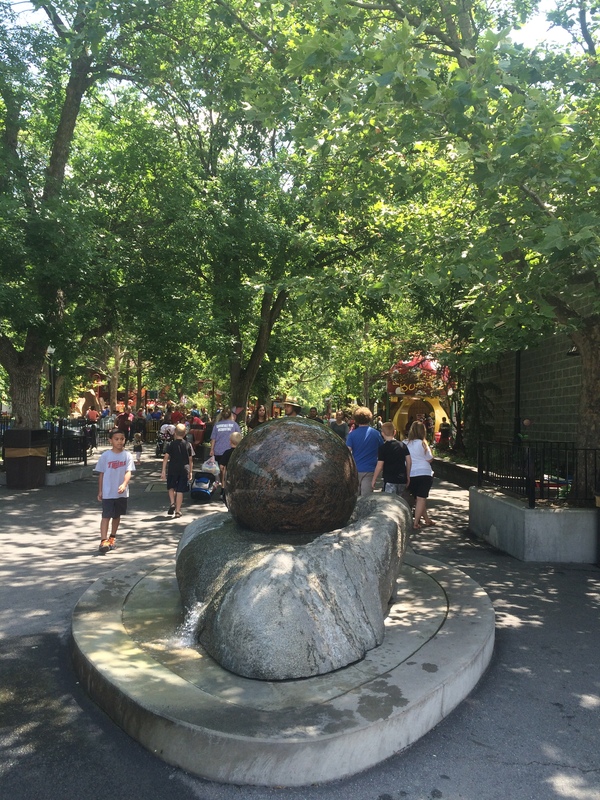 There are two water rides here and several picnic groves as well but lets explore the historic buildings and shops. 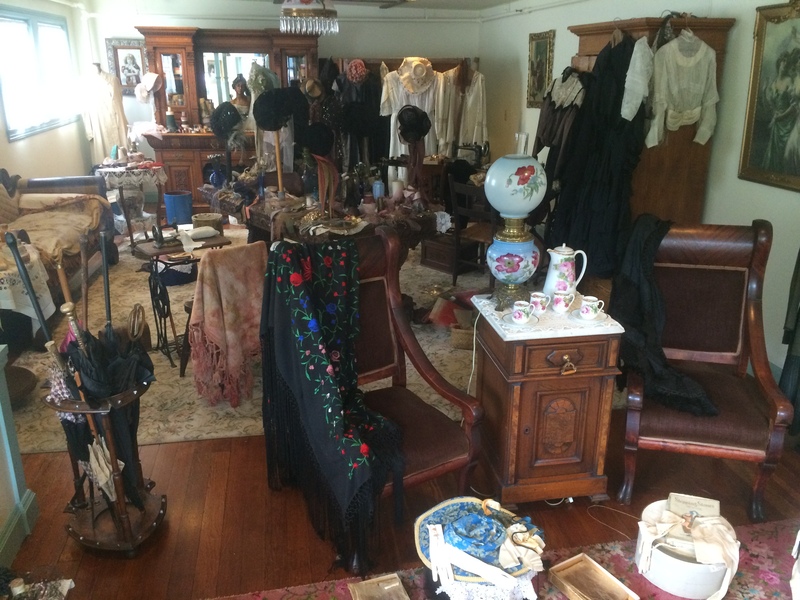 I was absolutely amazed at the collection as a whole as it is meticulously maintained. At times, I even forgot I was at an amusement park. 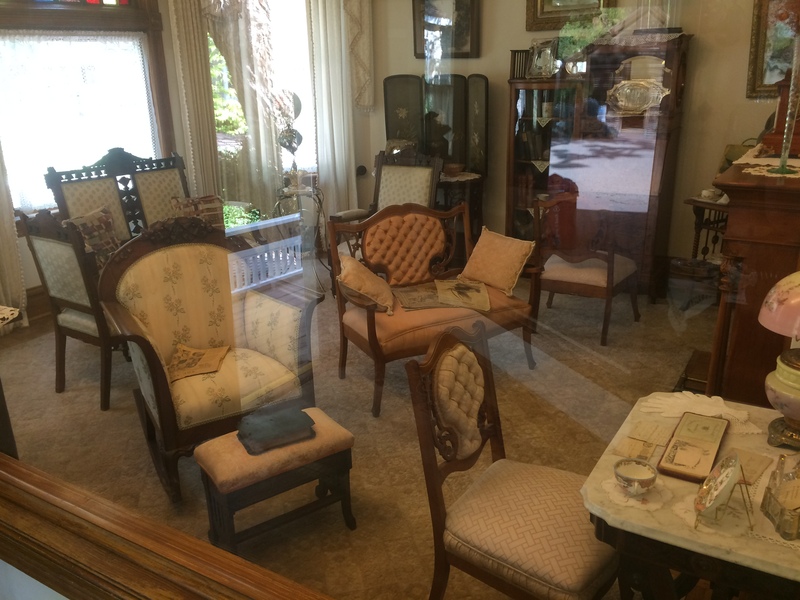 The first building we come to is the Historic Rock Building which houses the Mormon Furniture Exhibit which is on loan from the Historical Dept. of the Church of Jesus Christ of Latter-day Saints. 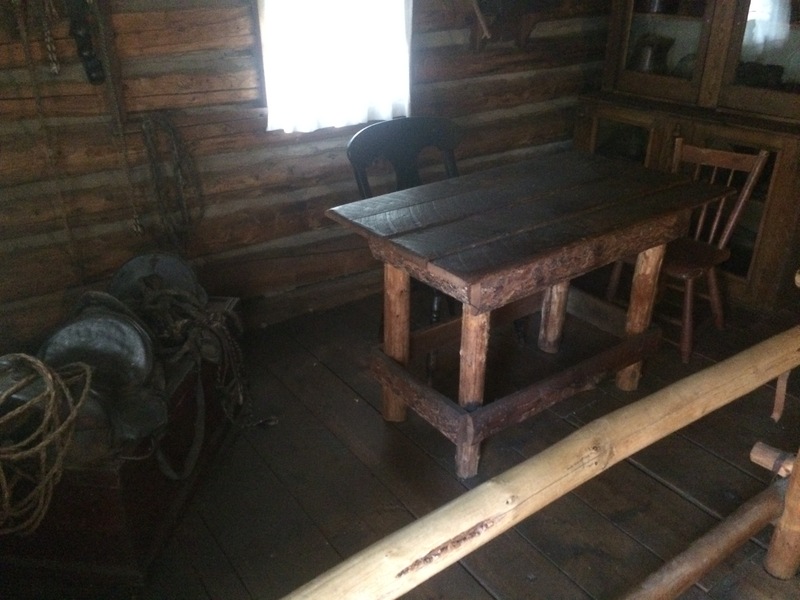 The original settlers had to use what was available to them and because there were no real hard wood trees available, they had to use pine. 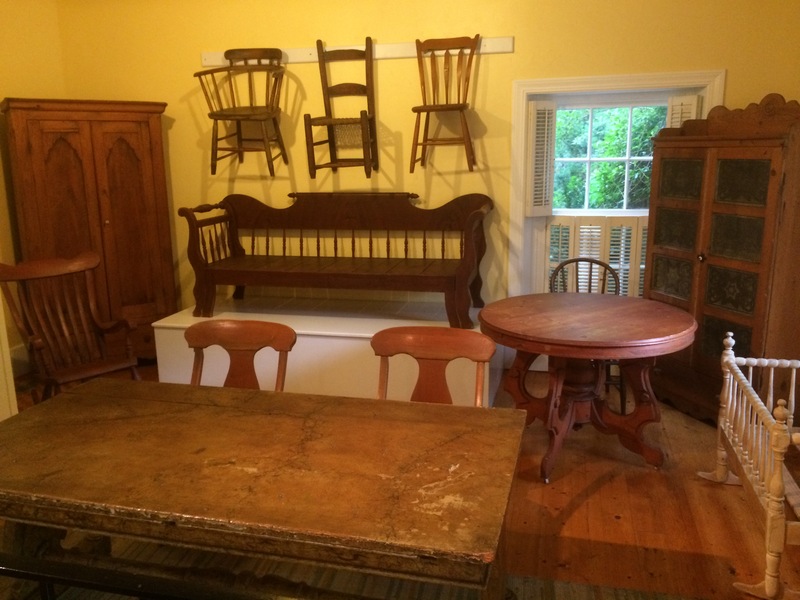 They found a way to disguise their furniture by staining or painting their furniture to give their pieces the look of oak, cherry, maple, mahogany, and other hardwoods. On display both in the shot and off camera are an octagonal table with elaborate flowers carved into it that was made by William Bell from London, England in 1860. 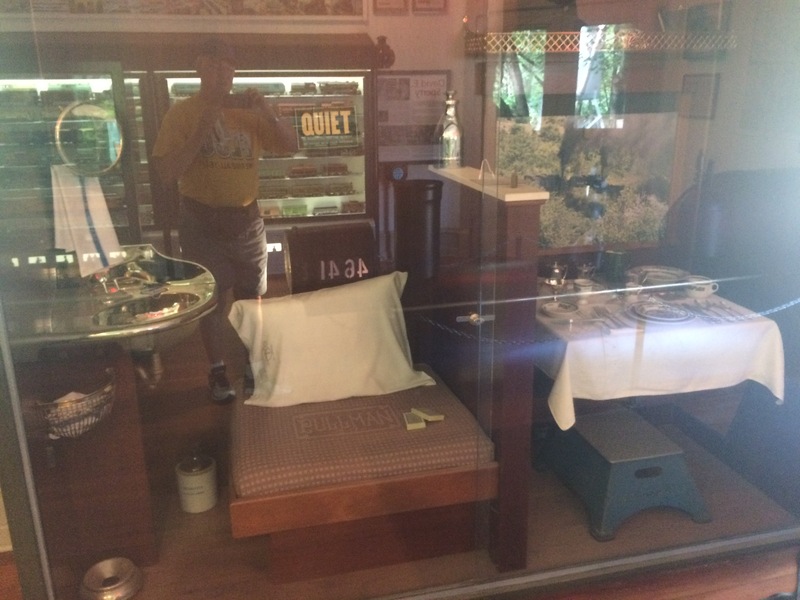 The Double Lounge, also known as a Mormon Couch, could be pulled out to form a double bed, almost like a futon. 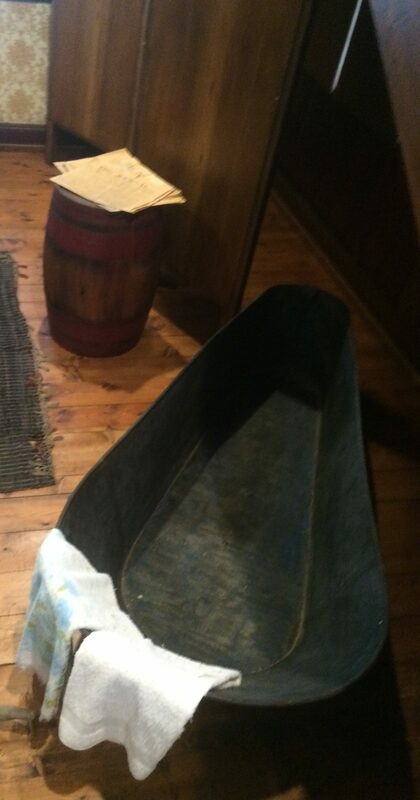 That piece was made in Utah in 1860 and similar pieces were used by passengers on sailing ships. 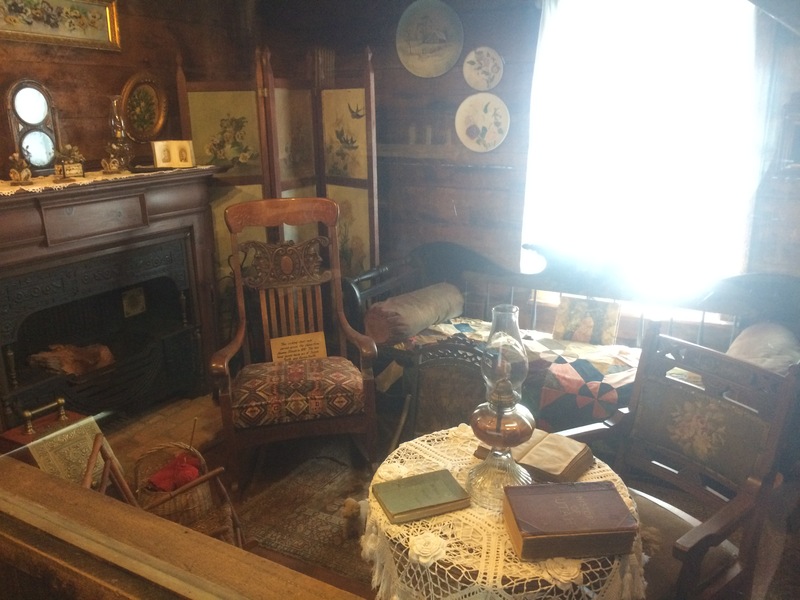 There also is a Rocking Chair that was carved in the same year and made out of pine and closely resembles a “Boston Rocker”. 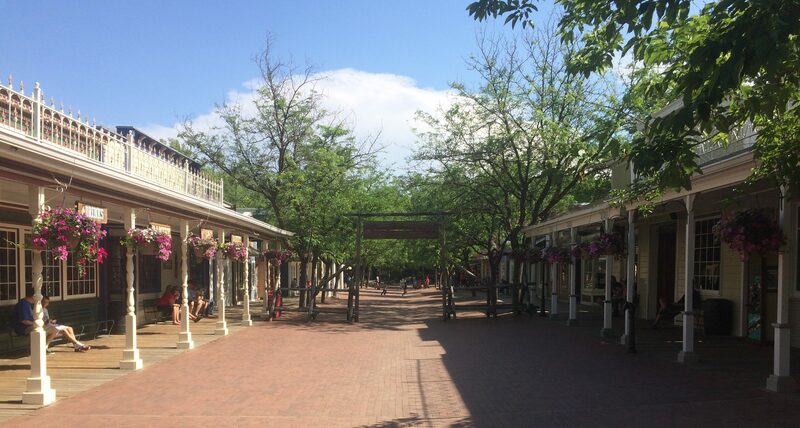 Now we’ll turn right and head down the main street area filled with displays and shops that you might find in an average turn of the century town. on the right is the Arby’s with indoor seating and then we come to our next display. 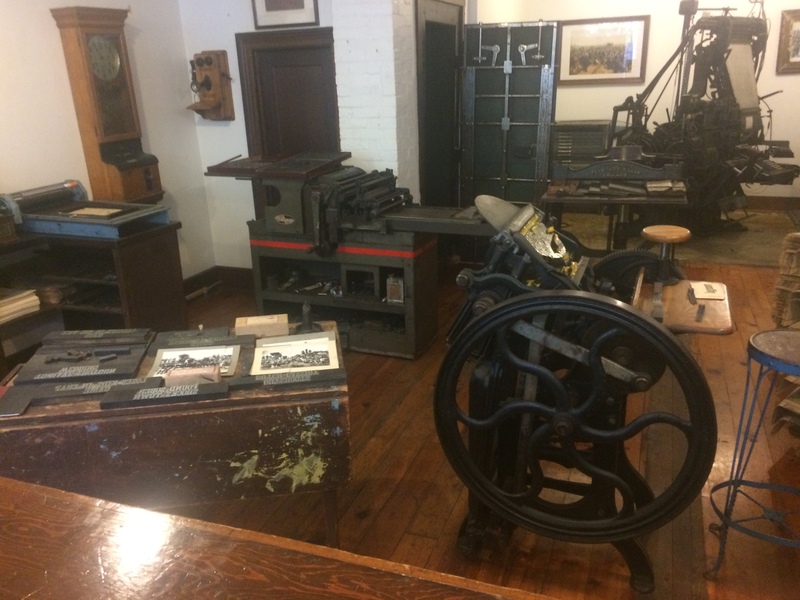 Newspapers were the way information was disseminated prior to the invention of radio and this shop displays presses, type, and other printing tools from the Patterson Print, Salt Lake Stamp Company, Ogden Standard Examiner, and Patterson’s Print companies. 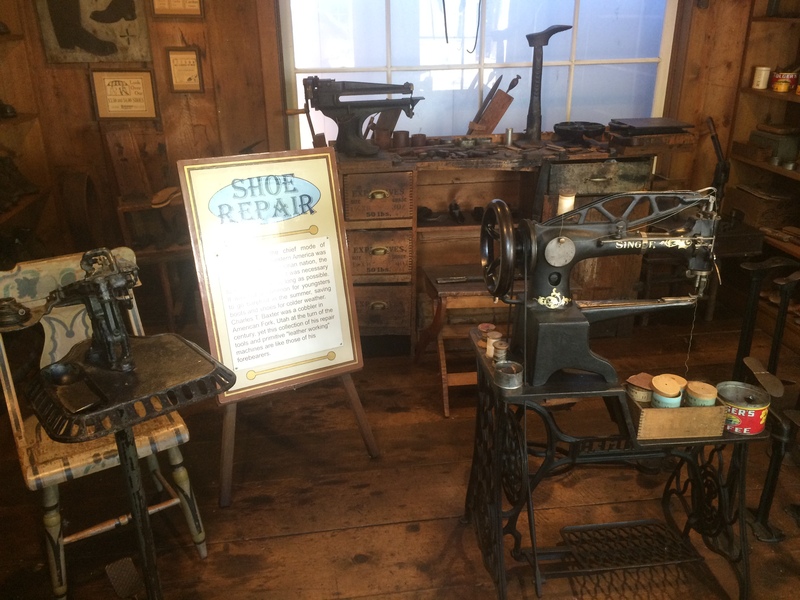 Up next is a trip to the cobbler’s shop. The building on the right houses the leather working tools and repair machines from Charles T Baxter who was a Cobbler (someone who makes and repairs shoes) in American Fork, UT in the early 1900’s. That town is about a 45 minute drive south of the park. 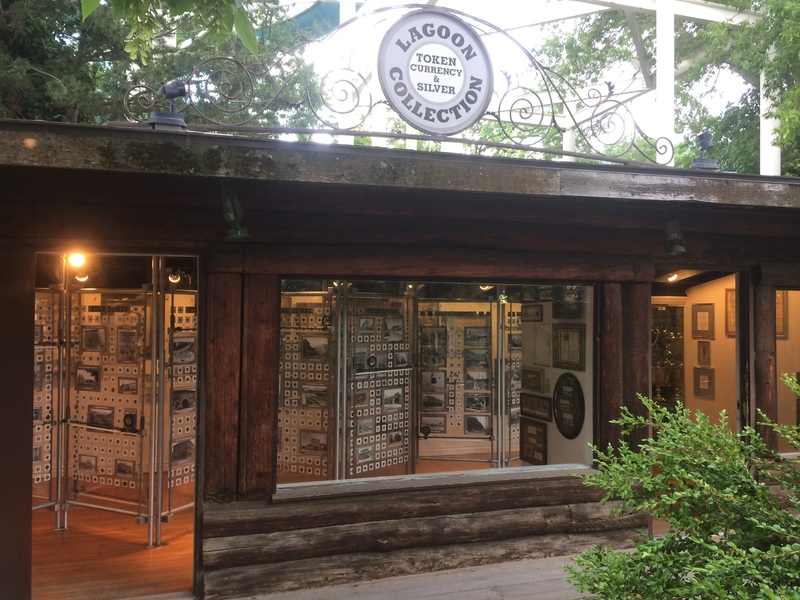 The building to the left of the Cobbler’s shop was built in 1885 and was the official Co-op store of Rockport which is about a 60 mile drive east of Lagoon. 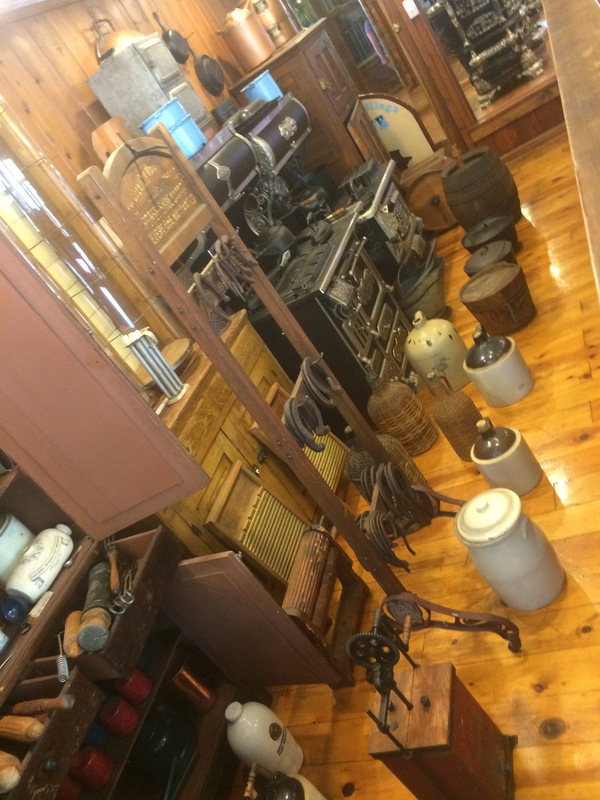 This store was organized by farmers from the Wanship area and it remained a co-op store until the 1930’s. 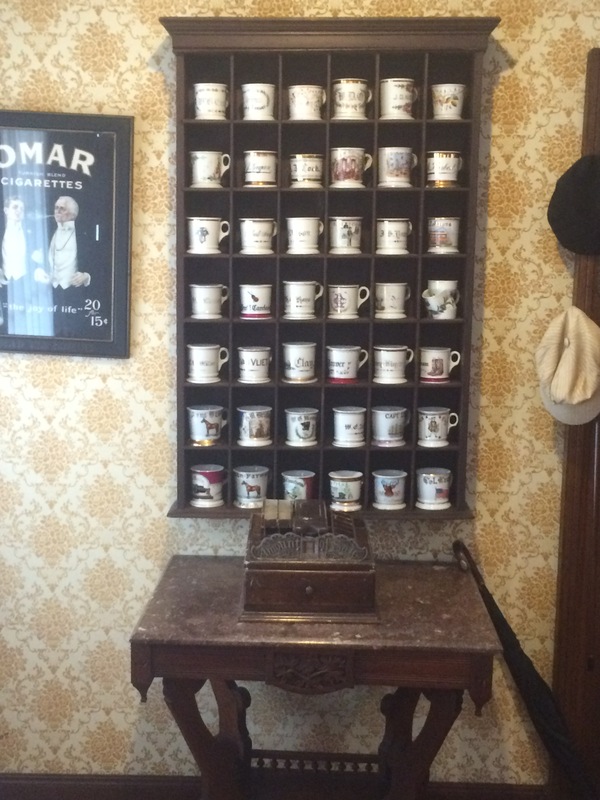 The next building is full of fine china and tableware. 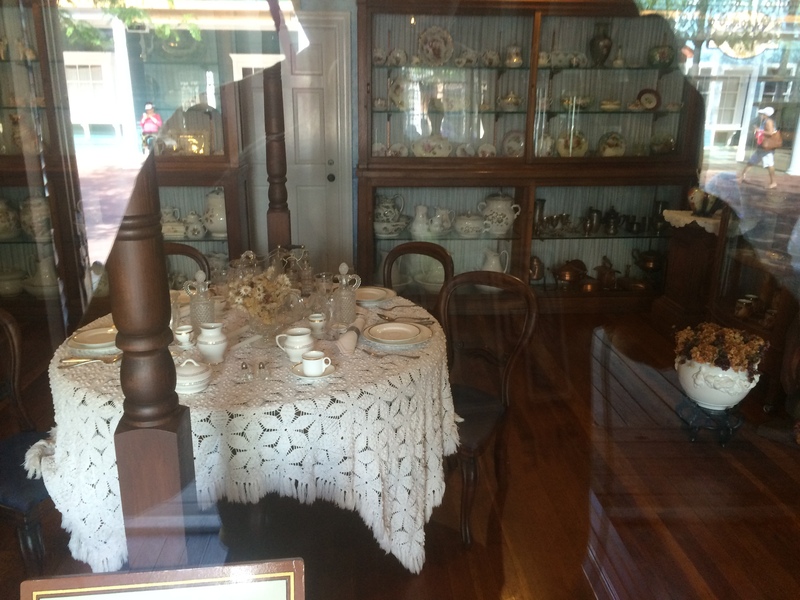 During the early years when the west was being settled, people were only restricted to what they could load onto their wagons so the priorities were obviously given to those things that were most important like food, tools, and other things so the niceties like fine china and furniture were usually left behind save for a few favorite pieces like some plates or tea cups. 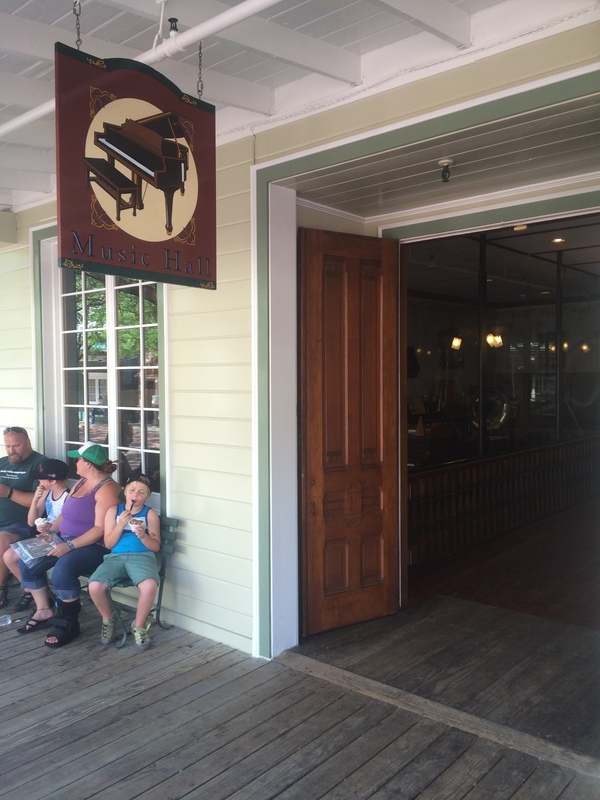 The pieces inside this building were made between 1830-1910. Up next is a staple of just about every Main St in every large town in the US. 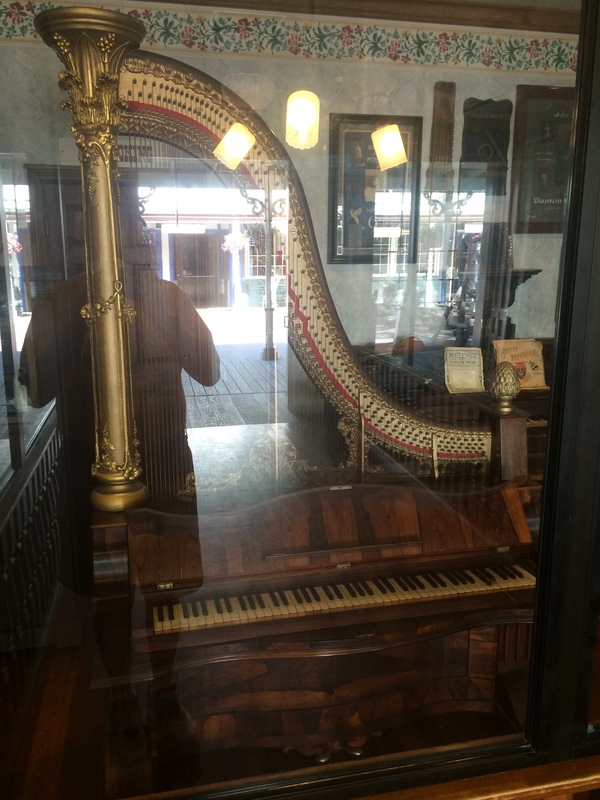 This area is dedicated to the various musical instruments the pioneers brought over with them including what appears to be a Claviharp which is a harp/piano combination. Here you could buy anything medical to help cure what ever ails you including soda-pop and ice cream. 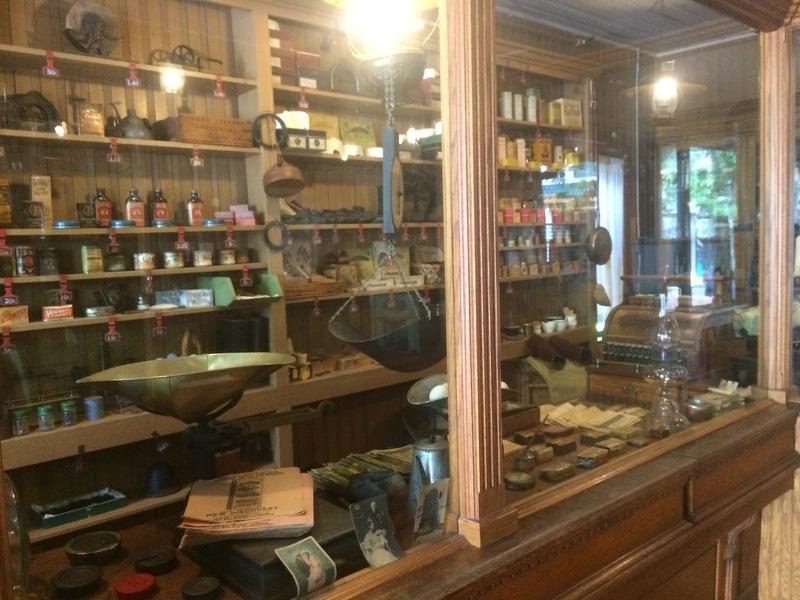 The contents of the cabinet came from the Crabtree Drug Store that was located in Cairo, IL where the Ohio River joins with the Mississippi River. 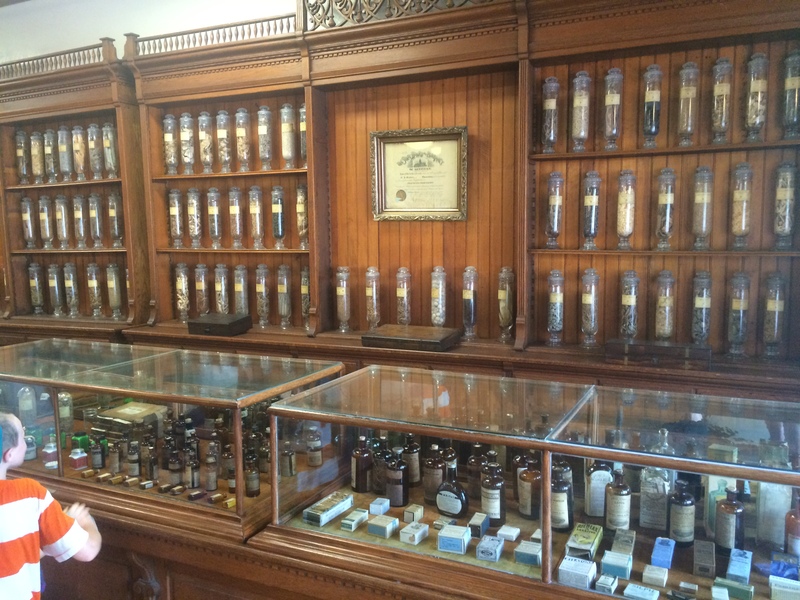 The antique cases, cabinets, and countertops came from the original University of Utah School of Pharmacy. You can also buy your own ice cream as well. 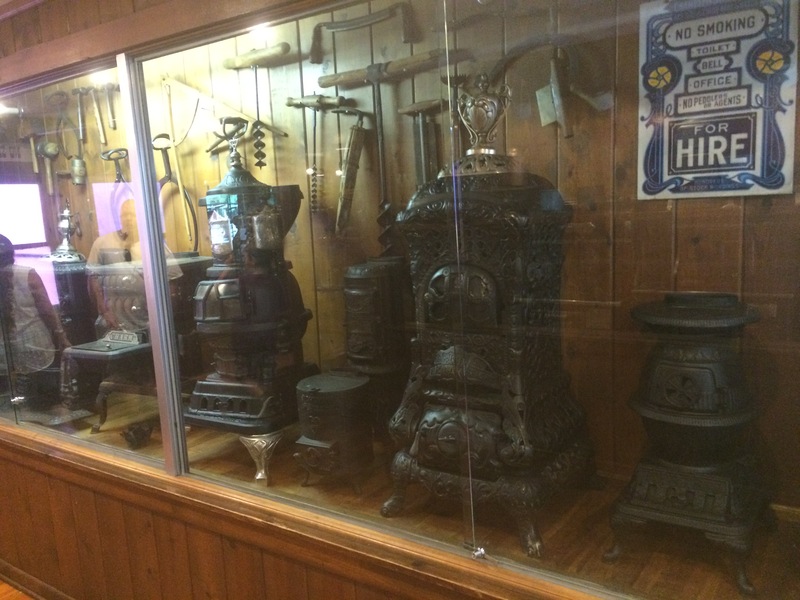 This museum is home to an impressive collection of antique stoves and hardware. This building is also home to the Sovereign Jewel stove. This piece is an absolute work of art and goes to show that even the most mundane and ordinary household appliances can be turned into functioning works of art. According to the sign, the dome is made of bronze and covered in gems and high art tile and it’s doors are illuminated mica and the drapery made from carved nickel. There is even a tea kettle attachment in the back. This stove burns hard coal and has a radiating surface of 1,984 inches. This piece was manufactured by the Detroit Stove Works and was on sale for $36 with an option to buy a register and air pipe collar for a dollar more. 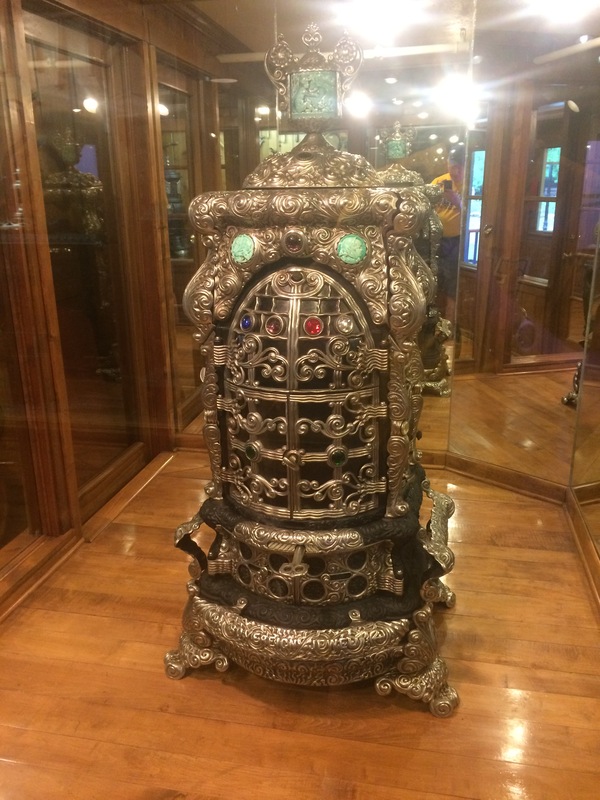 It is also said that many years of research was done on this piece and this appears to be the only Sovereign Jewel stove in existence so it is priceless. This particular cabin hat no signage attached to it but it does give a good look at what a typical one room cabin looked like when the area was being settled. 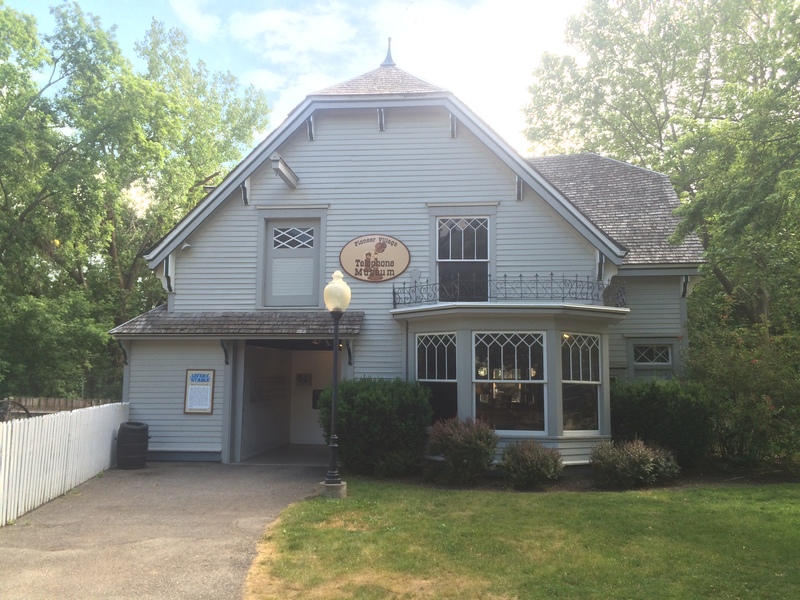 This stable was built by Colonel Conklin in 1885 behind his house. 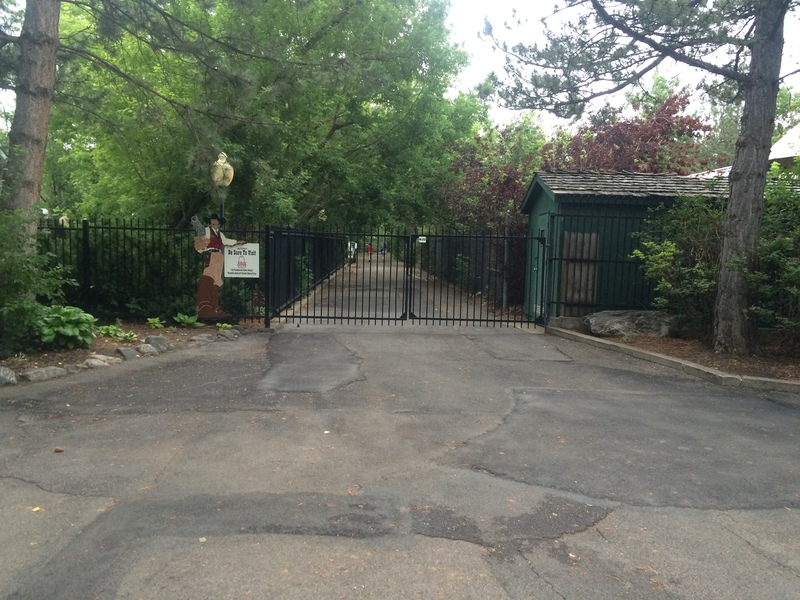 The estate was later purchased by former Utah Governor Henry Dern who then renamed the house the Dern Mansion. Mr Dern would then later become Secretary of War under the Franklin D Roosevelt administration in 1933. 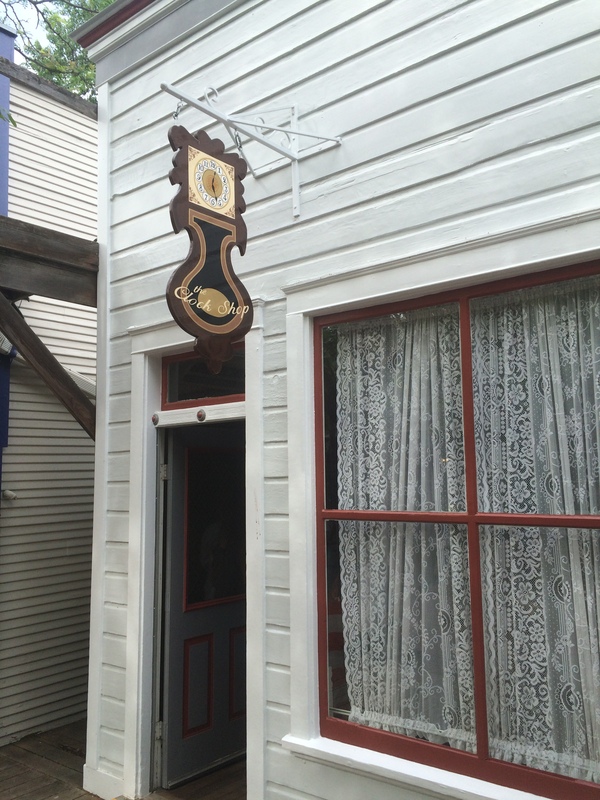 The house and livery stable were located at 715 East South Temple in Salt Lake City until 1950 when the livery stable was moved to a different location before coming here in 1976. 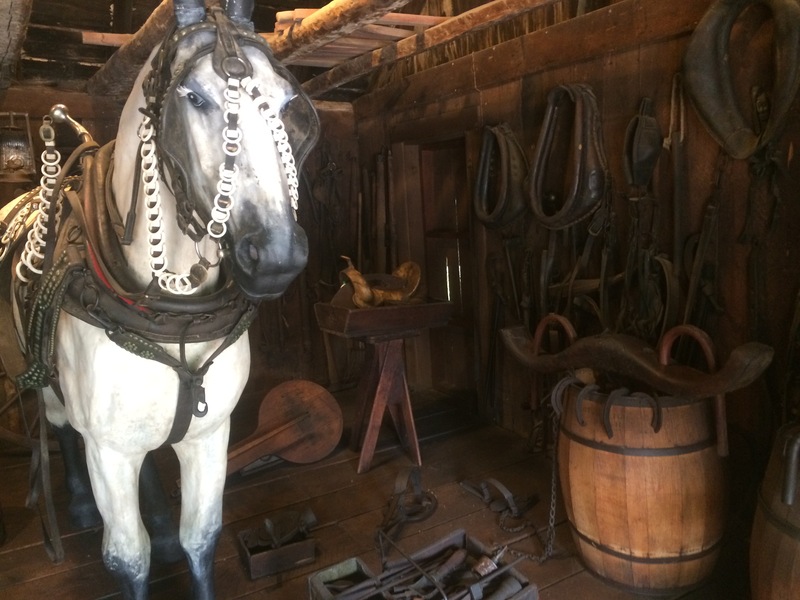 During its time, the stable served as a livery stable, carriage house, and finally servants quarters. The livery stable was quite interesting as there was always food available for the horses thanks to a rather unique feeding system. Hay was stored upstairs in the loft and another dropped through the floor via a system of chutes so once a bale of hay was eaten, another would slide down so the horses would never go hungry. 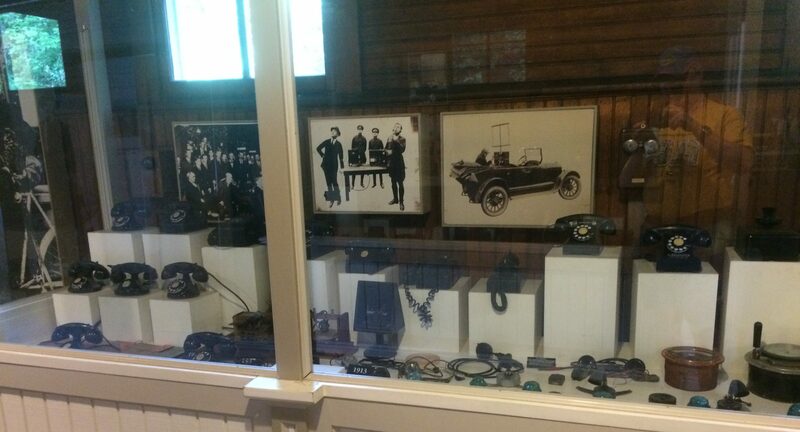 Now the livery stable hosts the Telephone Museum. 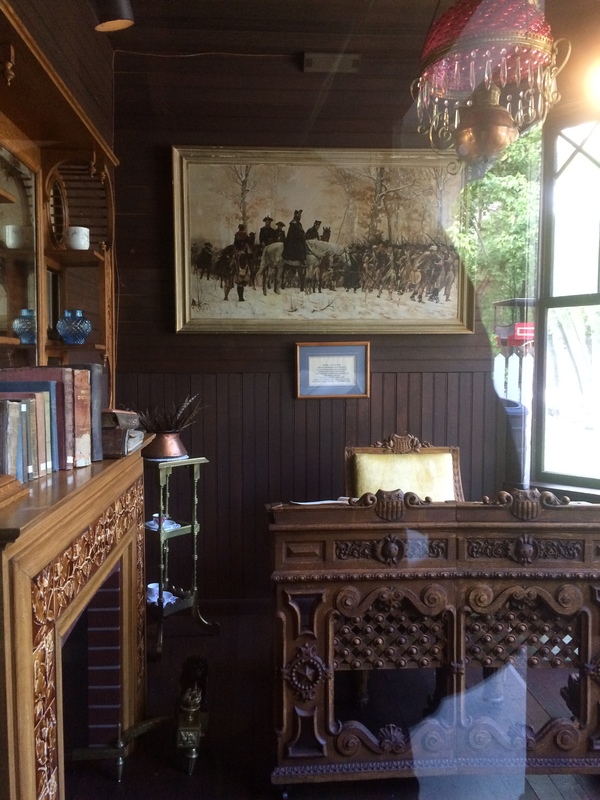 The picture below is a look into the livery office which is quite beautiful. The office is in the room on the right with the three large bay windows. 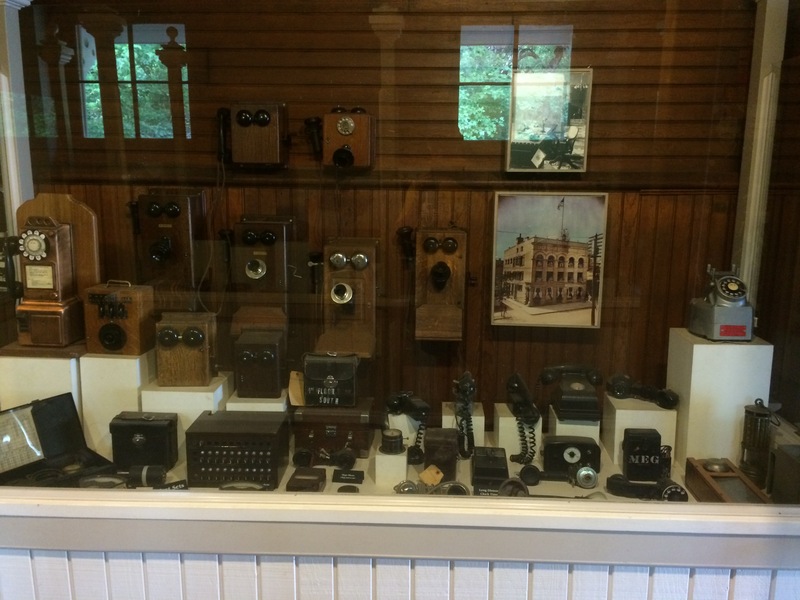 Inside, you’ll see many different telephones including several candlestick phones, rotary phones, and even a phone with its “Bell Box” mounted on the wall. 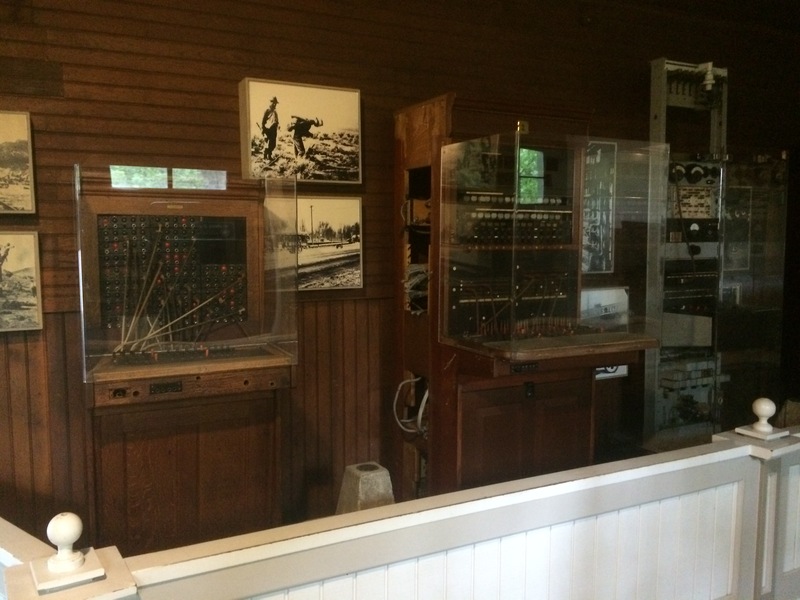 The next room contains several antique switchboards. At the front of the stable was this curious looking device. 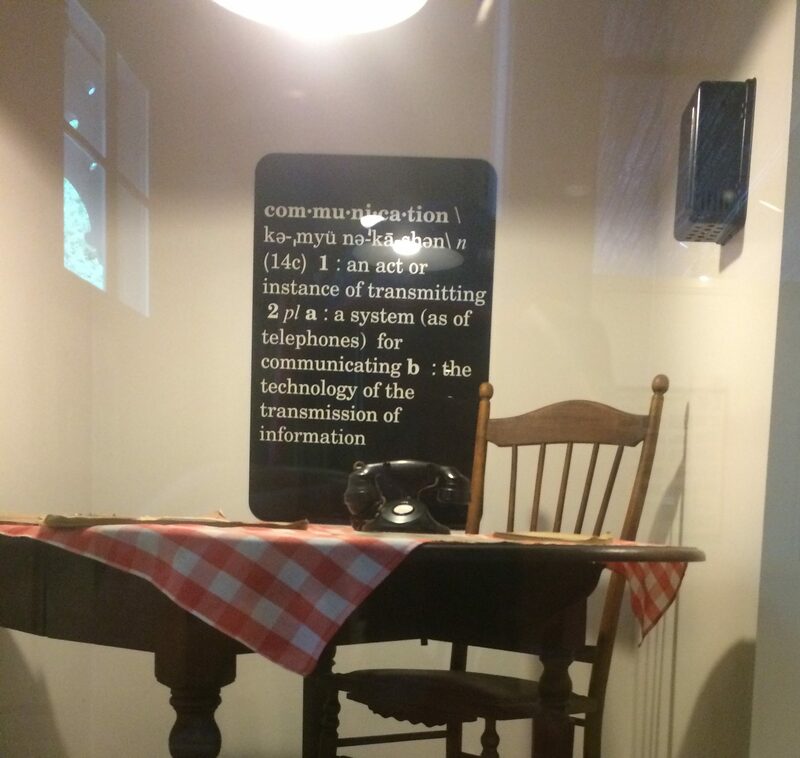 I couldn’t find any information on it so I assume it has something to do with the telephone industry, but I really don’t know. Next up is a favorite of mine as I love railroads. 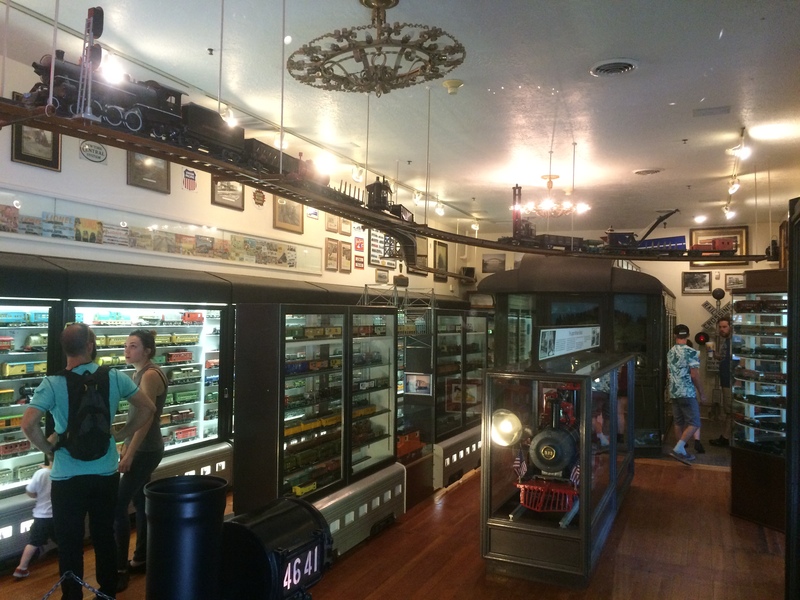 This train station was built in the 1880’s by Union Pacific in Kaysville, Utah and it currently houses the miniature railroad collection of David E Sperry whose fascination with model trains began in 1928 when he saw an electric train in a friends sandbox. 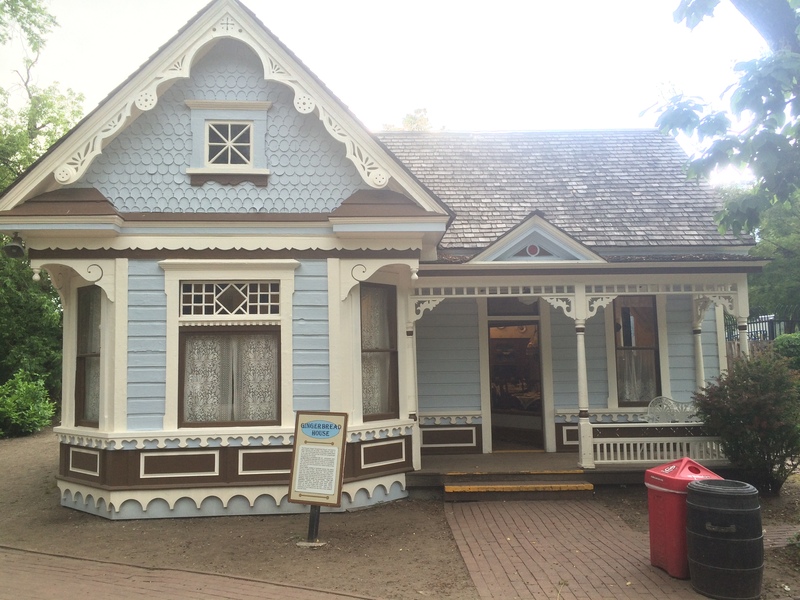 It actually served as a train station when the area first opened as there was a small narrow gauge train that ran around parts of the park. 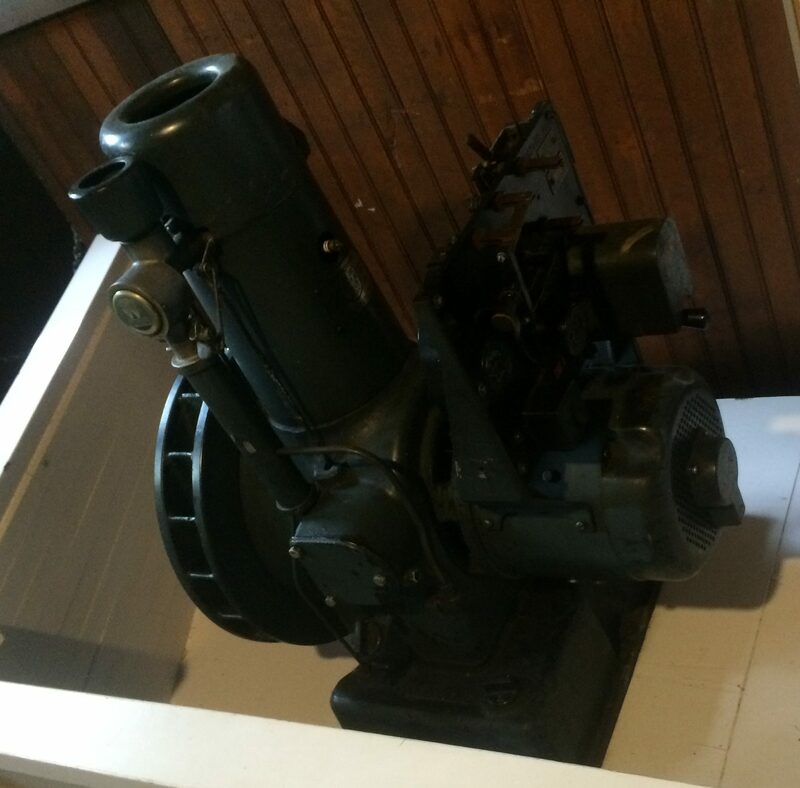 That engine is currently inside the train museum inside a display case which you can see in one of the photos below. 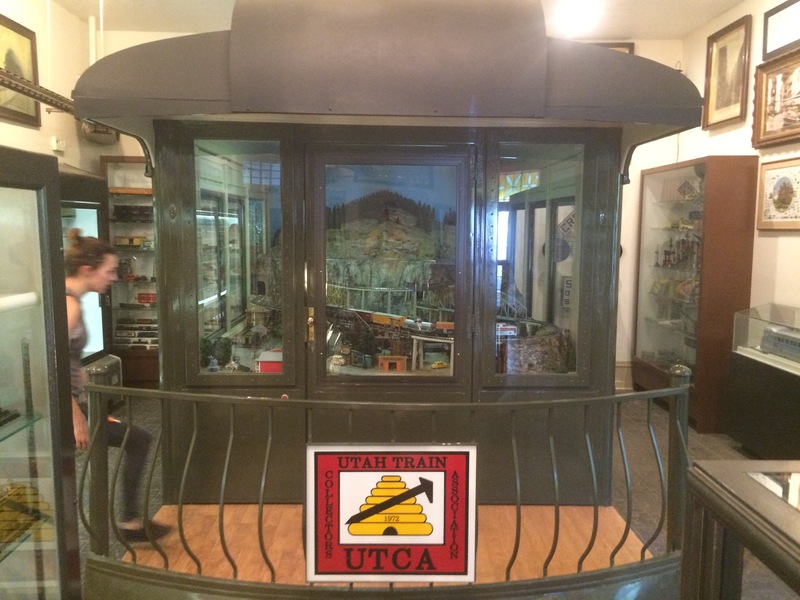 Here are some photos of his immense collection including a recreation cutaway of a private cabin in a Pullman car. Pullman cars were quite luxurious and also quite heavy. They were heavy enough to three axles per truck for a total of six axles per car. The normal train car had two axles per truck with two trucks per car equaling four axles per car. Outside and to the left is an actual train signal called a semaphore. This is used to inform the engineer if the train needs to stop or slow to pick up orders or passengers (Red or yellow signals), or to continue to the next signal (green signal). This style of semaphore is believed to be the basis for the modern traffic light that is used on the highways and byways of our nations highways. Next up is an essential part of any town. 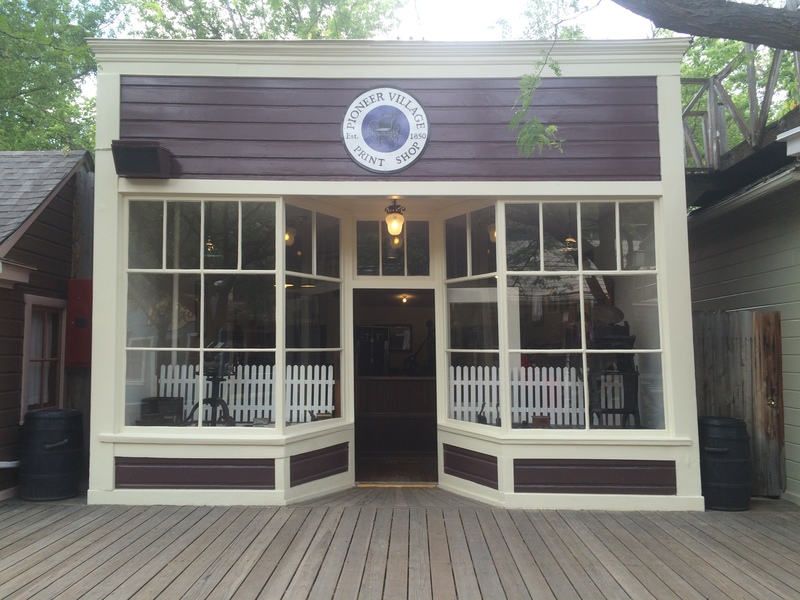 This shop was built in 1858 in Cedar Fort, Utah and was used to meet the needs of Johnston’s Army that was stationed at Camp Floyd. 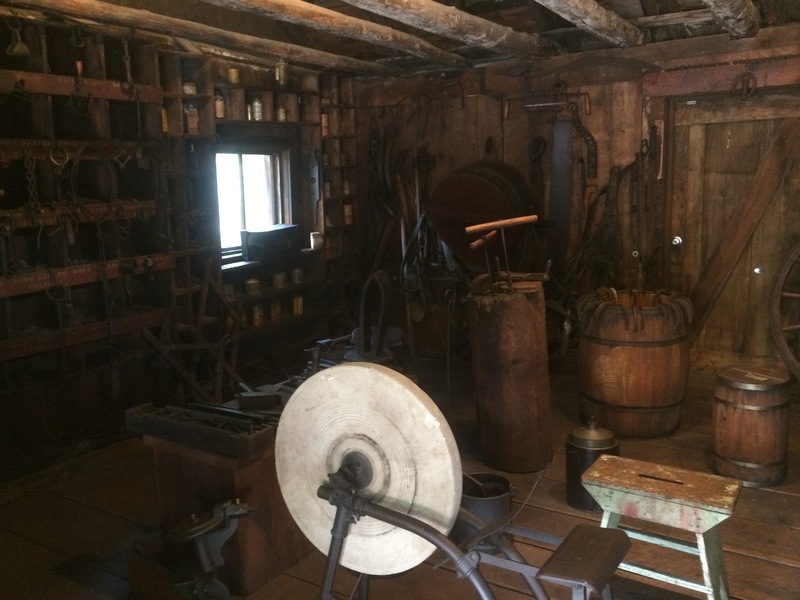 The tools are also original to the shop as well and you can still smell the smoke that was absorbed into the wood from the fires that were used inside the shop. The only thing that isn’t original, is the horse. 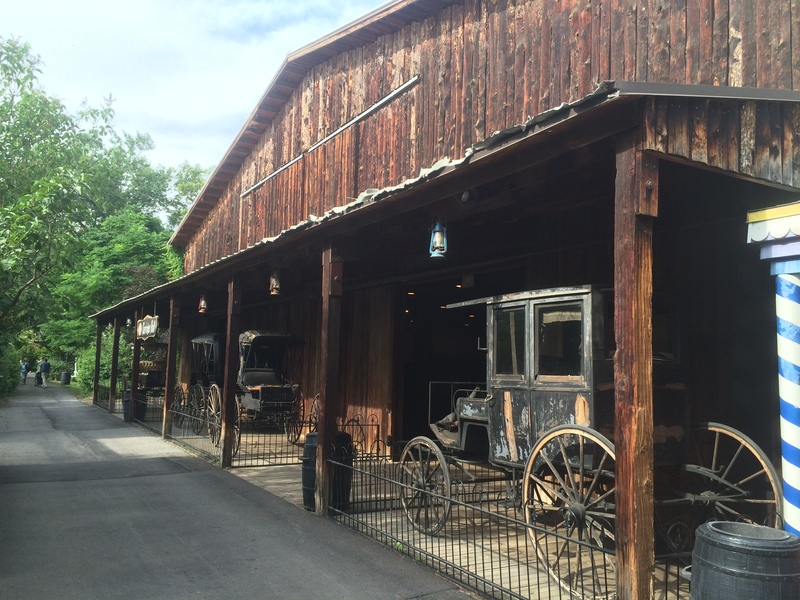 The Livery Stable, train museum, and Blacksmith’s shop are at the end of the main street so we’ll turn around and head back down the other side of main street. Before we do that, there are two more things I need to show you. 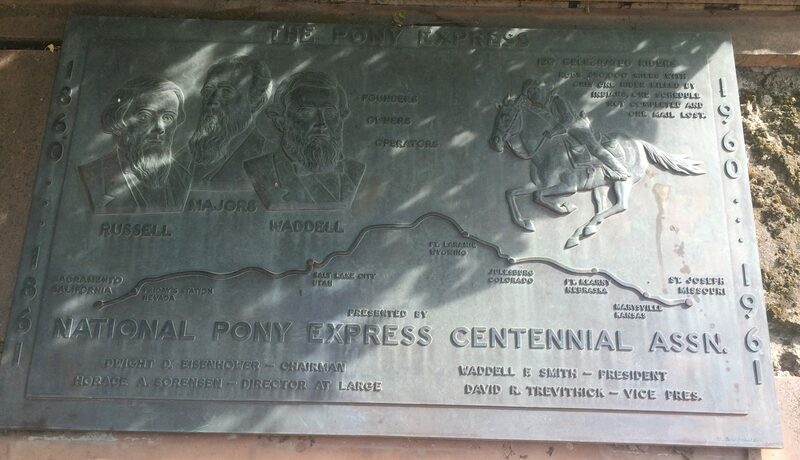 There is a plaque dedicating the famous Pony Express as Salt Lake City was one of its stops and there is a fully restored and functioning street clock. Next up is another essential. There are actually two displays in this building. Lets visit the barber shop first and then we’ll go upstairs for the second part. 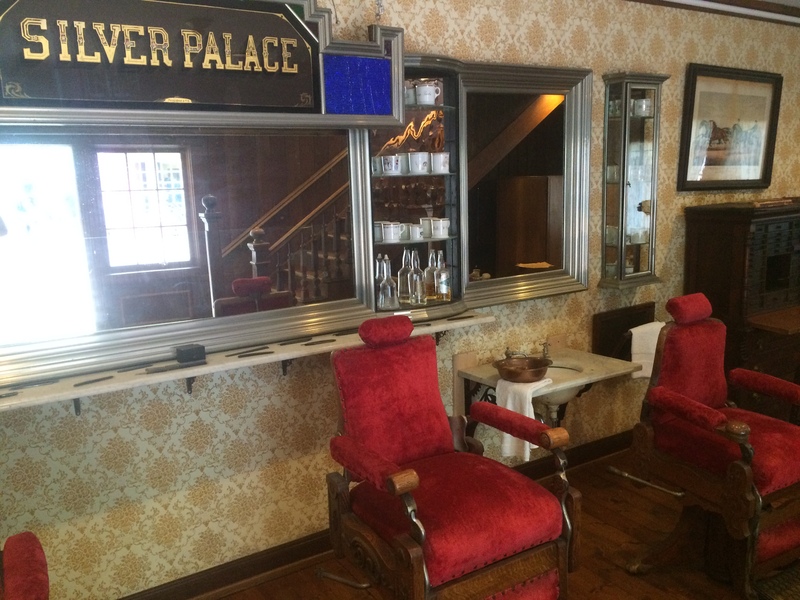 Barber shops were, and in many cases still are, impromptu clubs for men. 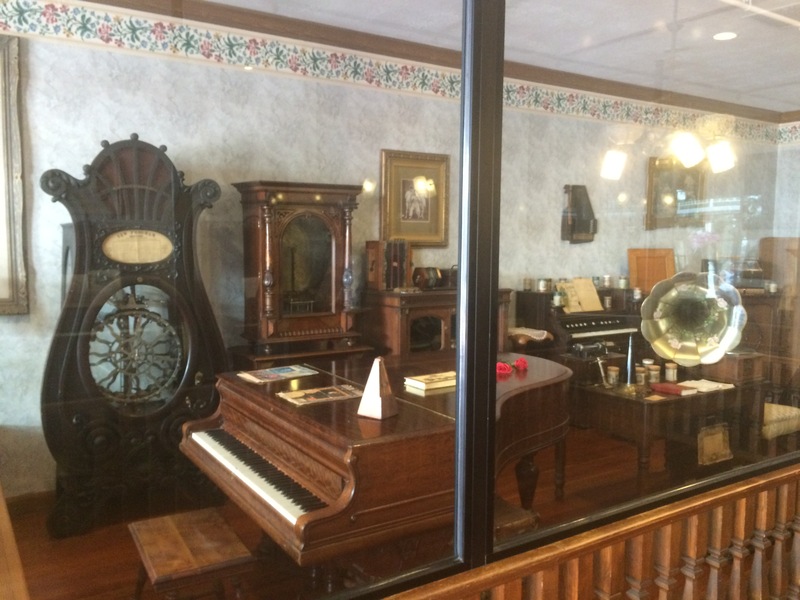 This barber shop was built sometime in the 1890’s at a time when barbers sometimes doubled as surgeons and many also had baths as well as you’ll see in the photos below. Special customers even had their own shaving mug and brush. 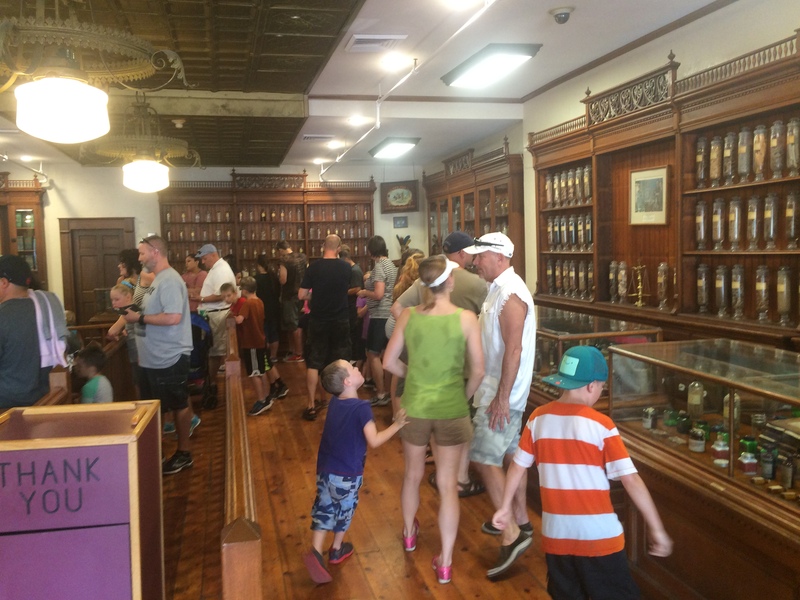 The barber shop also has a selection of colorful jars filled with after shave lotion and pomade as well as a jar full of peppermint stick candy for the kids. 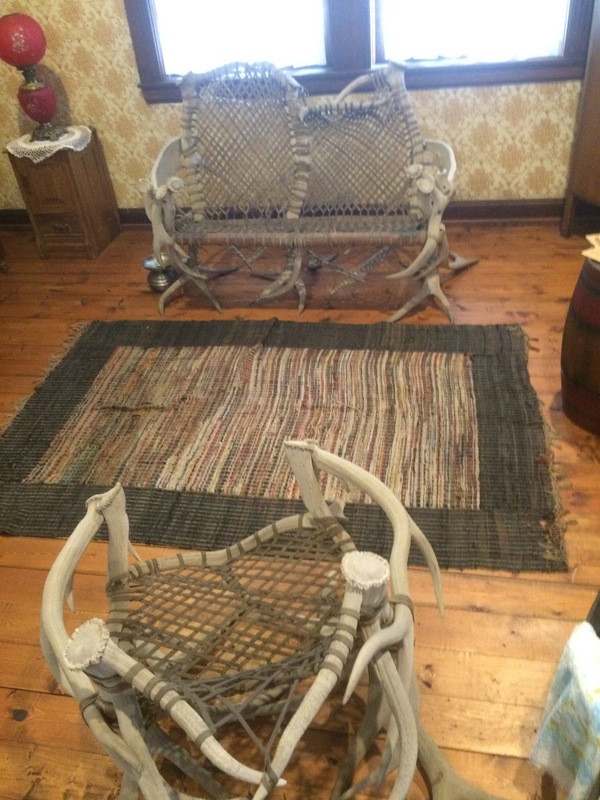 Did you notice the rather unique chair and love seat? 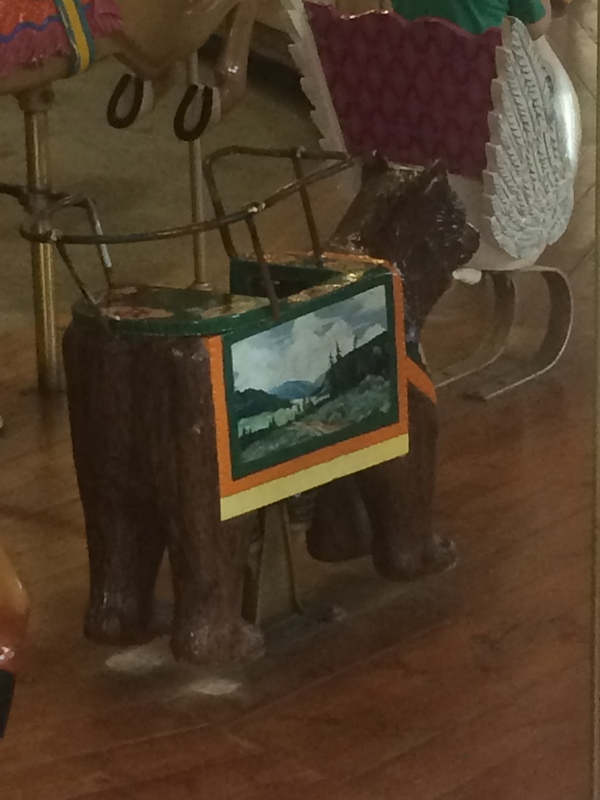 Those were made of antlers and were quite common back then. 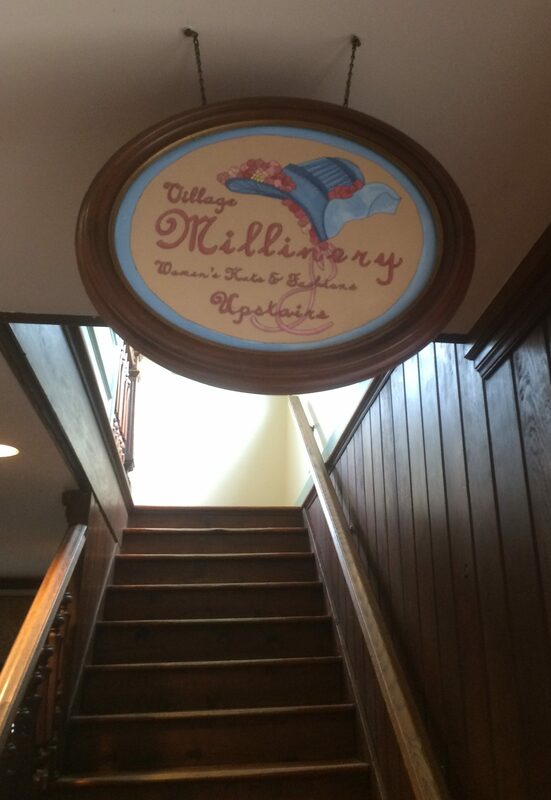 Now we’ll head upstairs to the Millinery to see how hats were made. Unfortunately, there were no signs in this area that described where these came from or how they were made but it was interesting to see none the less. I can tell you that a Milliner is someone who makes hats so that is a hat shop is called a millinery shop. Now to our next display. 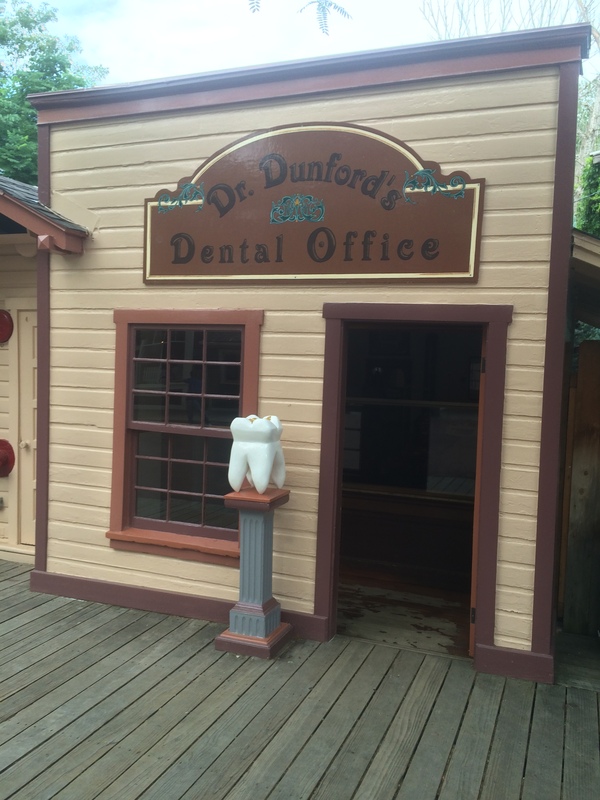 I’ll just say that you should be thankful that the field of dentistry has advanced so far now to the point where we now have numbing agents and sedatives for surgical procedures that are quite safe now. 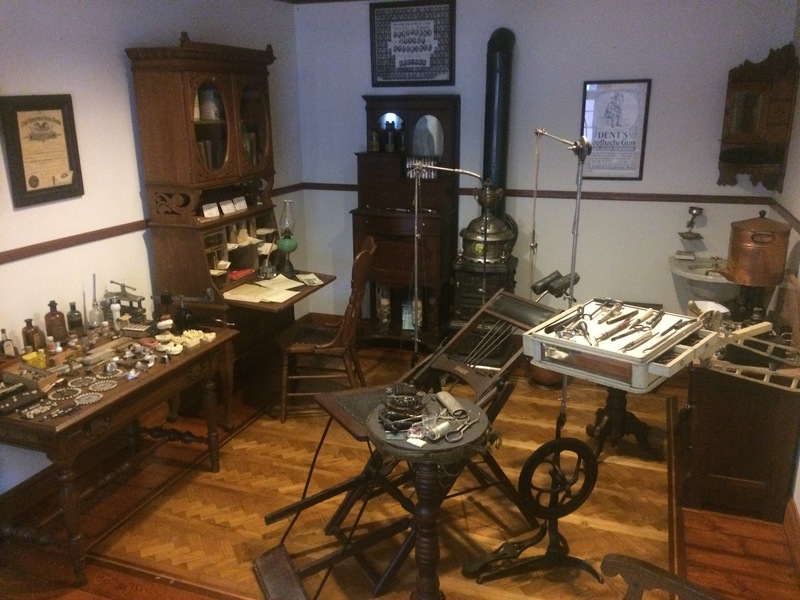 Back then, surgeries didn’t always work which is why most people opted to just have the tooth pulled rather than have the often risky surgery to try to save it. Sedatives and numbing agents like Novocaine hadn’t been invented yet so patients often took a few swigs of the strongest alcohol to help numb the pain of getting a tooth pulled. 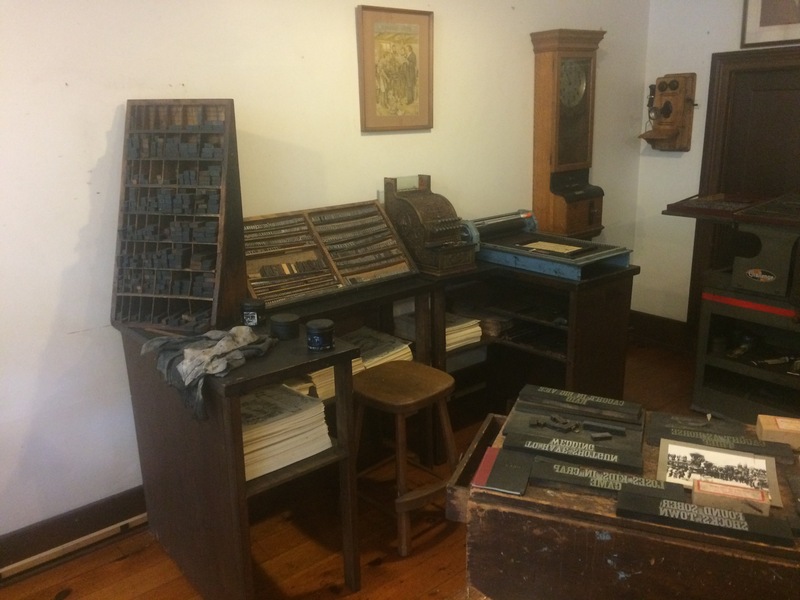 This image shows not only the Post Office, but the Kellersburg Meat Co shop and the Clock shop. 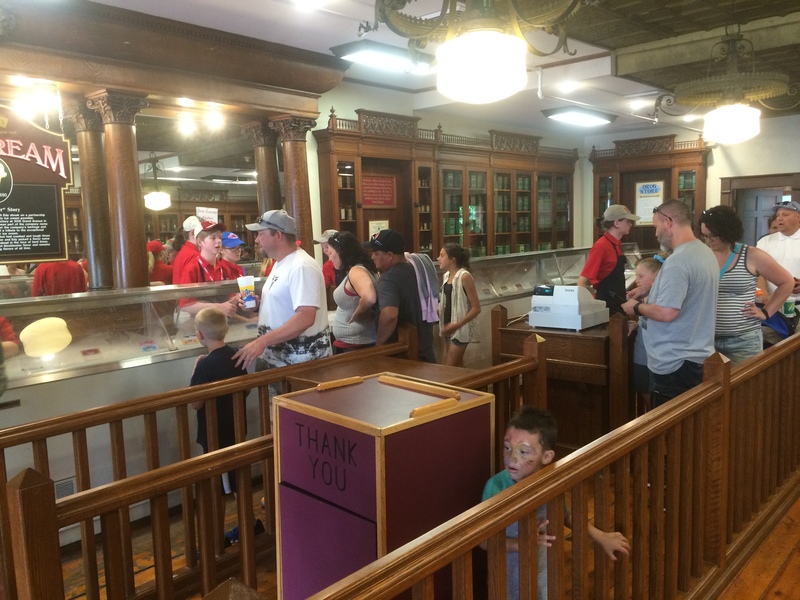 This post office was built in 1905 and used until 1955. 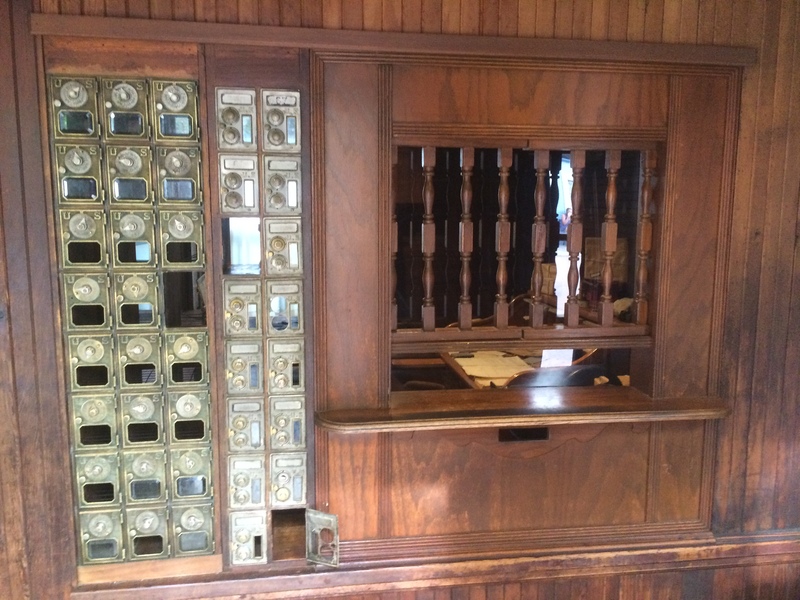 Inside, it has a Postmasters locking desk which sat behind a wall of post office boxes that each had their own unique locking code. 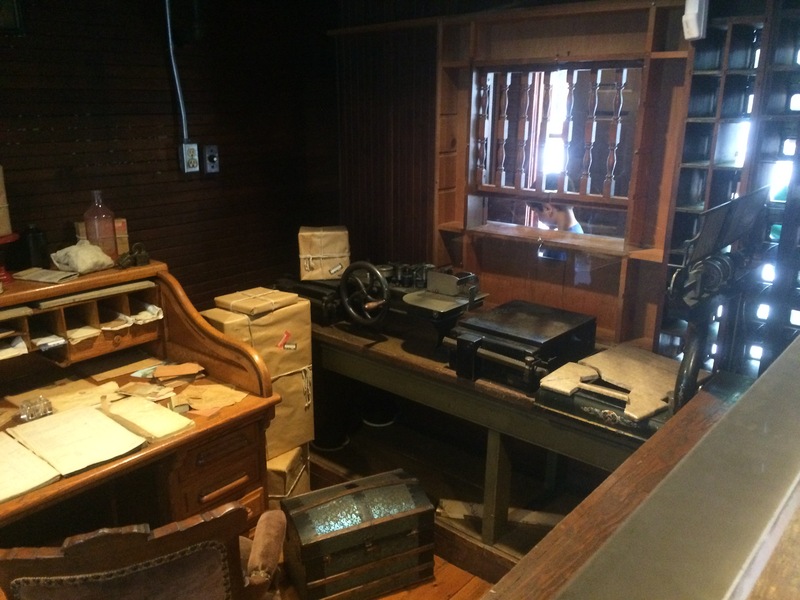 The postmaster would speak to customers through a teller window. 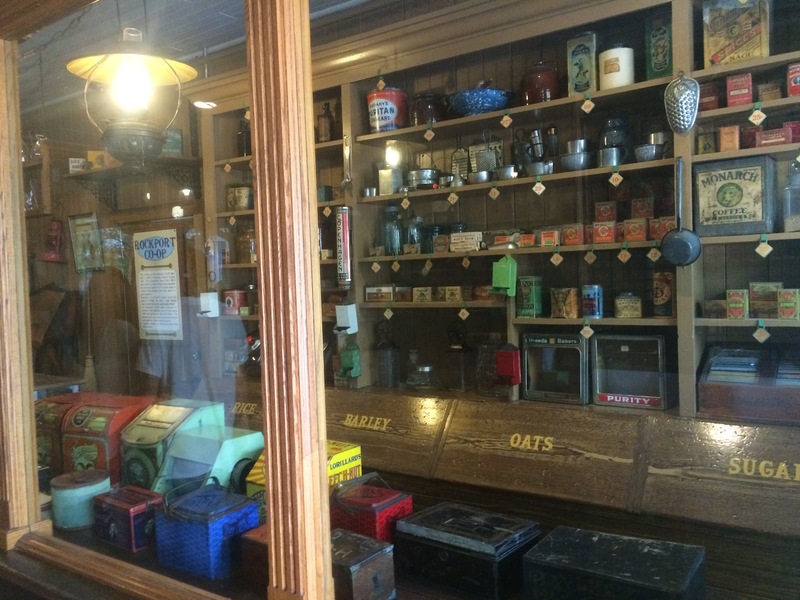 This particular post office is a great example of what a small town post office looked like back then. 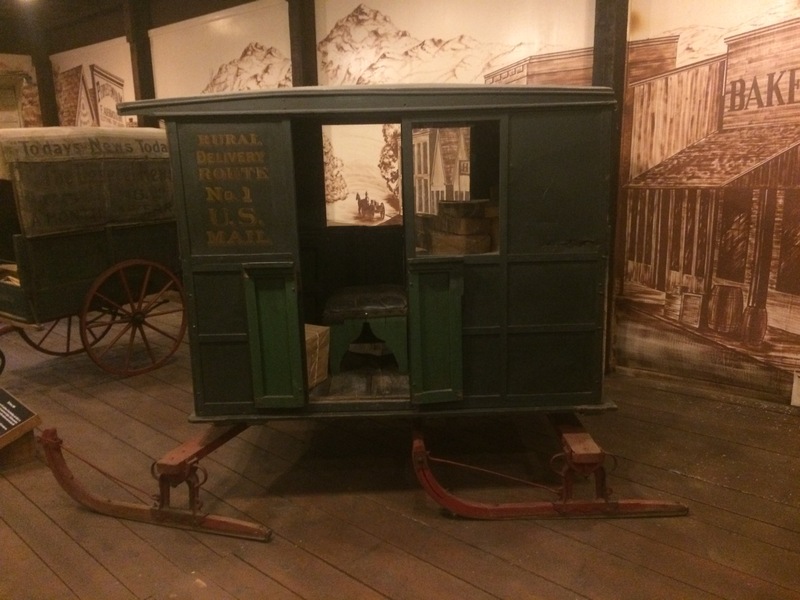 Mail delivery routes weren’t established until the modern age so residents in the area had to come to the post office to pick up their mail. 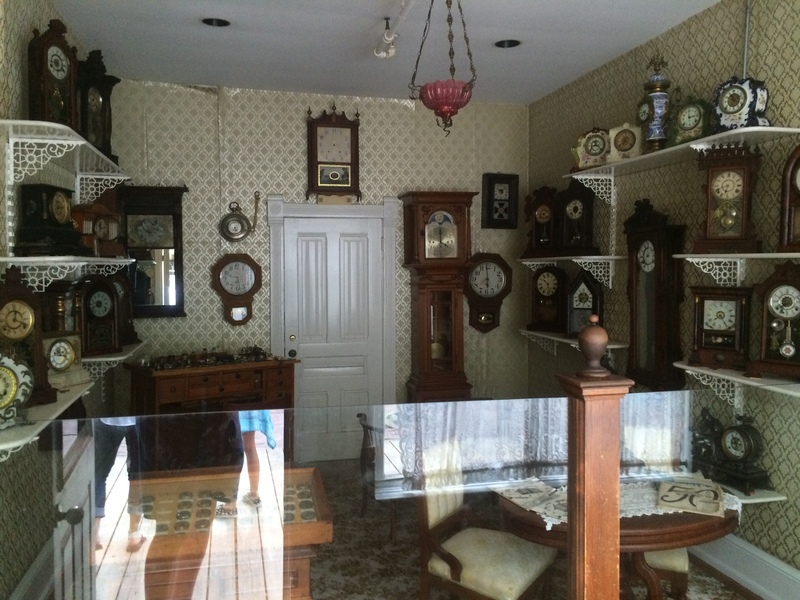 This is where people would go to buy new clocks and watches or get theirs repaired. 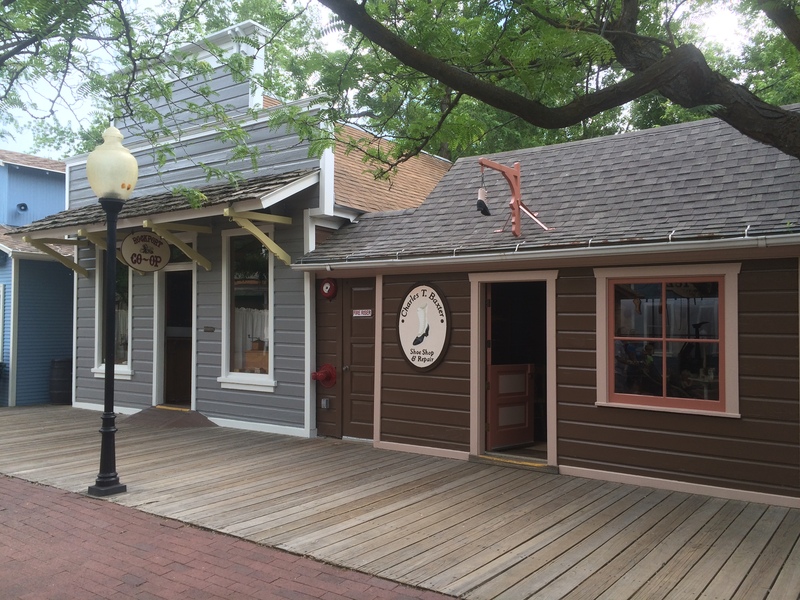 Behind the main street buildings are three more displays and two of them are located in this building. 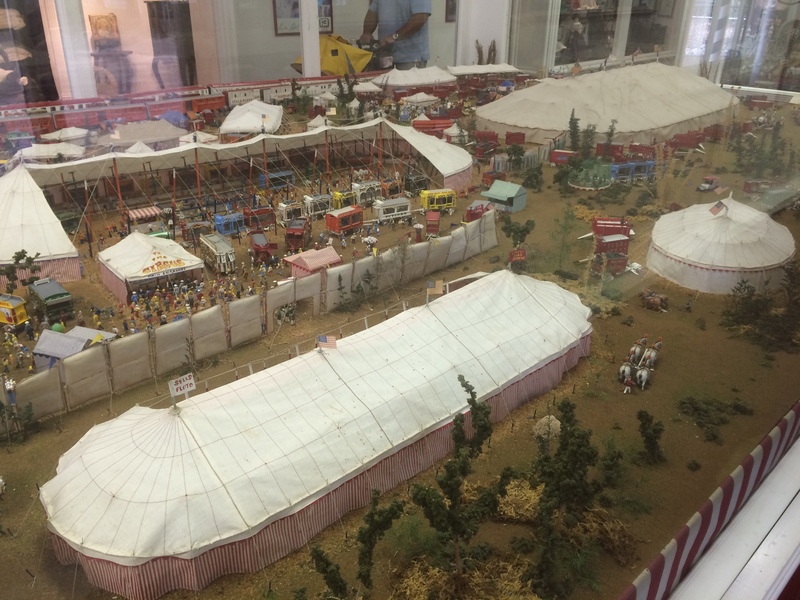 Don Ogden’s Miniature Circus is a miniature model of what a traveling circus used to look like back when they used trains to travel and would just set up in an empty field. 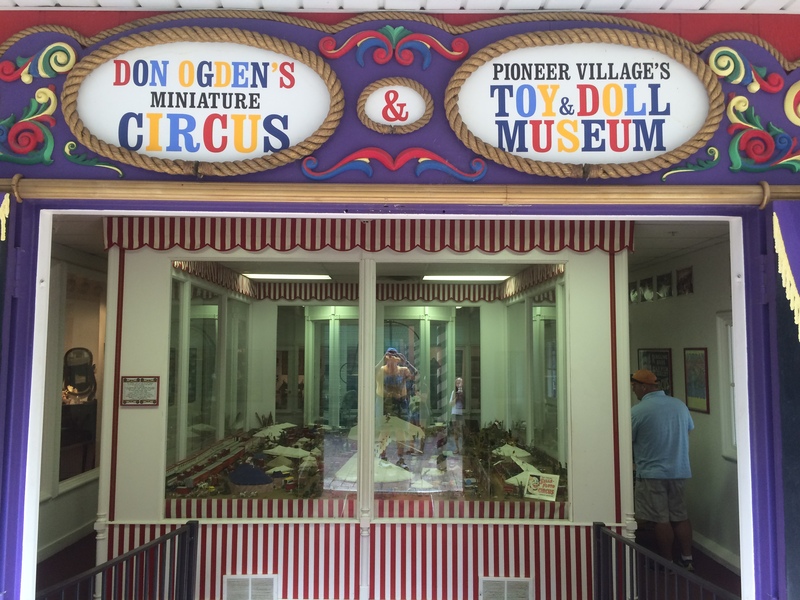 The Toy & Doll museum contains children’s toys from around the turn of the 20th century. 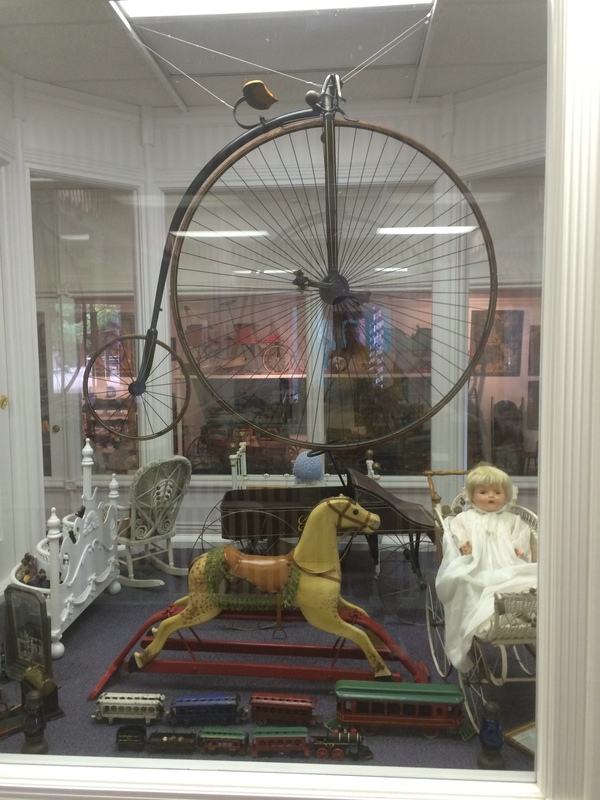 There are several more toys on display but I couldn’t get a good enough photo due to the glare on the windows. 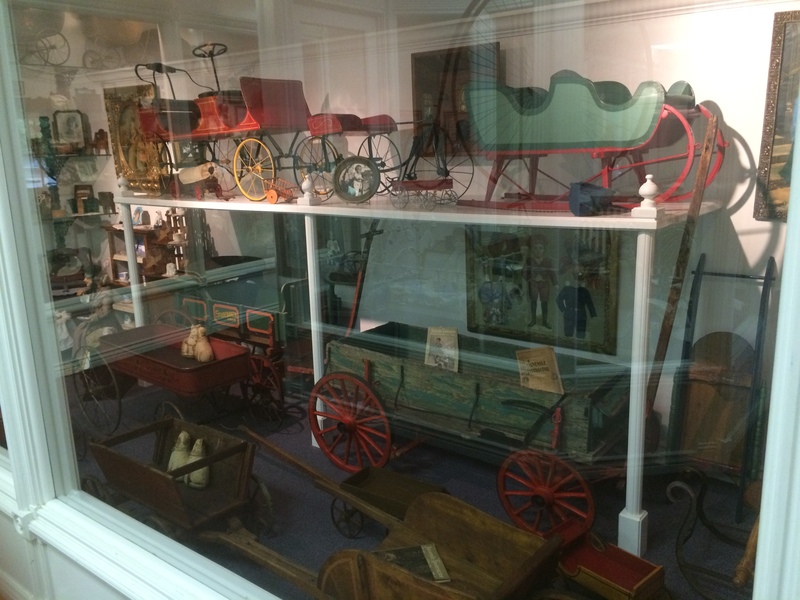 Next up is a large display featuring hand carts and carriages. 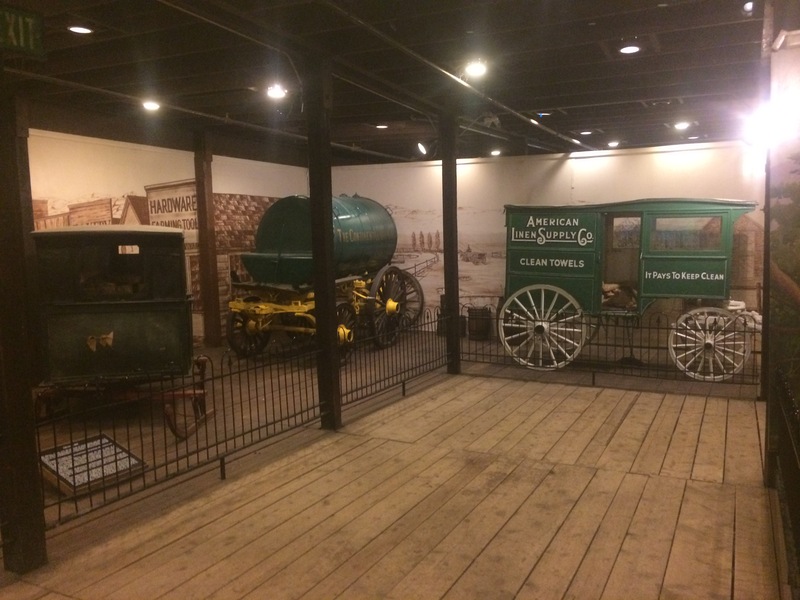 Everyone knows of the covered wagons and personal carriages that were used until the invention of the automobile but not everyone knows about the wide variety of carriages and hand carts that were actually used. 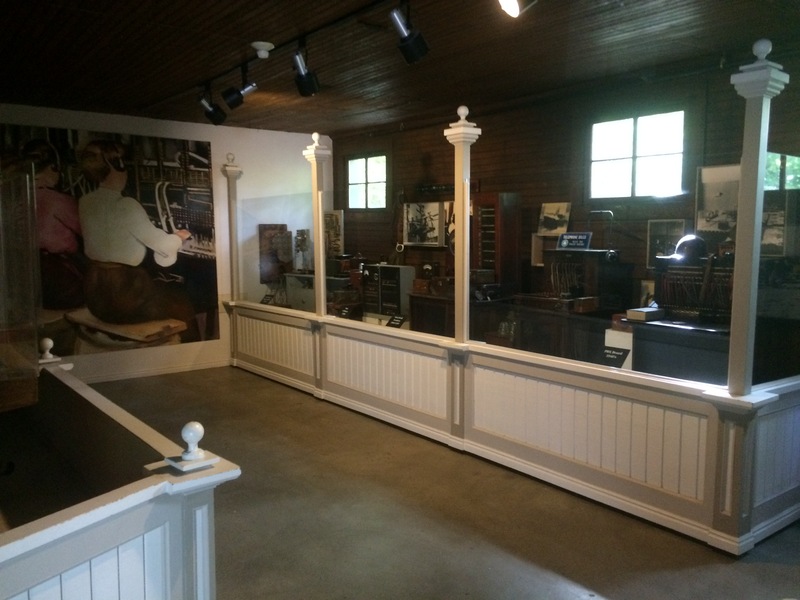 This museum houses some of the major carriage styles of that era. 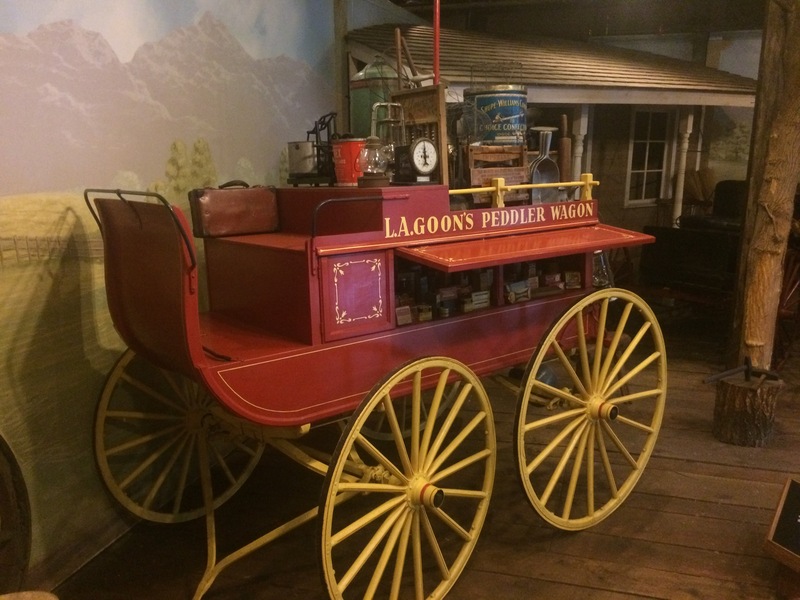 This is a Buckboard carriage that was used by a salesman that would go out to the outlying areas and houses to sell his product which could include the famous “cure-all” elixirs. 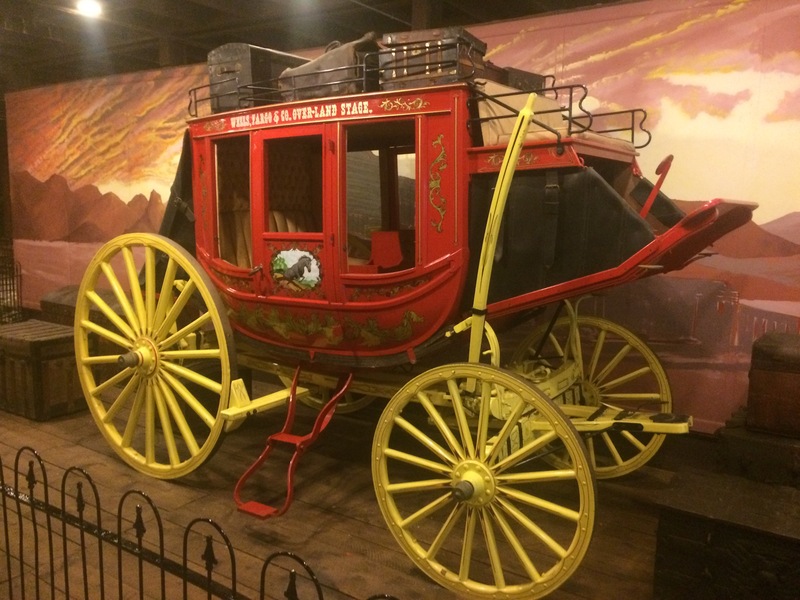 This is the famous “Wells Fargo” coach that was used to ferry passengers and freight from town to town. The company is still around to this day. 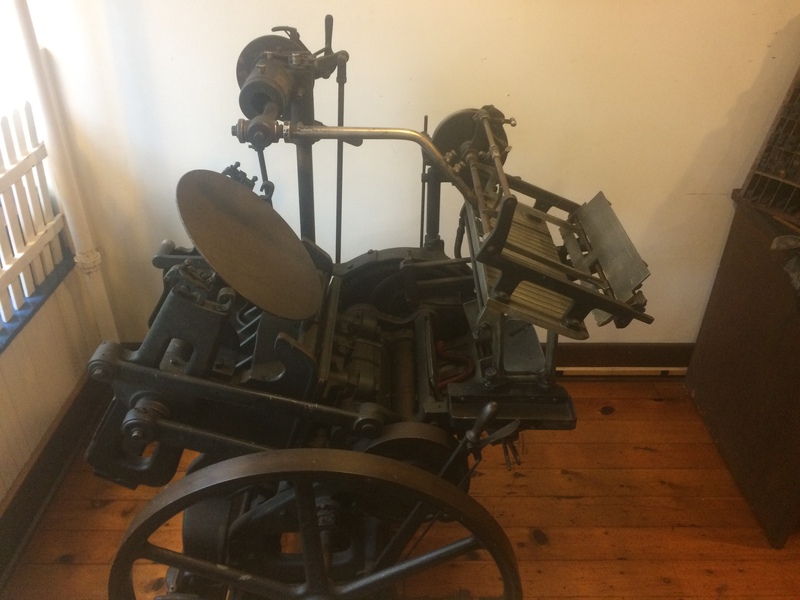 This is a newspaper hand cart from the Studebaker Co. 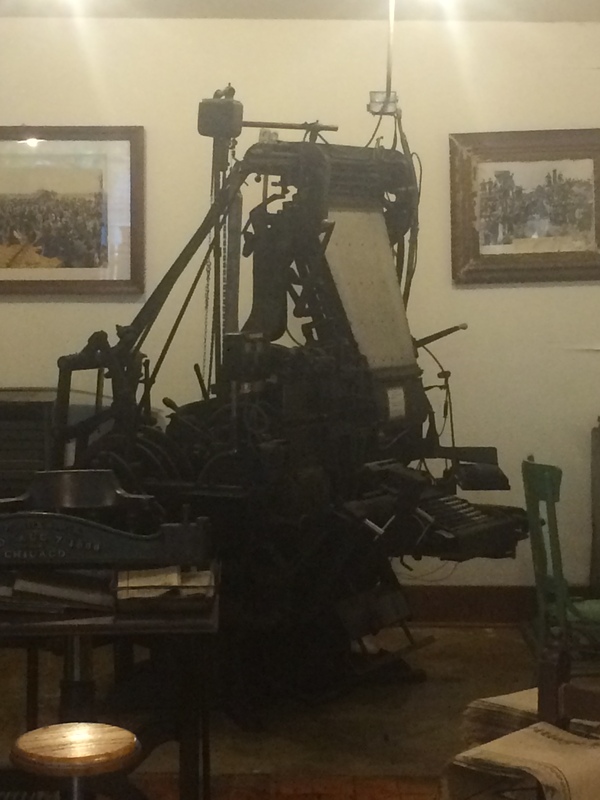 This particular handcart was used to deliver newspapers from the Deseret newspaper which is still in operation today. 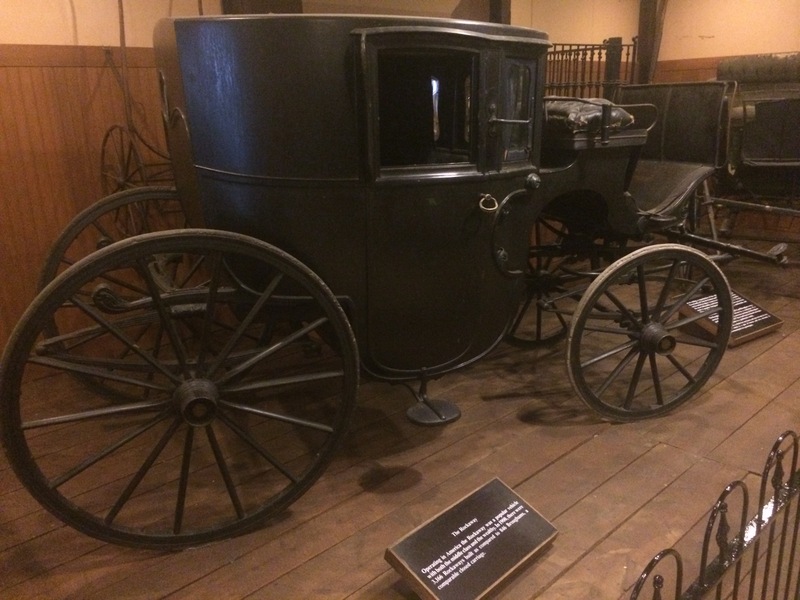 This one is a Rockaway carriage and it was most popular with the middle and wealthy classes. 3,166 Rockaway carriages were built compared to the 846 Broughams that were built and were of a comparable, closed carriage design. These are a few other carriages that are here as well. 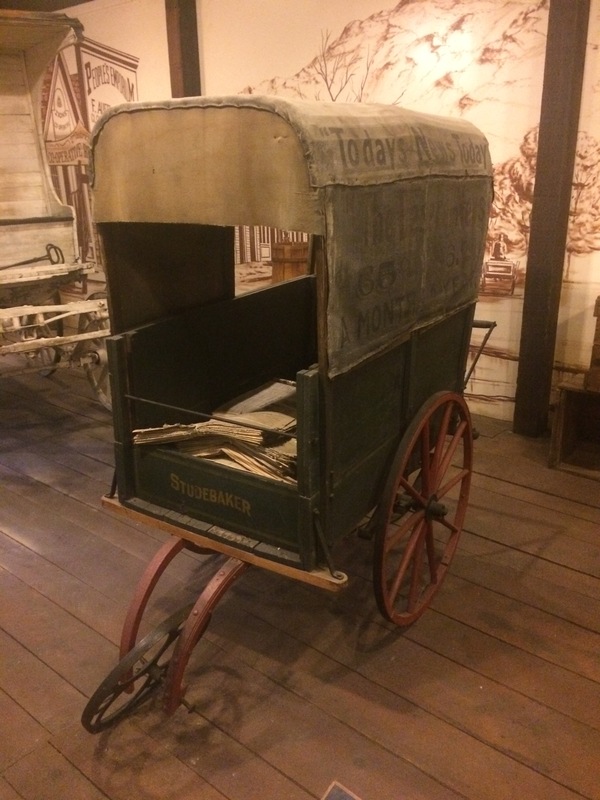 There’s also a White Top Carriage, a Harney Coach which is the only one ever made, a Victoria Carriage, a Brougham carriage, a Peter Schuttler Wagon, a Mormon Handcart, a Surrey Sleigh, and many more inside the Carriage Hall. Now that we’re done with the Main Street area, we’ll head towards the back and do the water rides. 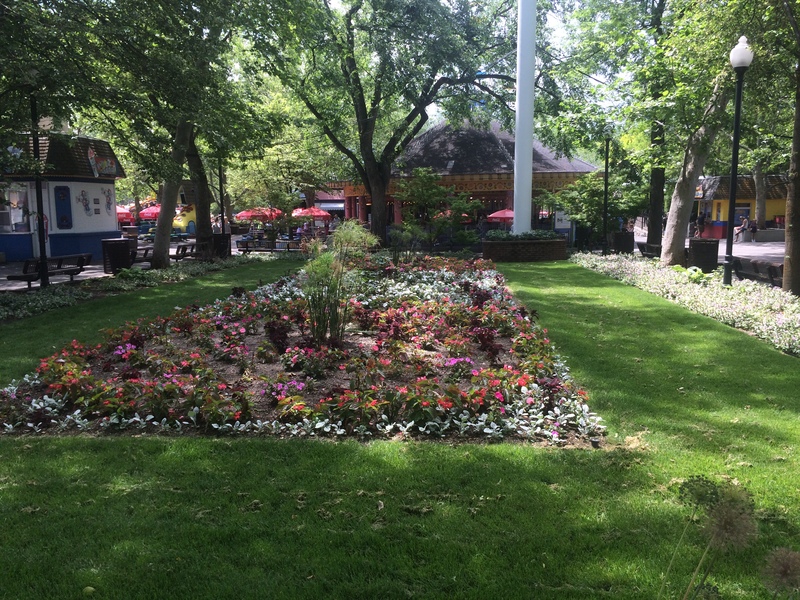 a picnic pavilion, Old Ironsides and enter Rattlesnake Plaza. 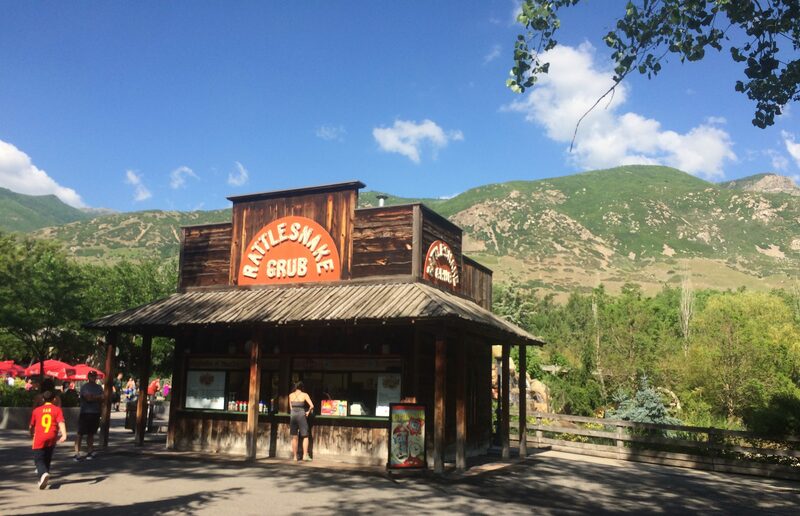 I normally don’t take photos of food stands but the backdrop of the Wasatch Mountains was just too beautiful to pass up. Now we come to the water ride. This ride will get you wet but it appears to not soak riders like the other raft rides I’ve been on. It was installed here in 1997 and looks like it may have been built by Intamin but I’m not really sure about that. Here is an on ride video from Deathbyillusion’s YouTube channel. Now that we’ve gotten wet, we’ll leave Rattlesnake Plaza and Head towards our next ride. 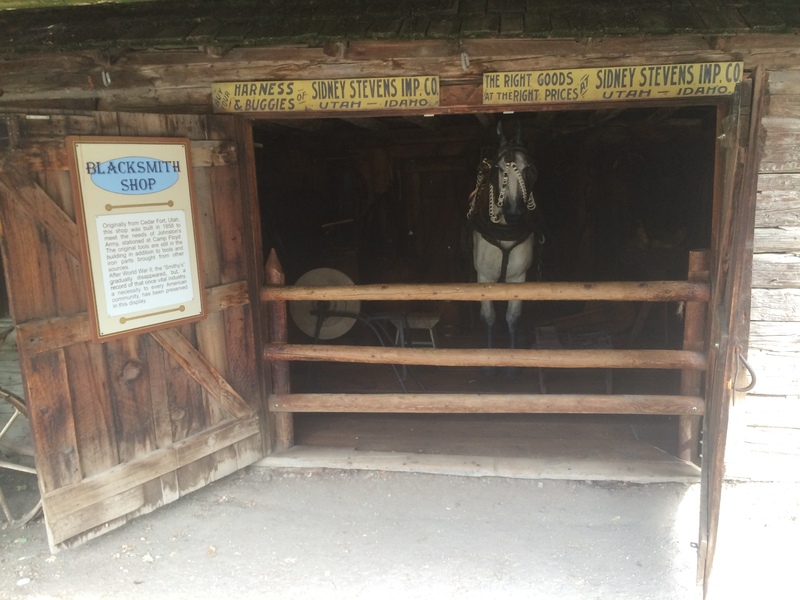 This ride opened here in 1976 along with the rest of Pioneer Village but this ride was actually moved from the now defunct Pixieland Park in Oregon near the small town of Otis. This is a relatively short ride as it is just long enough for a drop but it still is fun none the less. 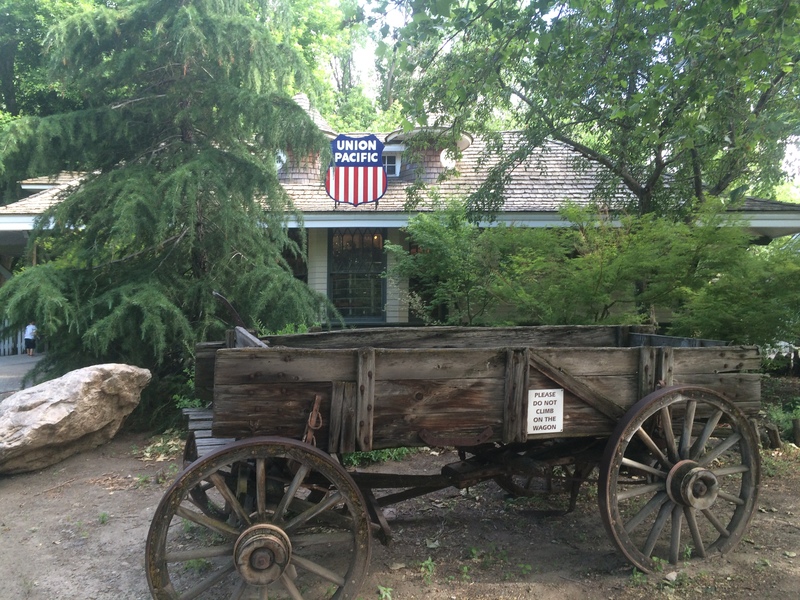 Now we’ll come back to the residential side of the Pioneer Village. I’m doing this from memory so I do apologize if the houses are somewhat out-of-order. 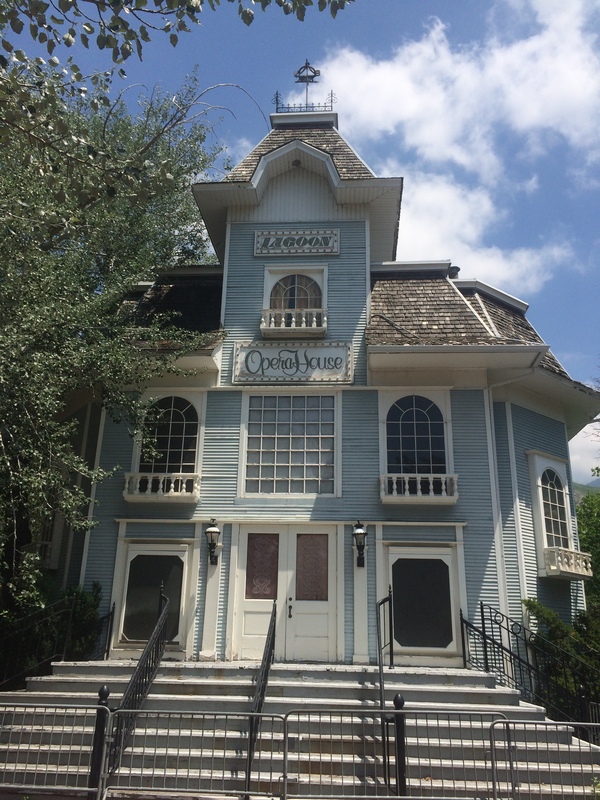 This was one of the first structures built in Midvale, UT and it is of average size for this area. 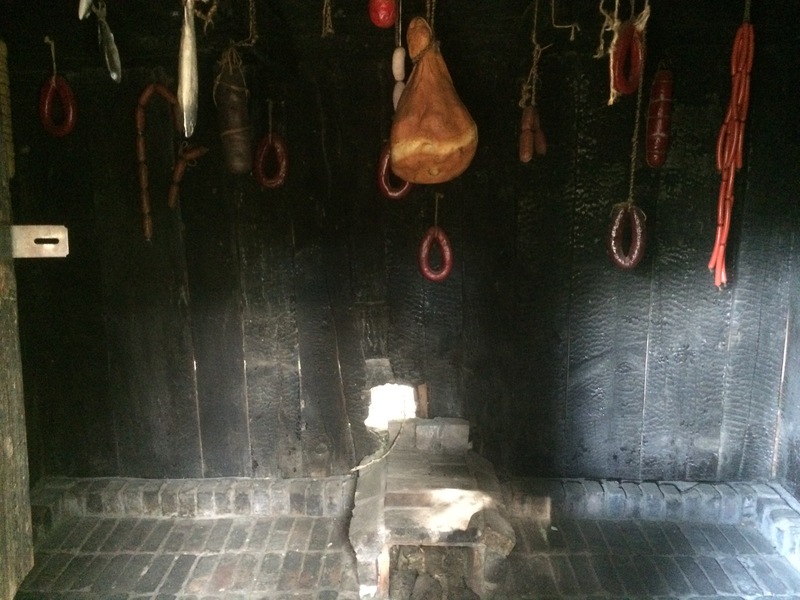 It was built in 1860 and was important as families had to smoke meats to preserve them for the winter months which can be harsh. It was essential to the families but not the most hygienic as meat was hung in strips while a small fire was being tended continuously. Hanging meat for that long meant that flies would cover the meat before the smoke built up. 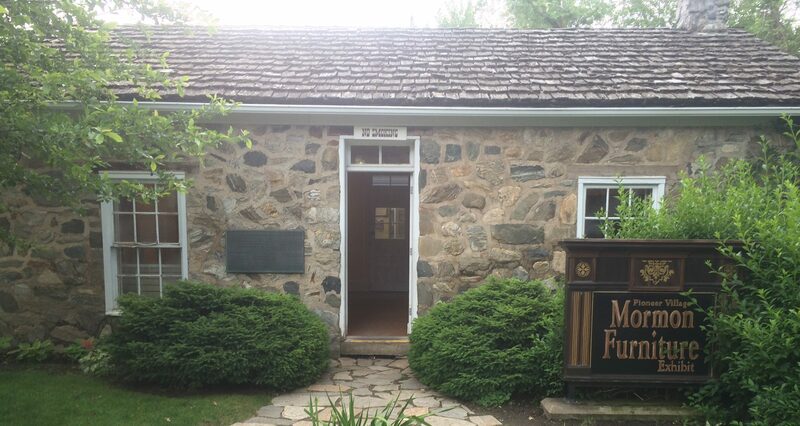 This photo shows two buildings with the one room schoolhouse on the left and the two-story Wanship Cabin on the right. 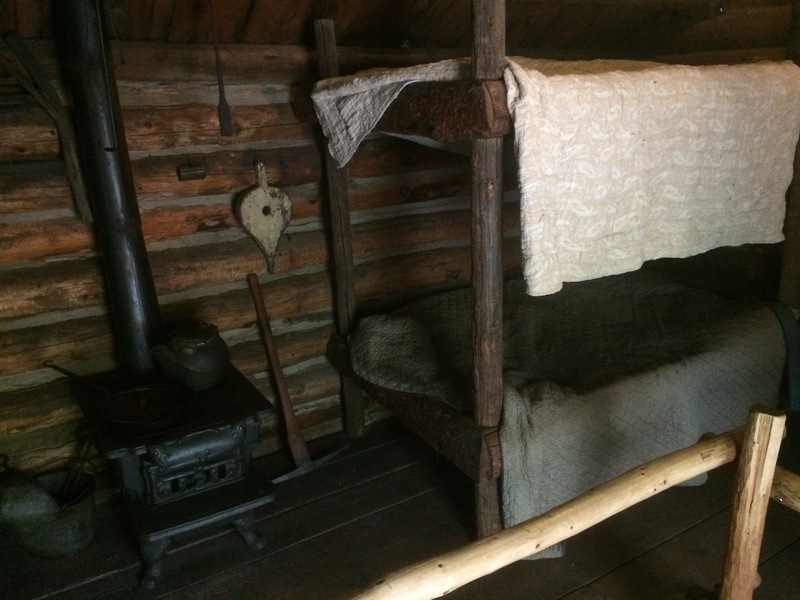 The Wanship Cabin was the first two-story structure that was built in Summit County and was located in the community of Wanship in Utah. 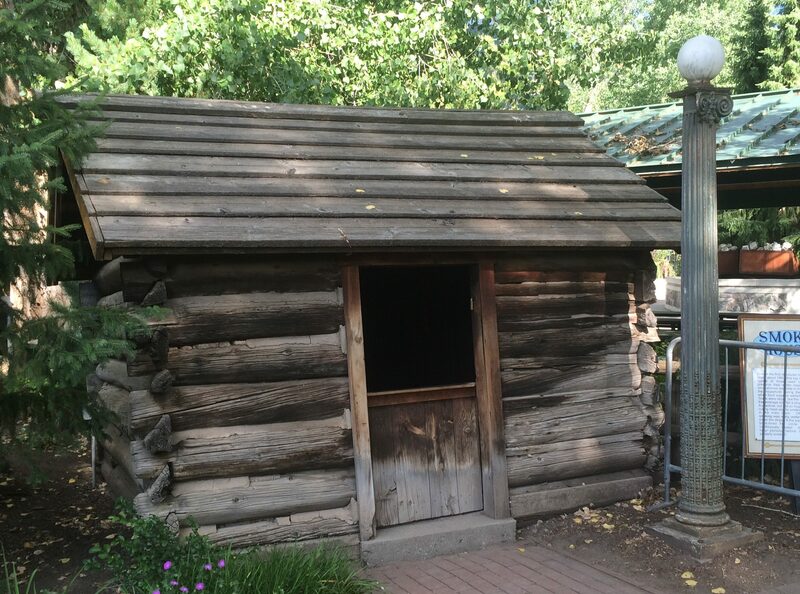 It is a typical sawed log building from the 1880’s and never had any paint or protective coating applied to it which gives it the “desert varnish” look you see today. This house also represents an architectural transition from the primitive one story house and the later framed house. 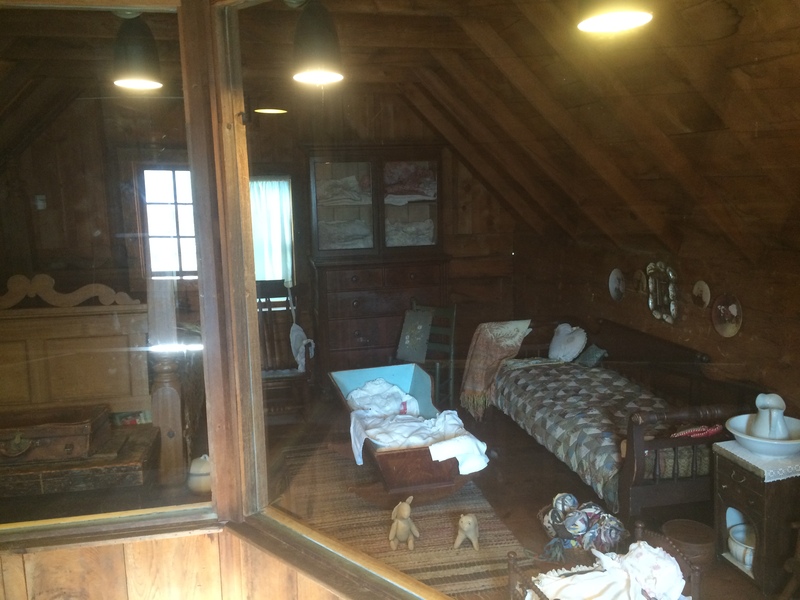 The photos above are of the first floor and the photo below are of the second floor. 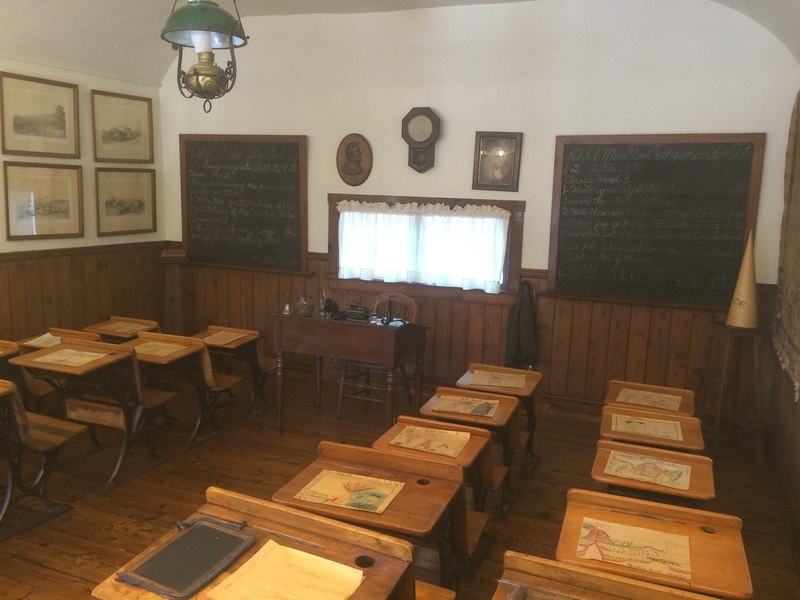 The Schoolhouse is a one room schoolhouse that was typical of the outlying areas and was built of squared off logs in 1870 near Rockport, UT. There was no electricity back then so students had to study using kerosene lamps and the school was heated by a pot-bellied stove. This school was also used as a meeting place for the Church of Latter Day Saints until a proper church could be built. 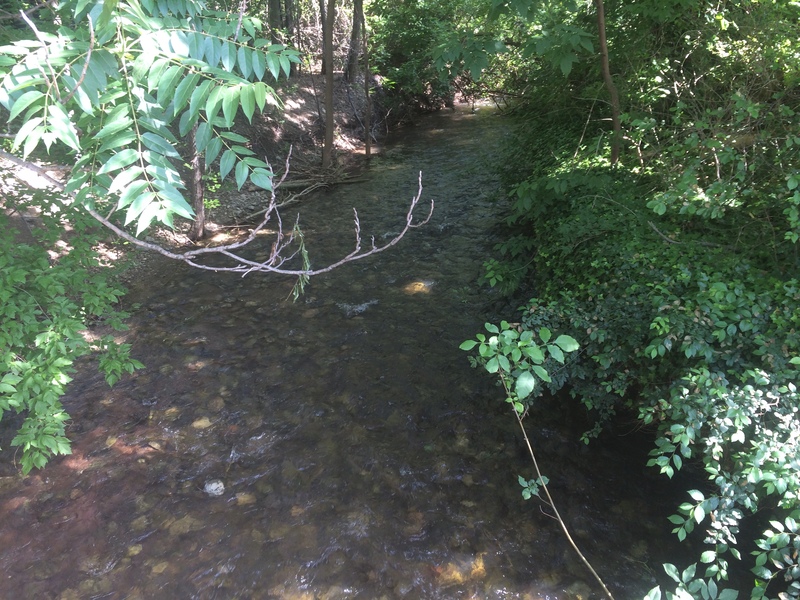 The Rockport area was intentionally flooded by the Wanship Dam in 1957. This building was actually not a church when it was first built in 1863. Its original purpose was a defensive fortress to protect the town against Native American attacks and was built on Main St in Coalville, UT. 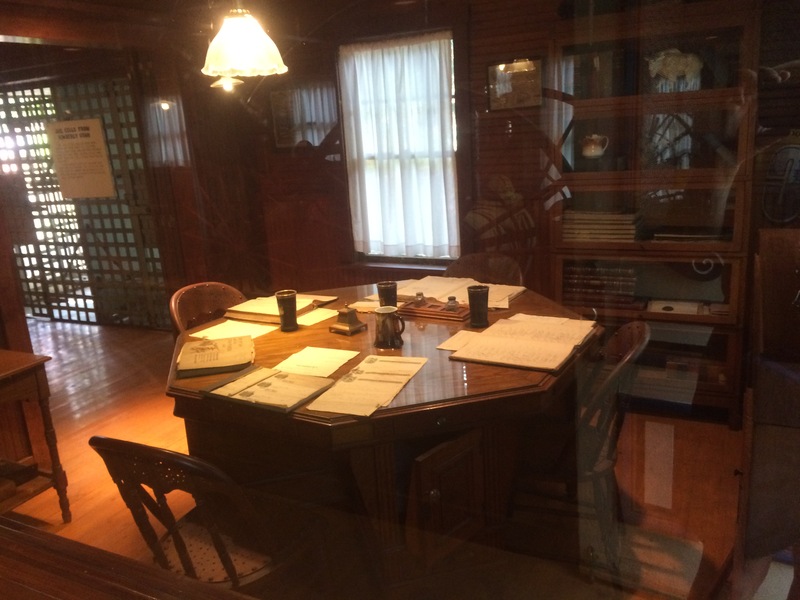 The fortress was then converted into a courthouse with a jail attached to it, then it was converted into a schoolhouse and a community center as the area began to grow. 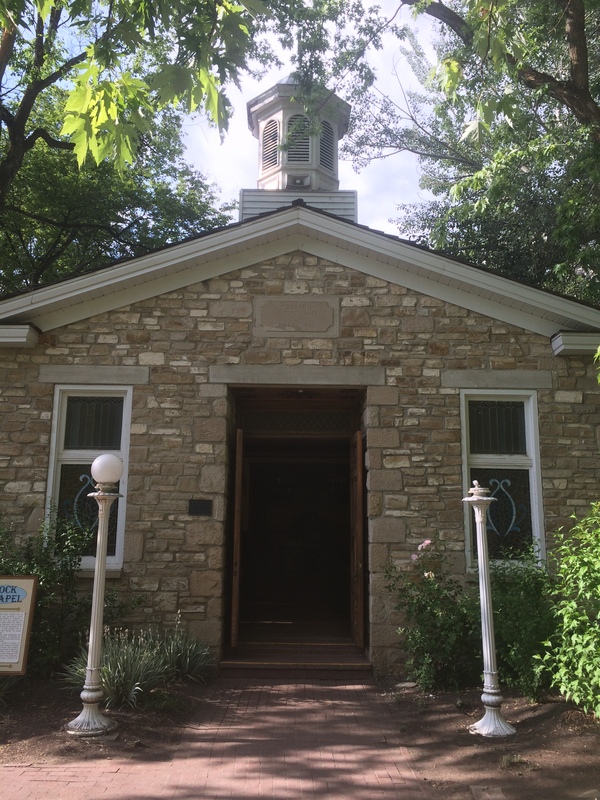 Then, in 1869, it was converted into a chapel and dedicated by Brigham Young as a LDS (Latter Day Saints) church. The pews, lectern, and pot-bellied stove are all original to the church. 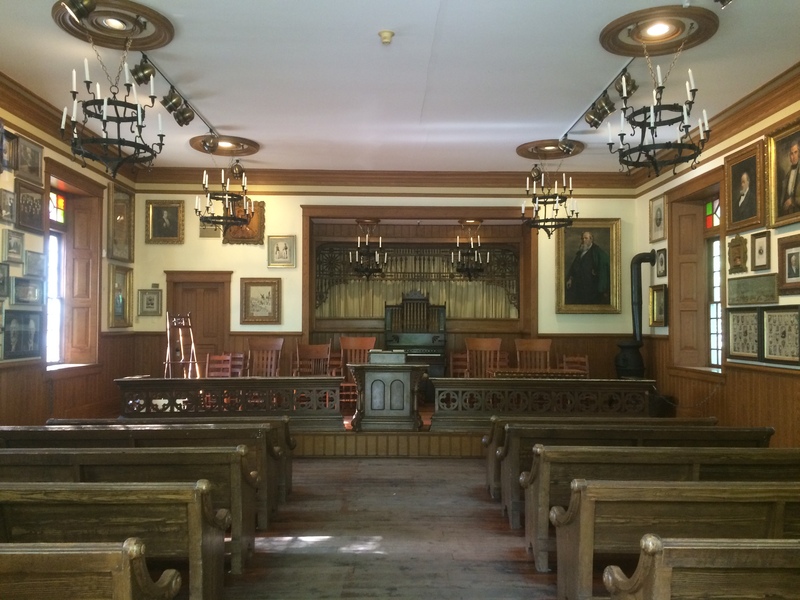 The wall paneling and pews were wood grain stained to give the wood the appearance of being hardwood when they were actually carved from a soft wood like pine. 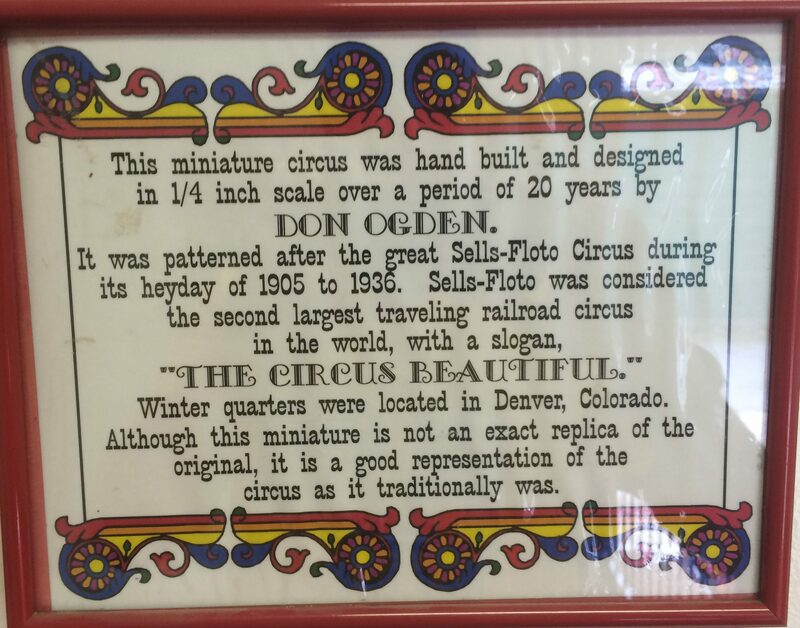 Next up is a piece of Lagoon Park history. 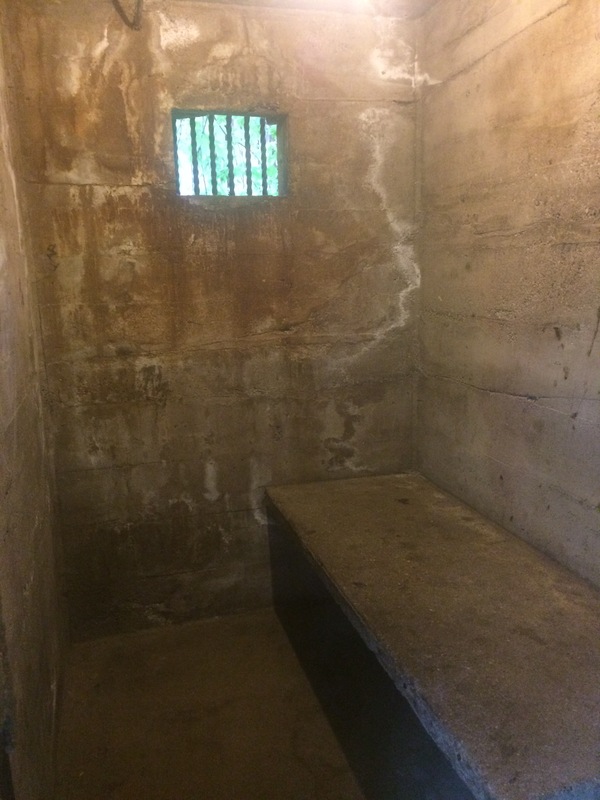 This jail was built in 1859 and was used to house troublemakers all the way up to 1919. 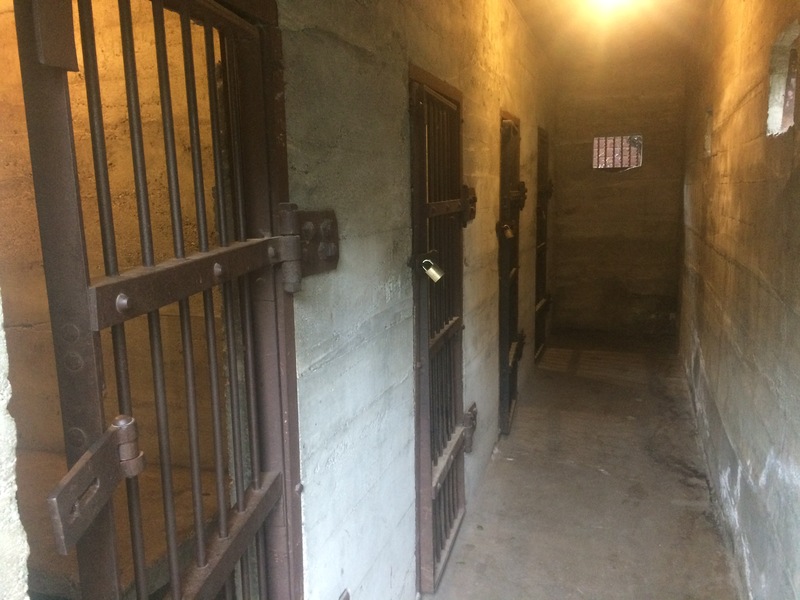 Park employees would lock up those people who had a little too much to drink or those that were causing too much trouble and interfering with the park patrons. They would be kept there overnight and then sent home on the Bamberger Train. This area was also the original entrance to Lagoon from the old railway station. 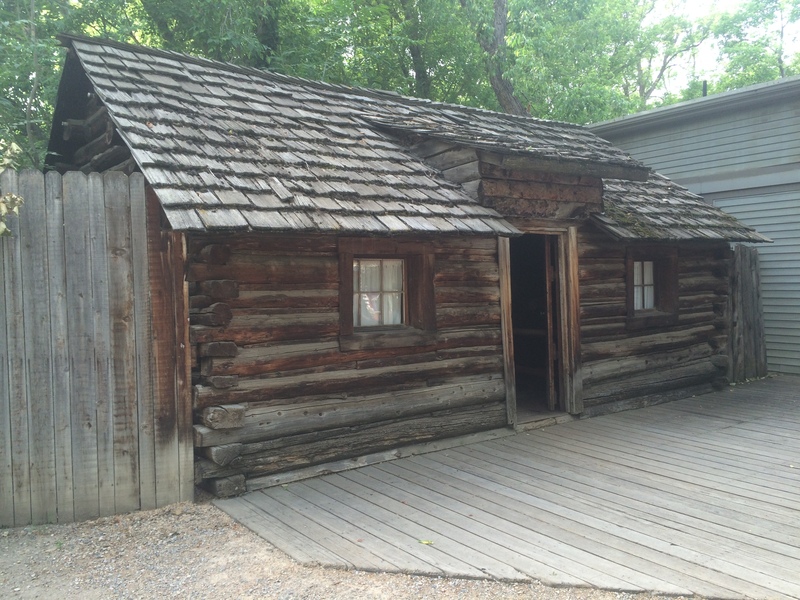 This cabin was built by Jacob G Bigler who was a pioneer weaver in the Nephi area. 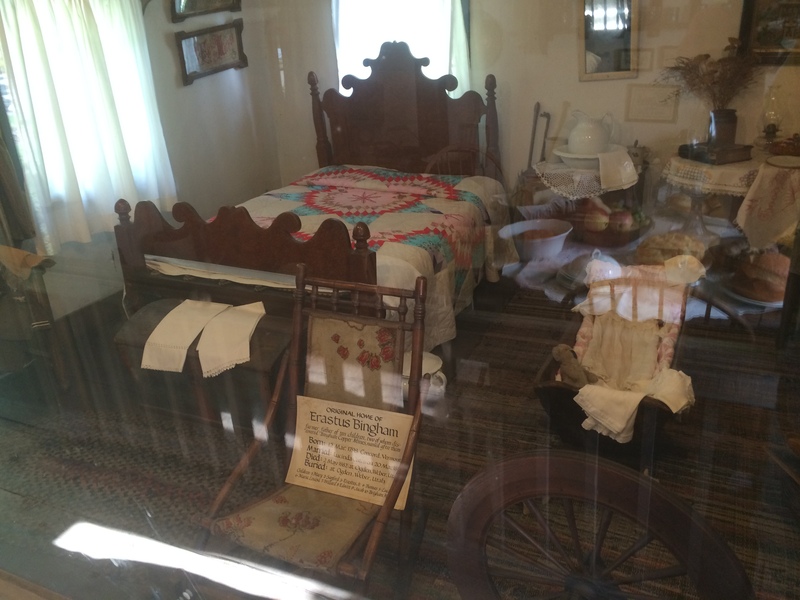 He spun and wove cloth where he lived and used that to trade for things he couldn’t make himself. 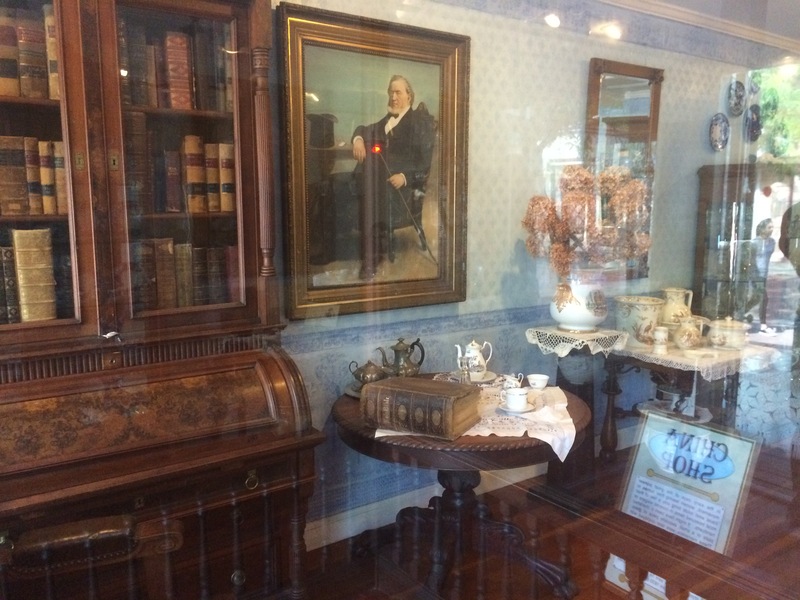 This photo shows two exhibits, Ft Douglas is on the right and the Town Hall is on the left. The Town Hall shows everything that would be in the average town hall for a small town. In the photos above, you’ll see the meeting space where the town council or other elected officials would meet in the photo on the left. 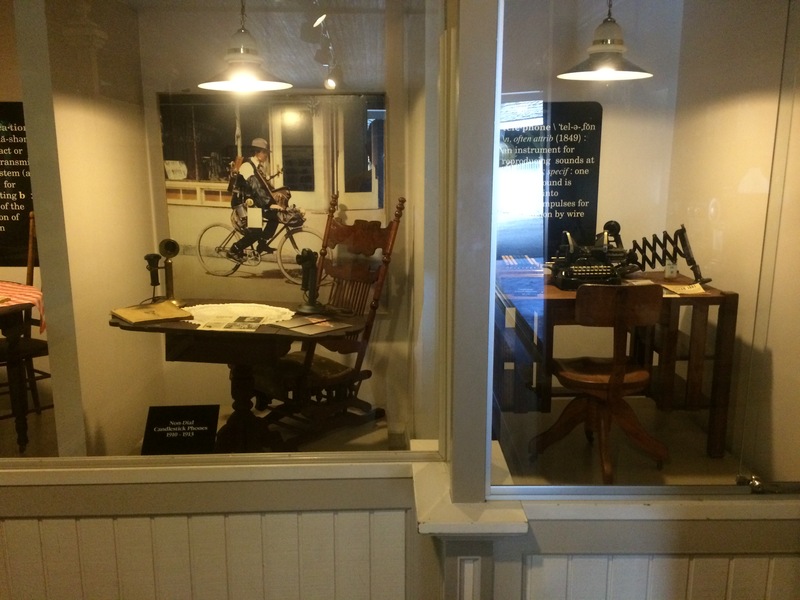 The photo on the right shows what the town jail and police/sheriffs department would look like. Notice the open air jail cells in the back. The photos below show what an average fire department would look like. 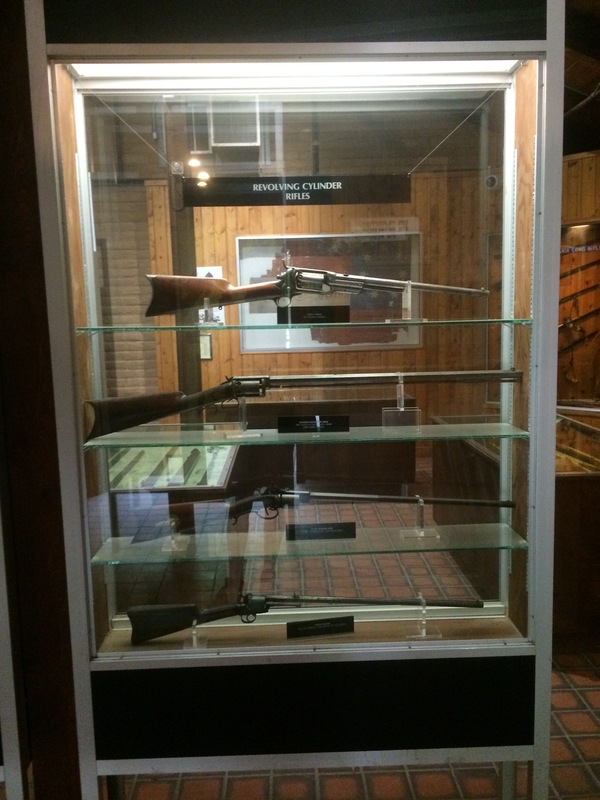 The next exhibit is the Gun Collection which is housed inside a full-scale mockup of the Ft. Douglas Ordinance Building that was built in 1860. 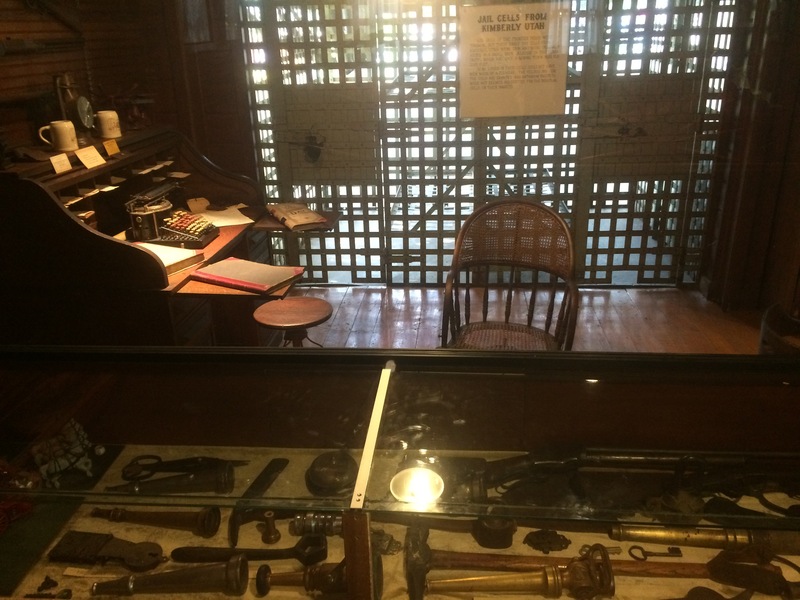 The weapons inside are from the Medieval Era up to the modern times. 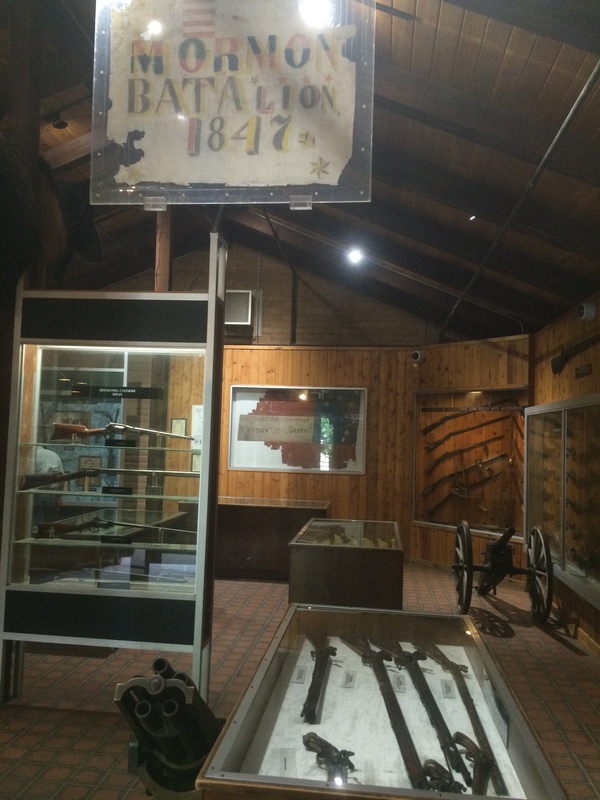 Many of the guns are from the American Revolutionary and Civil Wars. 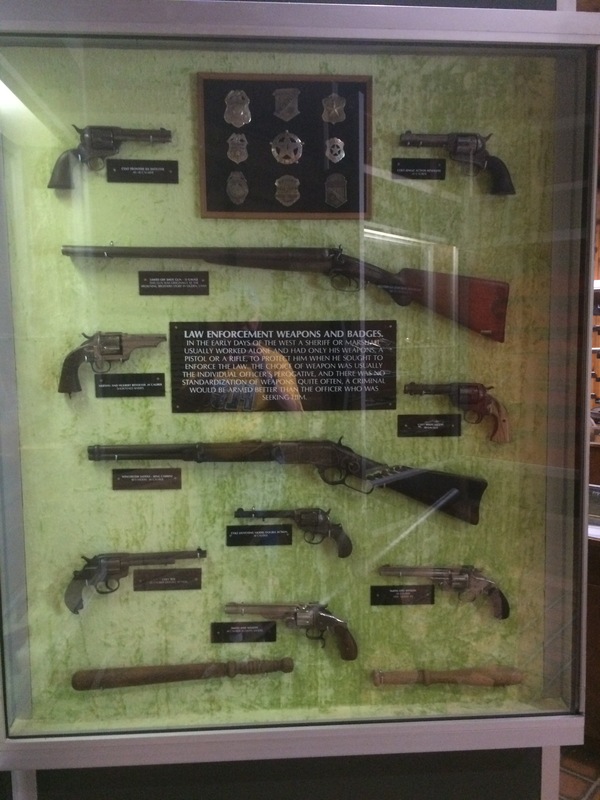 There is even a safe that belonged to Porter Rockwell as well as some of the first guns invented by John Browning. 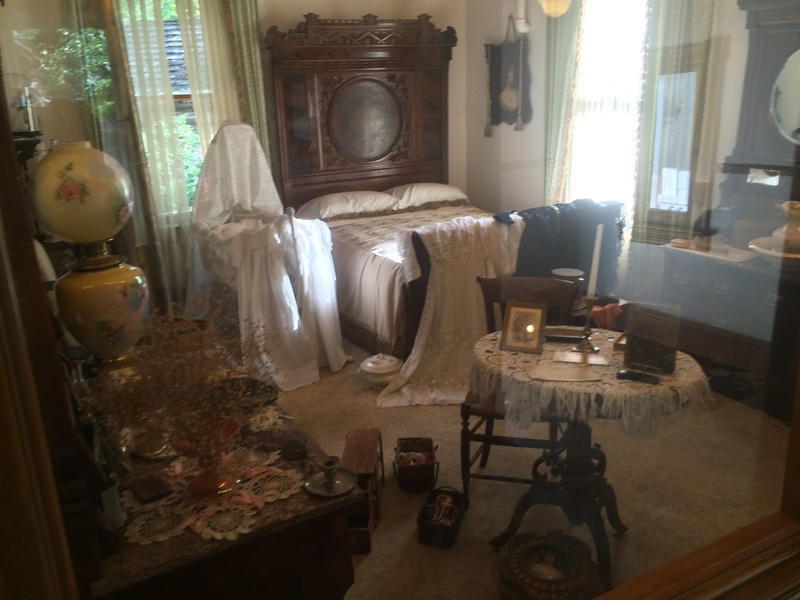 This house came from the Rockport area and was built by Alma Gibbons in 1904 for his bride, Cora Melissa Judd. 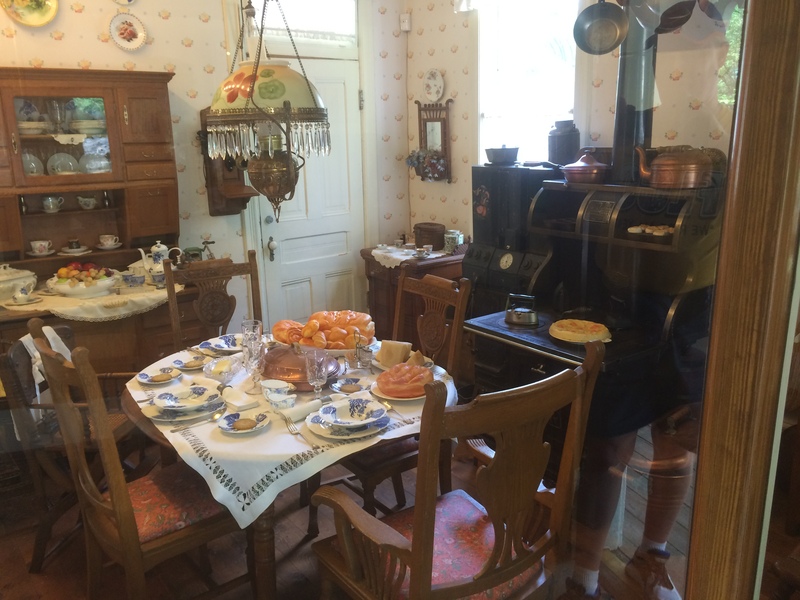 Alma built the house with his own two hands by cutting the trees, and carving the Gingerbread trim himself. Building Gingerbread homes is considered to be a folk art and people like Alma made their own designs. 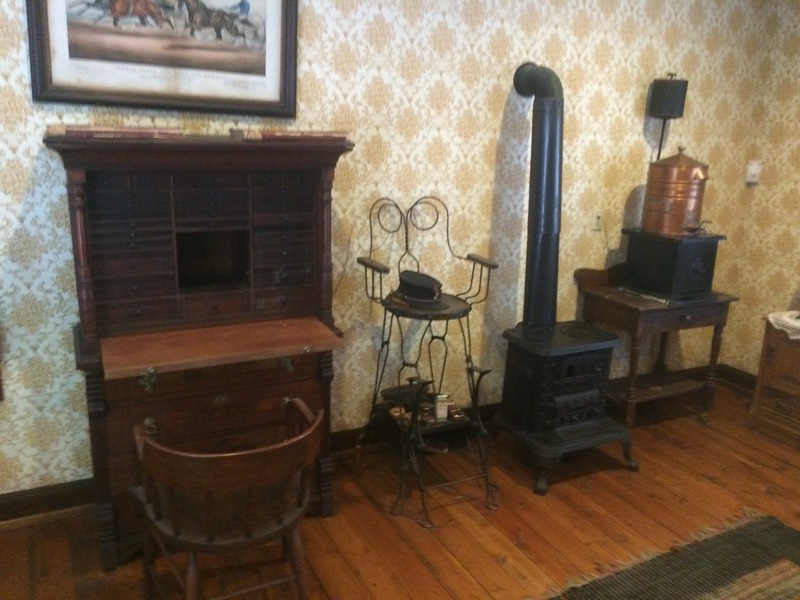 The furniture inside is not original to the house but was acquired from similar homes of the same time period. 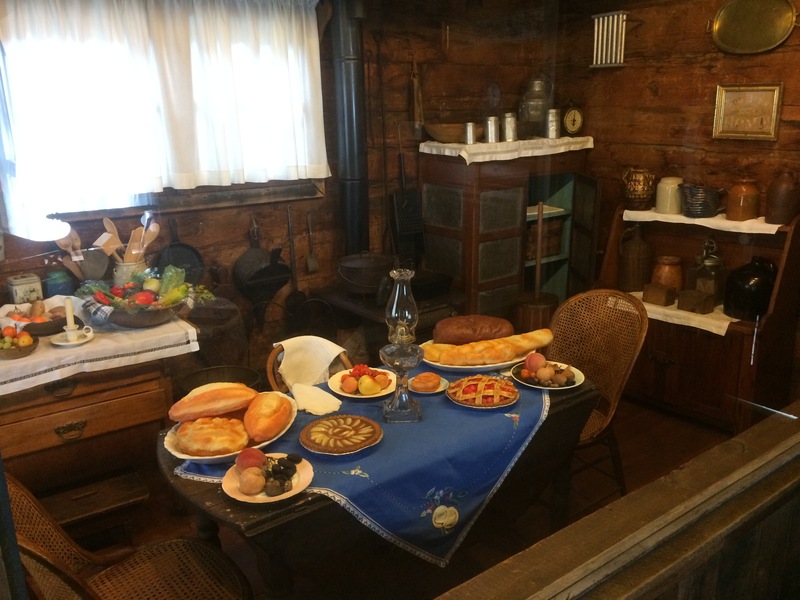 This is the last display in the Pioneer Village Area and it is impressive. 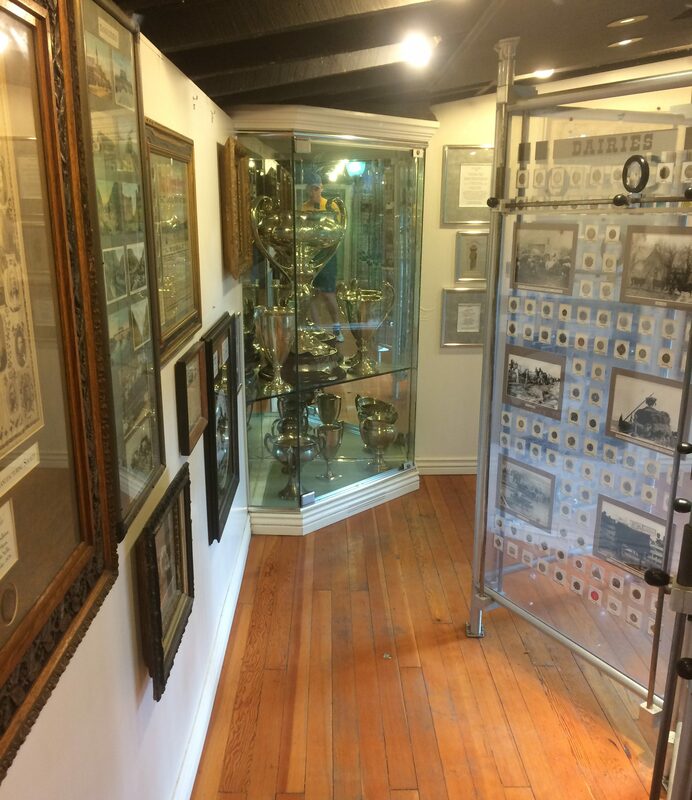 It contains a vast collection of antique coins and paper money, tokens that could be redeemed for products, food, or services, and silver that was, and still is, being mined in the area. 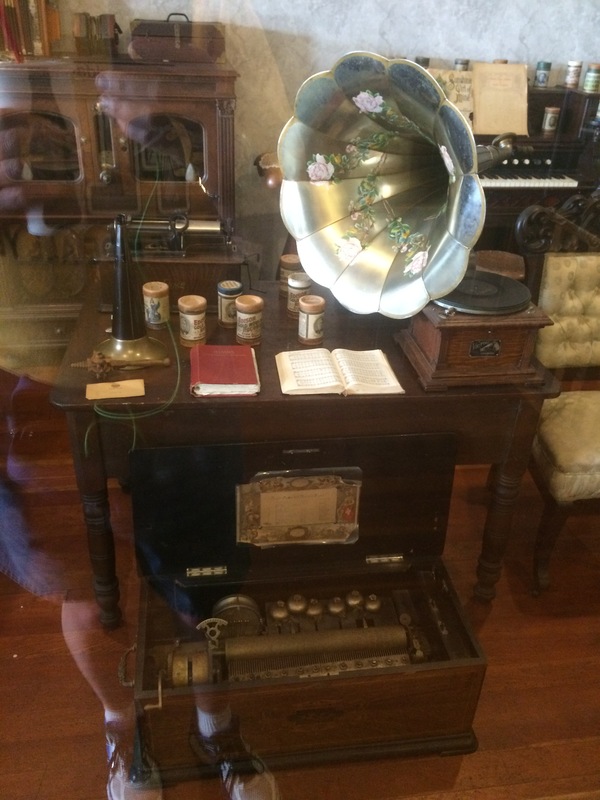 Be careful as it is quite easy for the numismatist (those that are collectors of currency) or historian to spend a few hours admiring this display. Now, we’ll head back over the river, pass Lagoon-A-Beach and the lagoon and enter our next area. 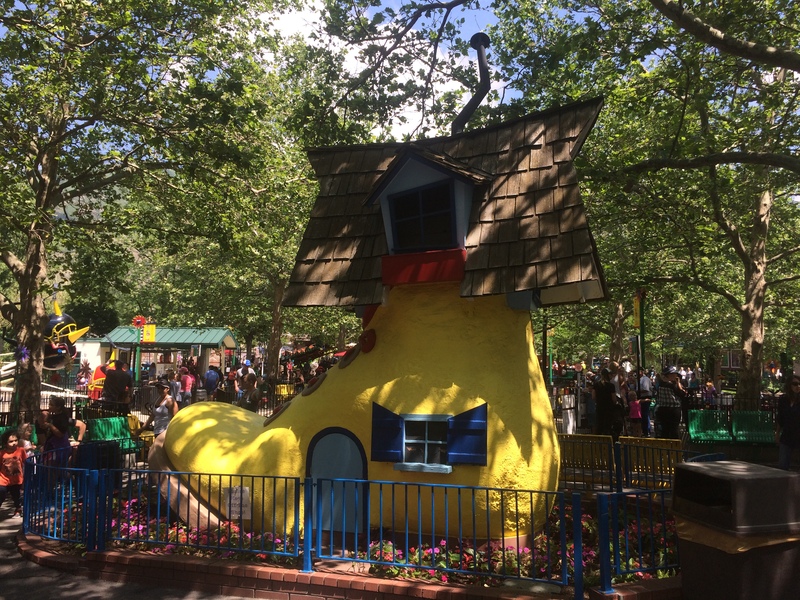 This area first opened in 1956 as Mother Goose Land and there are really two relics that are still around from the Mother Goose Land days which are the Speedway Jr ride and this “Old Woman Who Lives in a Shoe” statue that you see above. The Mother Goose theme was dropped some time later and renamed Kiddyland. This area contains rides that are only for children. There are several rides for the kiddies here but I did not photograph all of them so those that weren’t photographed will be described at the end of this section. Now let’s head to our first ride. This is a small airplane type ride that was installed here in 1984. Riders can actually control the height their plane by pulling or pushing the joystick. 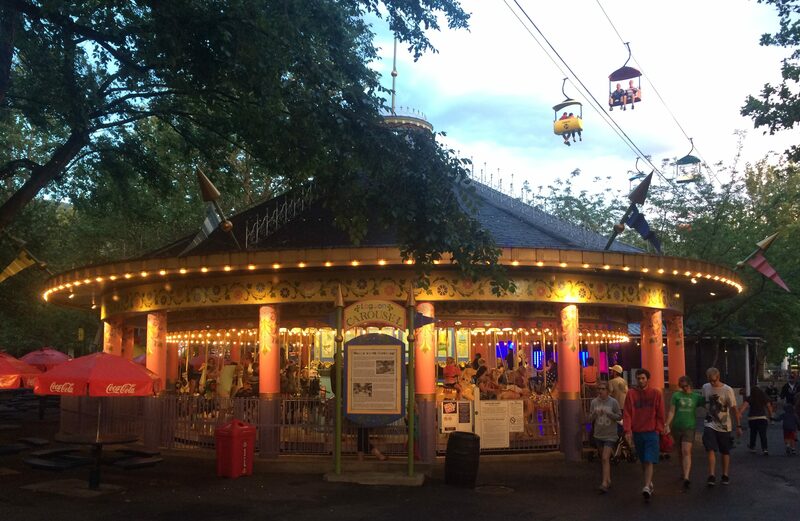 This is an antique ride that was installed here in 1954. The kids can even fire the ray guns that actually make sound when fired. This is a Small-Tivoli kiddy coaster from Zierer that was opened here in May of 2005. It is 197′ 5″ long, 10′ 8″ high, and has a top speed of about 16 mph. 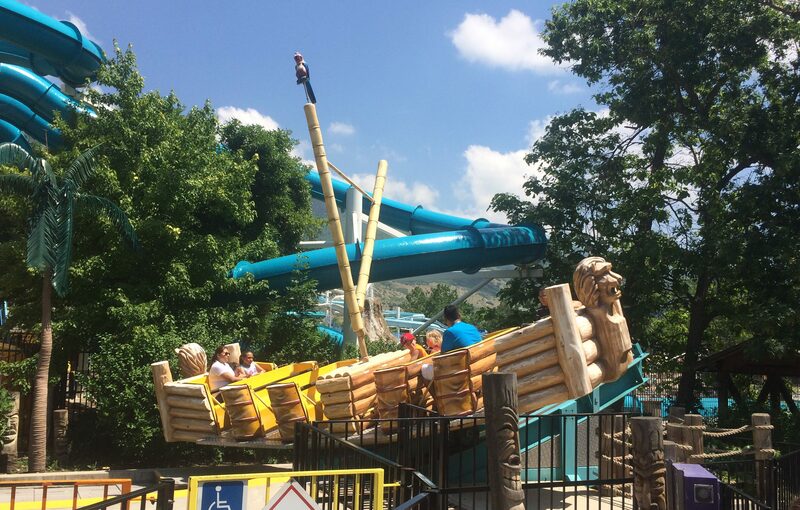 This ride was installed here in 1963 and like the Scalawags, riders can control how high they can go by using the control stick inside each vehicle. This ride was installed here in 1978 and is a kiddy car type ride. This is a twister type ride for kids that was installed here in 2004. 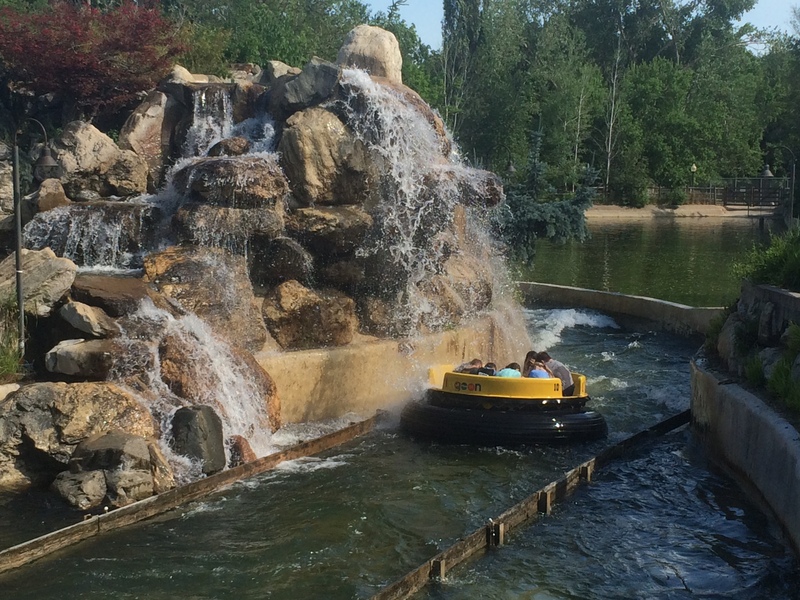 This is a spinning boat ride that rocks back and forth while gently spinning. 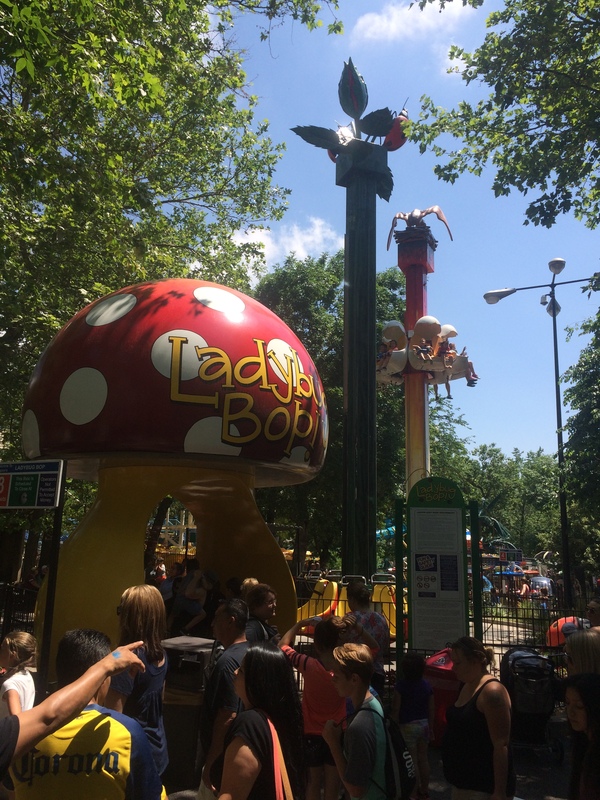 This one is actually two rides with Ladybug Bop in front and Dinosaur Drop behind it. 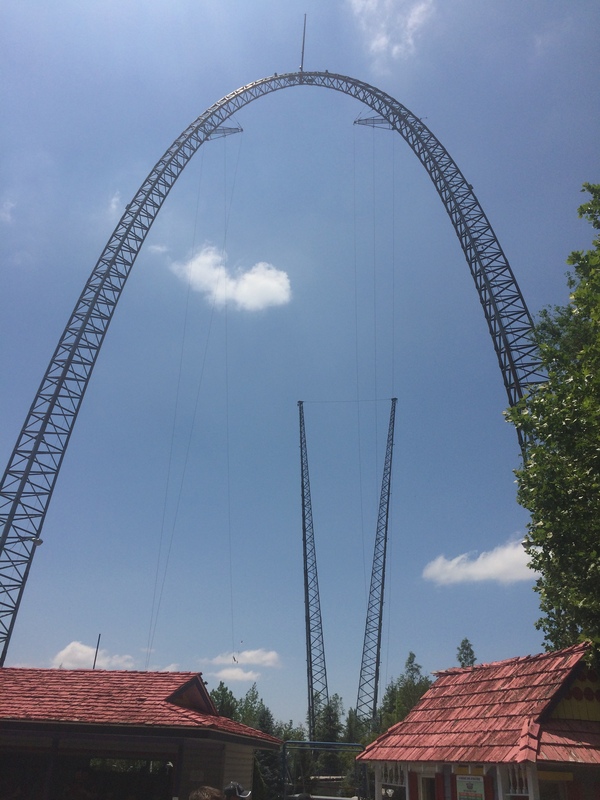 Both of the towers are 40 feet tall and rises and drops several times during the ride cycle. This coaster was literally designed in-house by ART Engineering and has a custom-made soundtrack that plays during the ride. 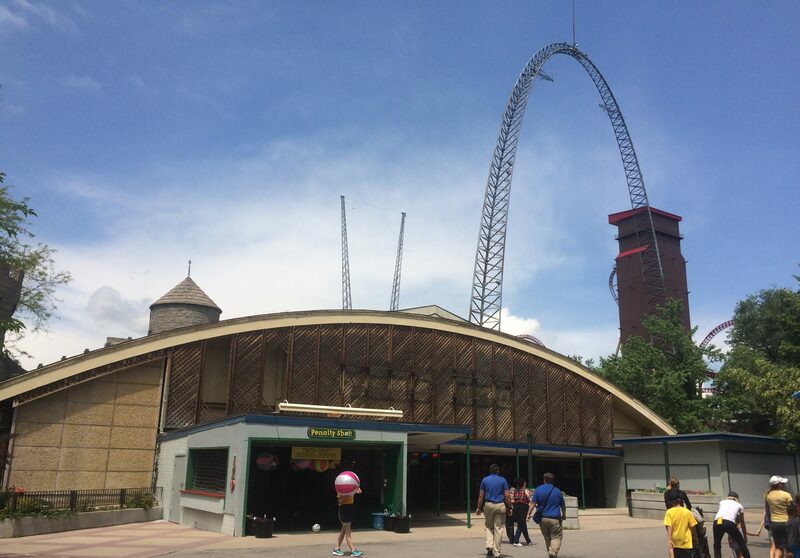 It opened here on April 2, 2011 and is 1,040′ long, 45′ high, and has a top speed of 31 mph. Here is my off ride video of the coaster. This ride is basically a much nicer version of the Musik Express that is in the southern part of the Midway. This was installed here in 2009. 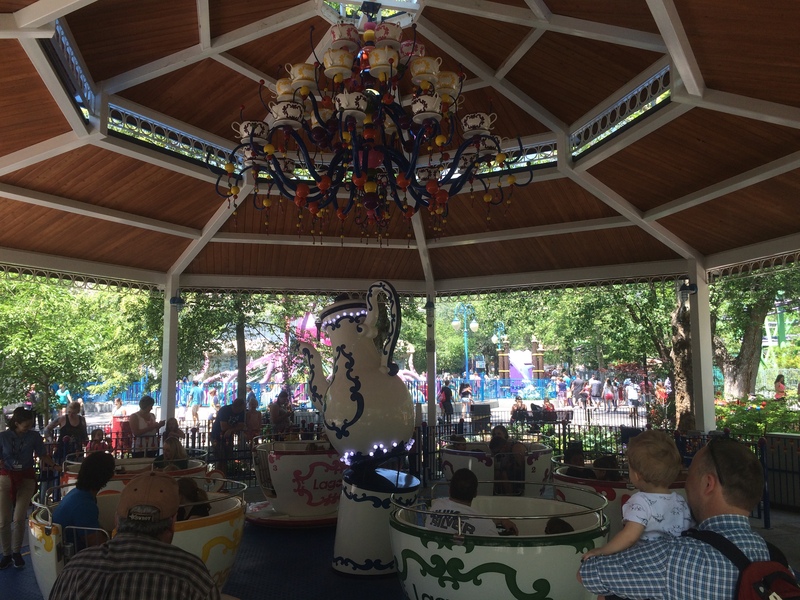 This is a kiddy version of the classic Tea Cups ride that was installed here in 2013. This was installed here in 2008 and it will get you wet if you’re not paying attention. Here’s my off ride video. Next up is a family coaster. 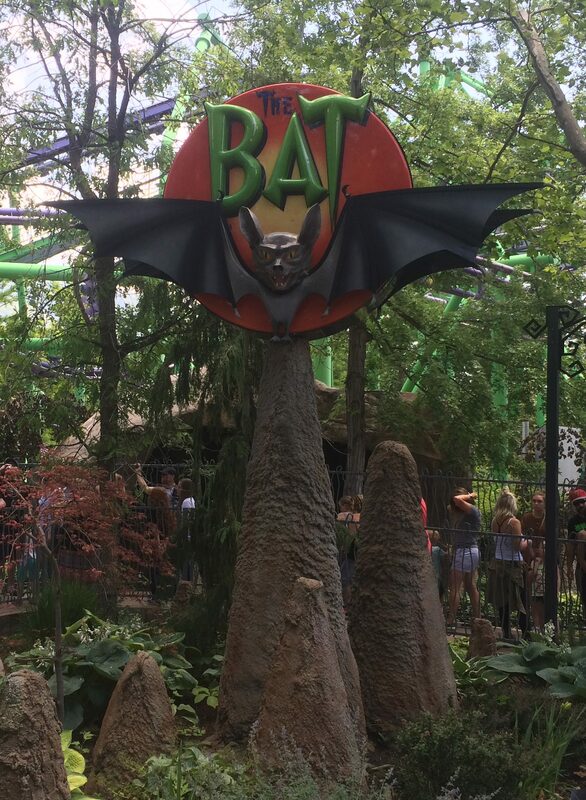 The Bat is a 342m Family Suspended Coaster model from Vekoma that opened here on April 16, 2005. This coaster is pretty fun with the fact that there is no floor so your feet are left dangling throughout the entire ride but fear not, you are absolutely safe riding this roller coaster. 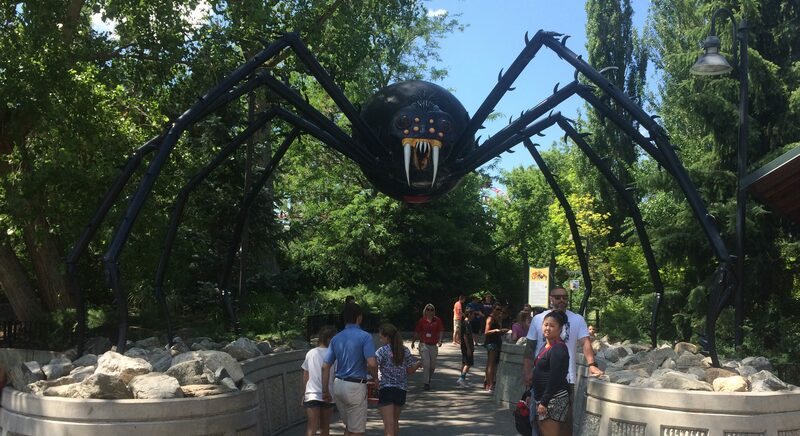 It is 1,122′ 1″ long, 48′ 6″ high, has a ride duration of about a minute and a half, and a top speed of about 26 mph. Here’s an on ride video from my YouTube channel. Next are the ones that weren’t photographed. A small roundabout type ride that goes up and down on a track. 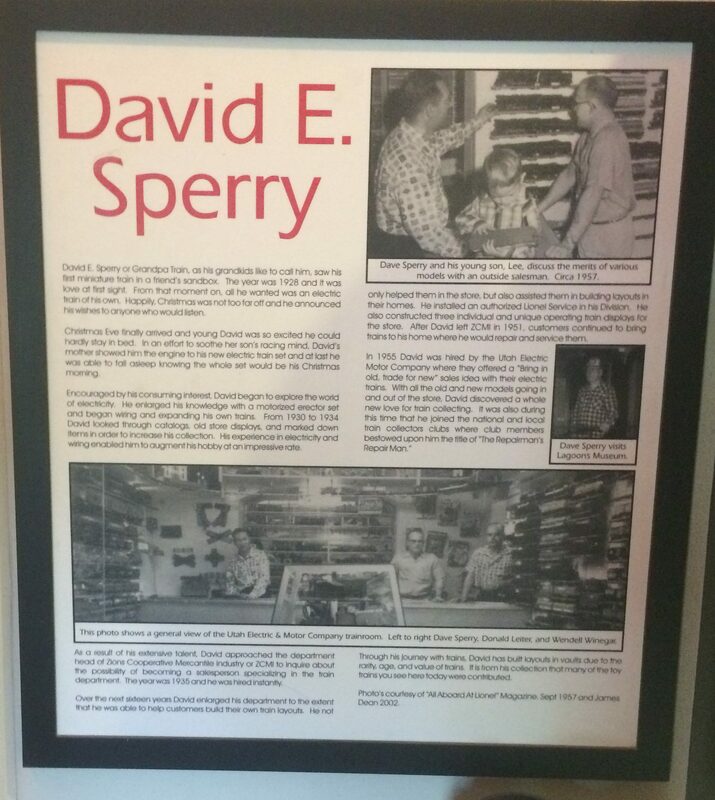 It was installed here in 1954. A small airplane type ride like the Red Barron except with Spaceship vehicles that was installed in 1983. This ride was installed in 2013 and basically are a bunch of miniature 4×4 trucks connected together that go around an oval course. 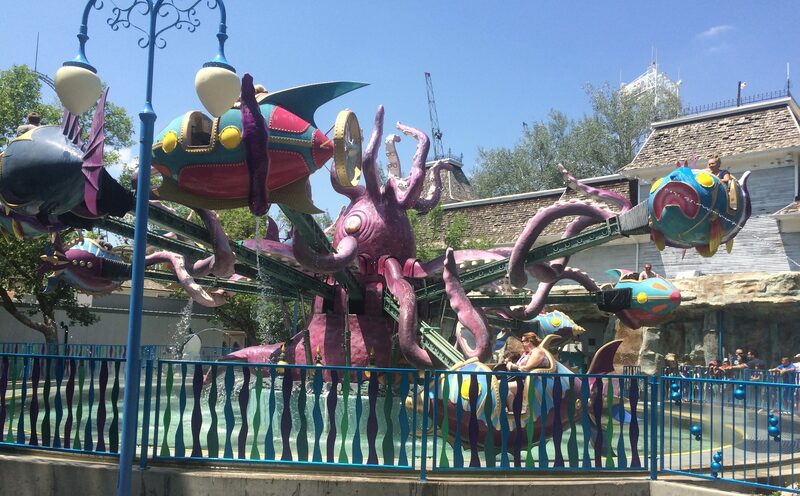 An airplane type ride like the Red Barron with Sea Creatures as ride vehicles. 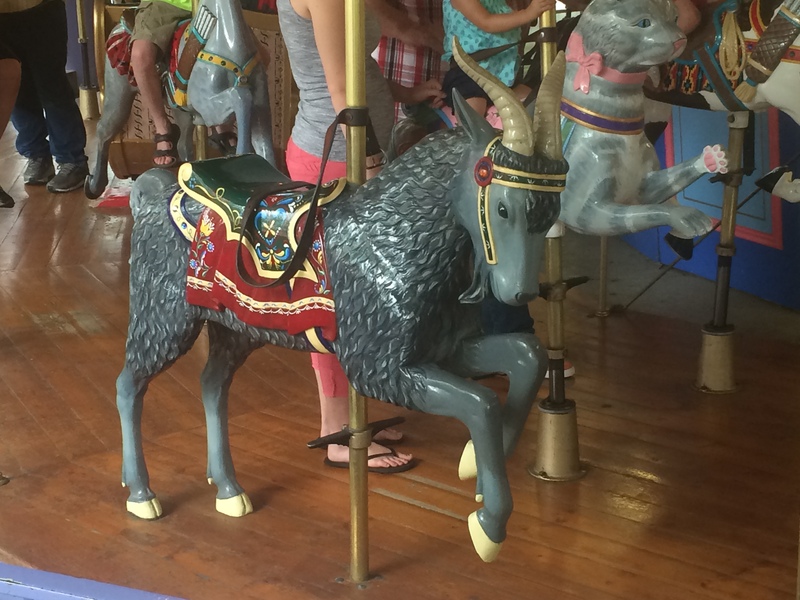 This ride was installed in 1986. A miniature bumper car ride. 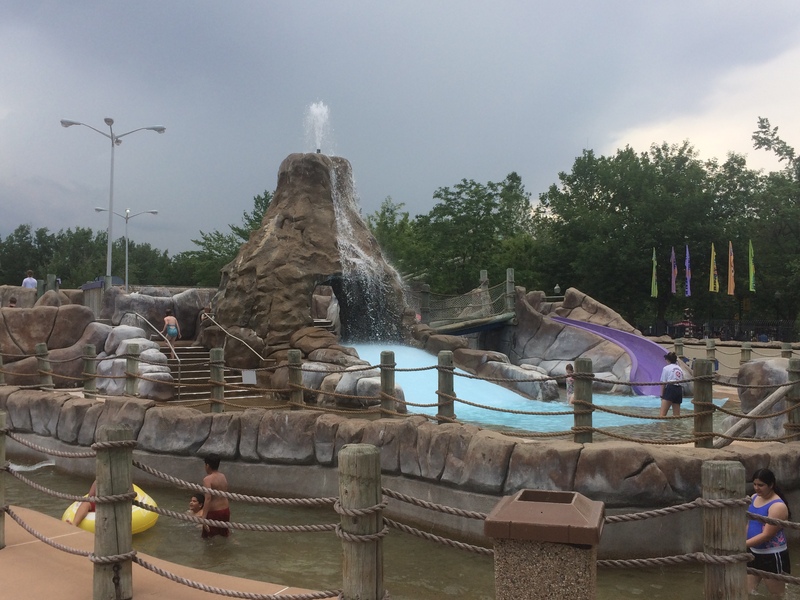 This water park is situated inside the park in what used to be the old swimming pool that reportedly had 1.5 million gallons of “water fit to drink”. That pool closed after its fifth decade of operation in 1987 in favor of the new water park called Lagoon-A-Beach. That park cost 5.5million dollars and opened two years later in 1989. 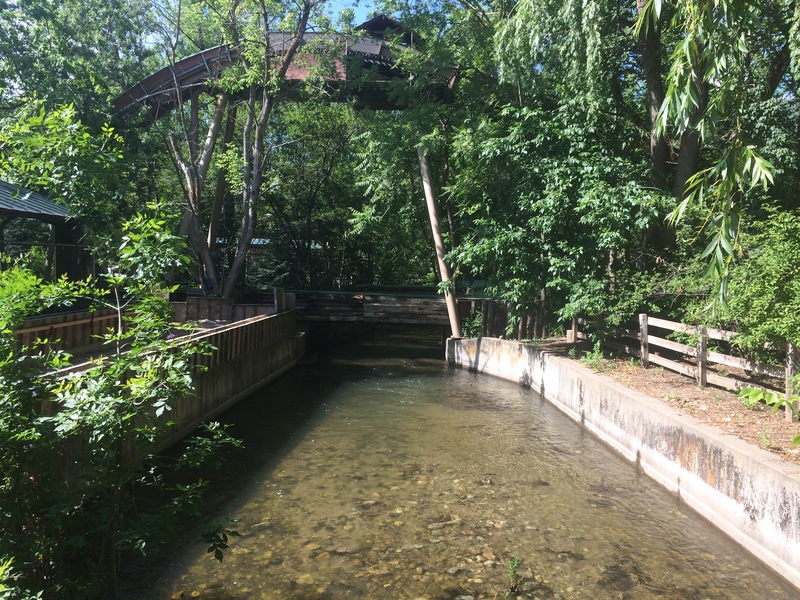 Unfortunately, the new water park also signified the end of the railroad that operated around the residential side of Pioneer Village as some of the supports for the water slides had to be placed where the tracks were. All of the videos in this section will be from Deathbyillusion’s YouTube channel. There are seven attractions as well as lockers, restrooms, and a gift shop here and I will try my best to match them up with the photos. This body slide complex has many slides here, all of which are forty feet tall and are some of the favorites at the park. Bongo’s Bay is in the foreground and is a kids play area. This is another slide that is in the same complex. These two slides actually twist around each other. That is it for this slide complex. Mooches Mainstream is a lazy river that gently floats around the Blue Lagoon and Bongo’s Bay. The Bongo’s Bay area is a play area for the bigger kids who aren’t yet tall enough for the big slides. 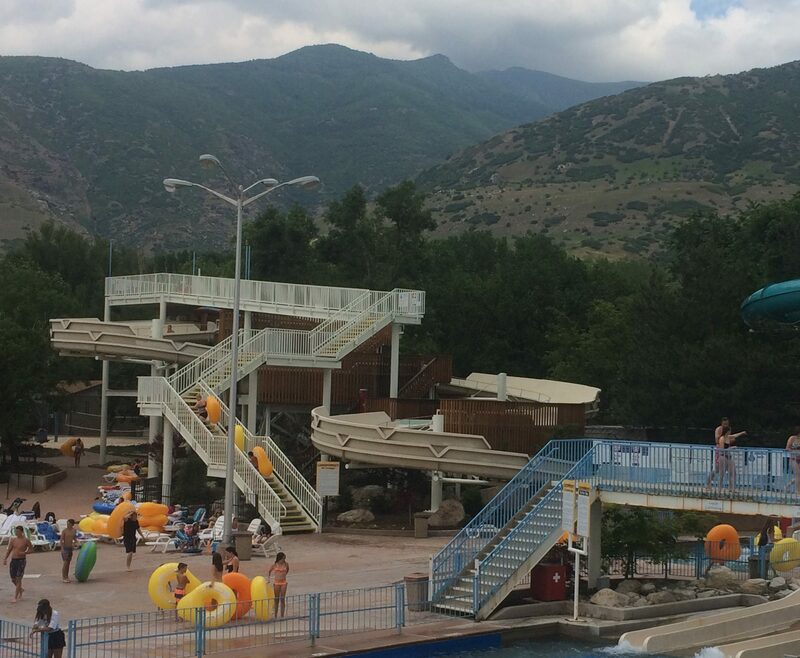 This is a unique tube slide in that riders sit in rafts and be pushed down a slide to the next pool. There are about five slides and five pools on this ride. 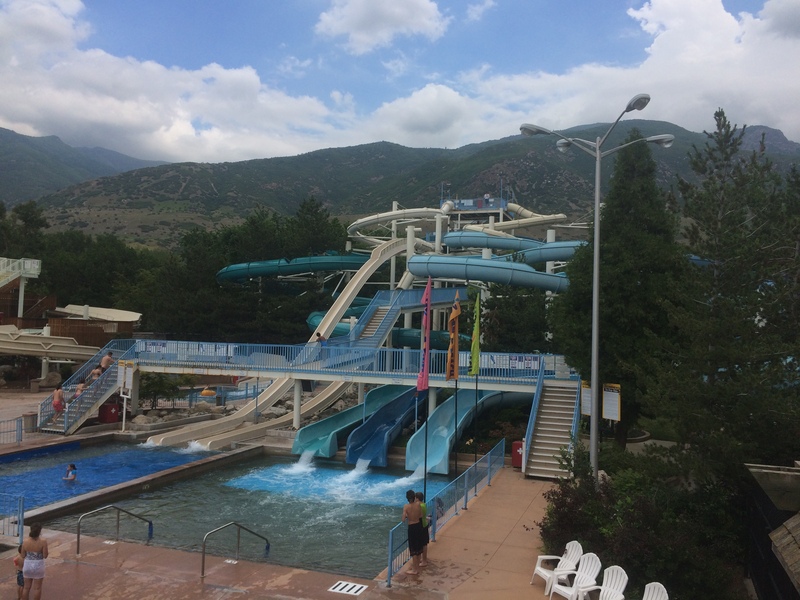 There are several drop slides and serpentine slides in this complex the first of which is a body slide. 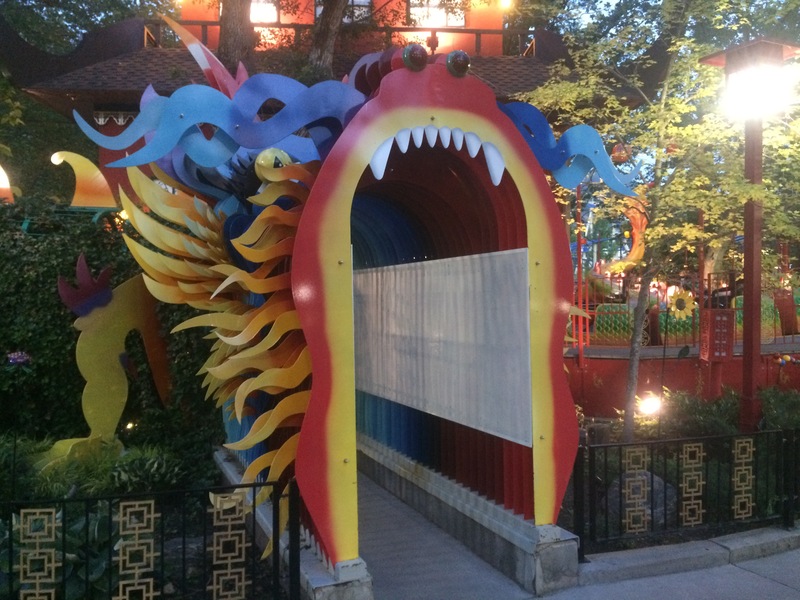 This one twists and turns on you way down to the pool. This one does the same thing as Sea Snake with the exception being that you are in a tube. 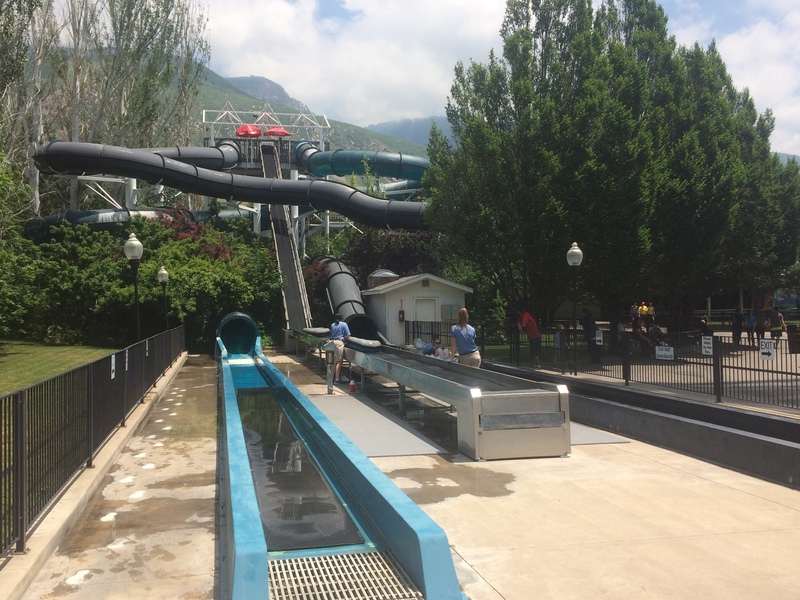 These drop slides have a few twists in the dark, one large drop at the end and is quite fast going into the splashdown pool. The first video is of Liquid Lightning and the other is of The Drop. Now we’ll need to dry off and change back into our regular clothes and walk back through part of Kiddyland to enjoy the rest of the park in the northern part of the Midway. 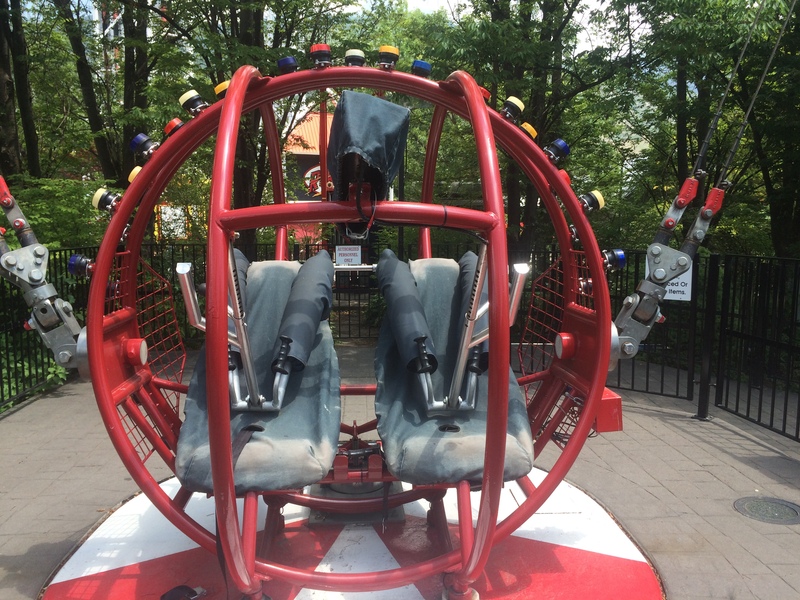 This ride will literally snip and twirl you in more ways than one so it is definitely not recommended for those that have a squeamish stomach. Air Race is a World War Two themed ride with ride gondolas that are themed to that era of aviation. 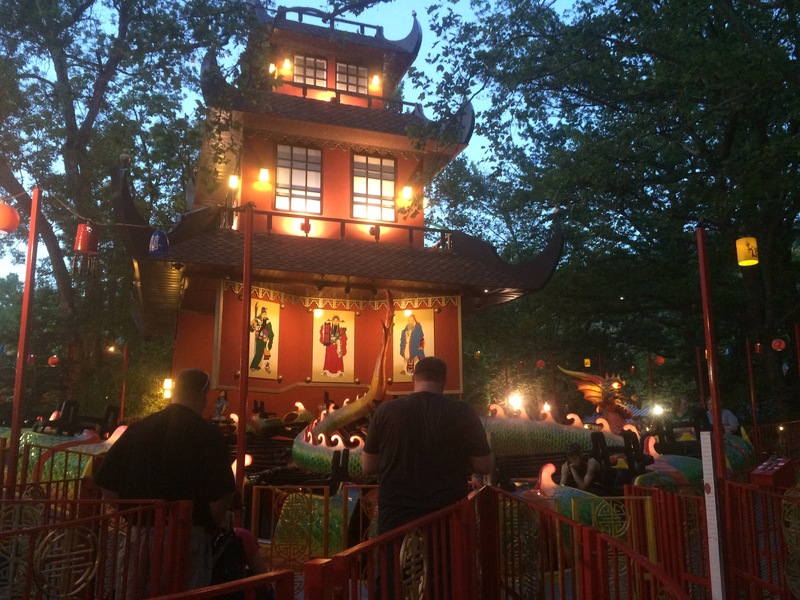 The ride even has sounds of propeller planes flying by when the ride is in motion. 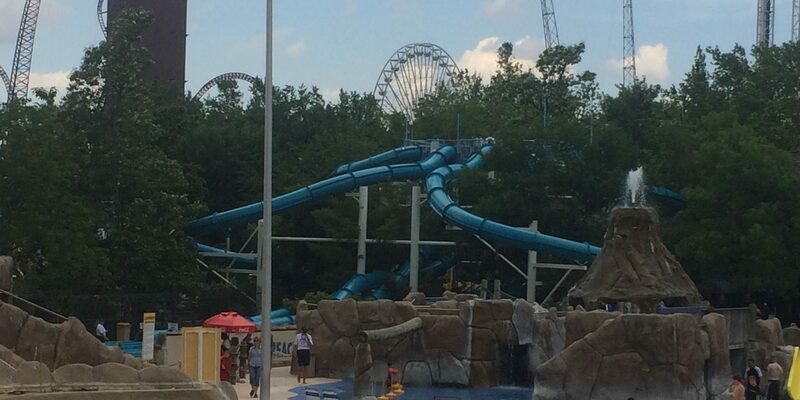 It was built by Zamperla and opened here in 2012. 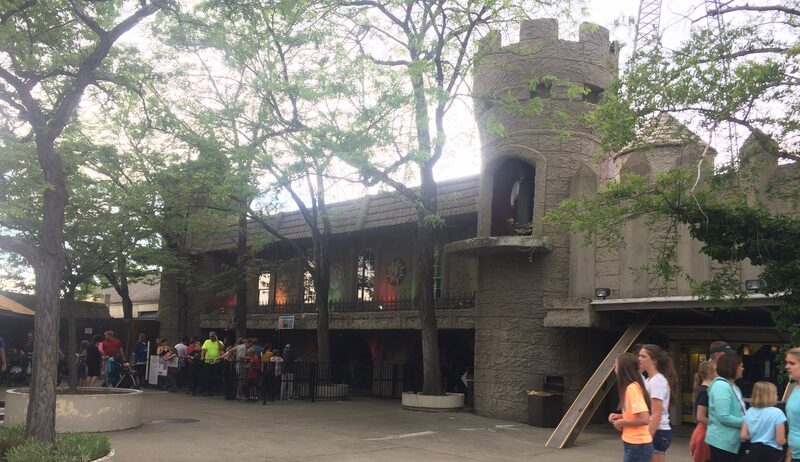 It took the place of Psycho Dave’s Junkyard which was a walk-through attraction that was only open during the Frightmares Halloween event. Here’s an off ride video from my YouTube channel. This coaster is a rare one as it is the last remaining Jet Star 2 model in North America from the Schwarzkopf Co. 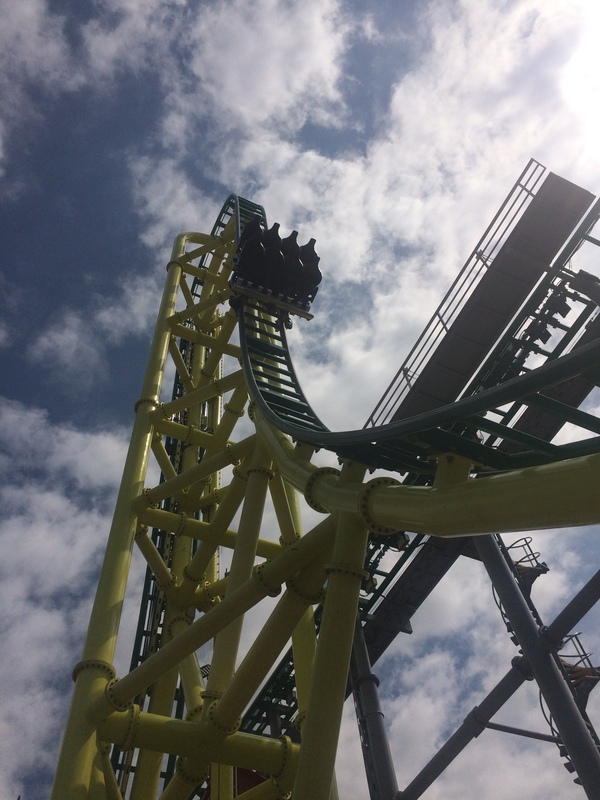 It is also unique in that it is one of the few coasters that doesn’t use a traditional chain lift to pull cars up to the top. 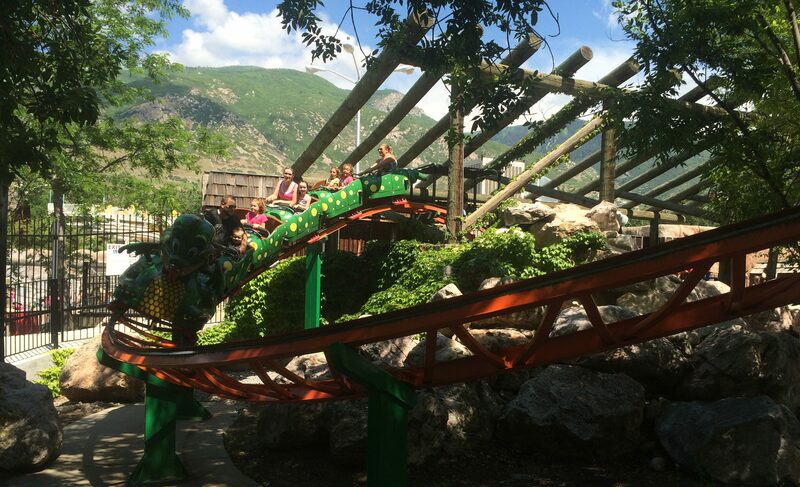 This coaster uses a spiral lift and each car propels itself up the spiral lift by using an on-board electric motor. 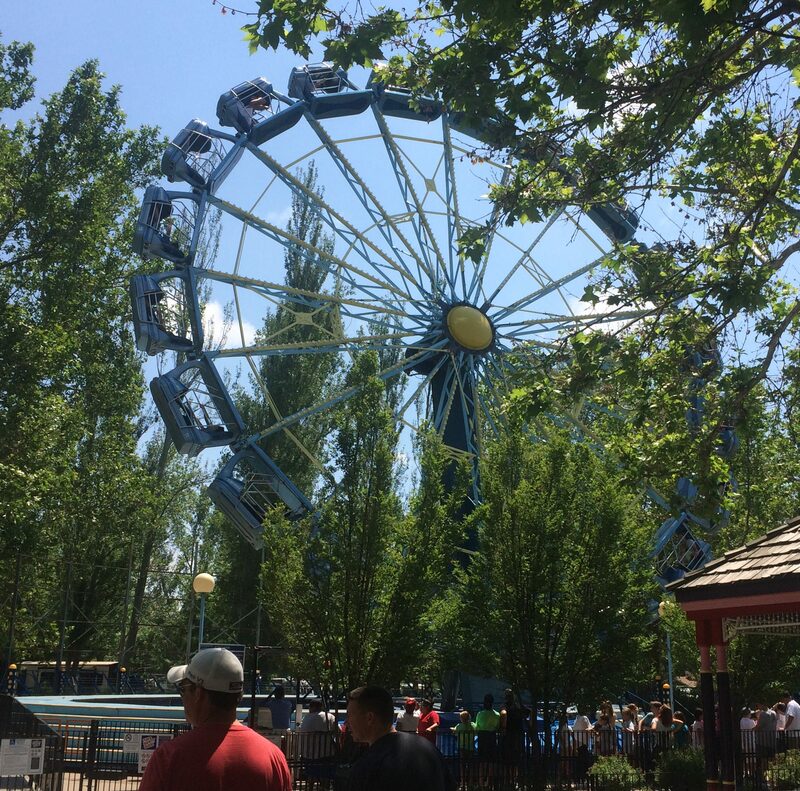 This coaster also originally operated at Riverfront Park in Spokane, Washington, USA. Riverfront Park was actually the site of the 1974 World’s Fair which operated from May 4 to November 3, 1974 when the 74′ World’s Fair and Riverfront Park closed. 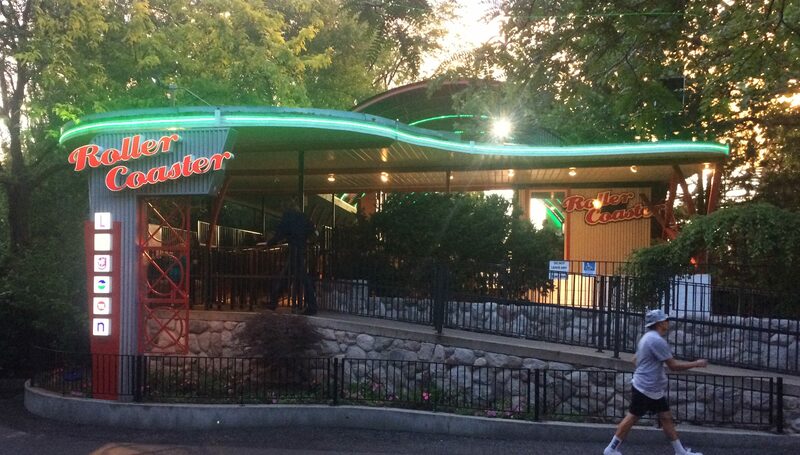 The coaster was then brought to Lagoon in and opened in 1976 where it operates to this day. 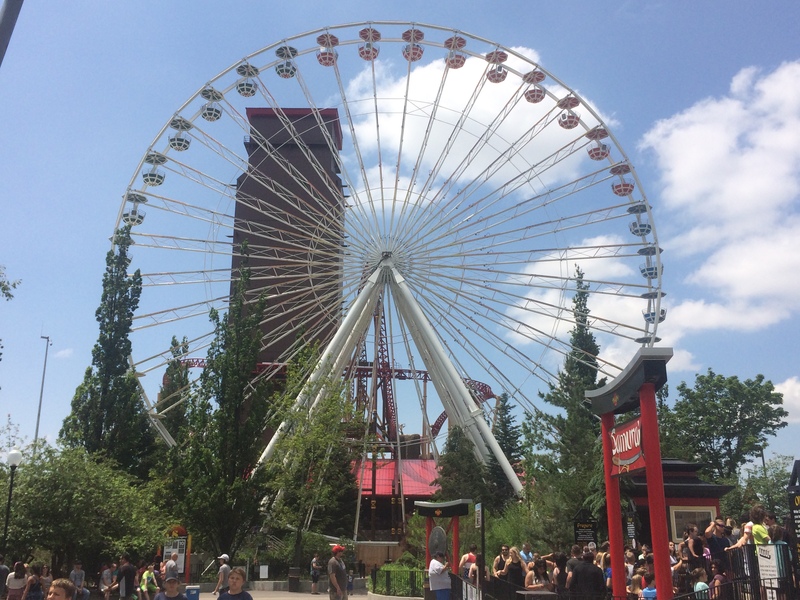 The coaster is 1,919′ 3″ long, 44′ 3″ high, and doesn’t allow any single riders so you must partner up with someone or you will not be allowed to ride. Here’s an off ride video from my YouTube channel. Directly across from the Jet Star 2 coaster is Opera House Square. This turn-of-the-century style opera house originally opened in 1968 and showcased silent movies, musicals, and melodramas until it closed in 1989. The square itself has the other indoor dinning area for Arby’s and a Subway restaurant is there as well. Next, we’ll pass the north midway station of the Sky Ride that will take you to the southern end of the Midway, then we’ll take a ride on an old classic that seems to be making a resurgence at parks across the US. This ride is a favorite of mine and I always ride them at parks that have them. It was is a Flying Scooter model that was built by the Bisch-Rocco company and installed here in 1964. 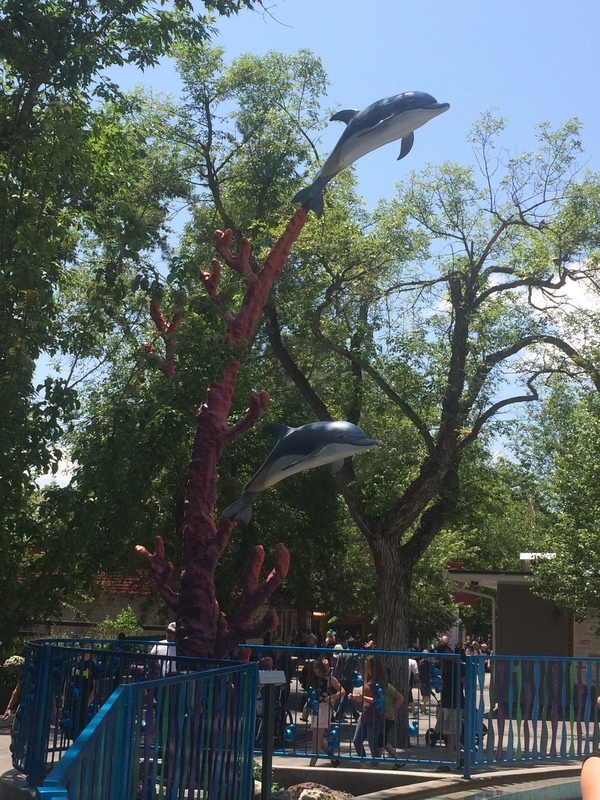 At some point in time, the ride was removed and then reinstalled in 1986. Riders can actually control the height of the gondola by moving the rudder from side to side. You can actually get it quite high if you know how to operate it properly. Here is an off ride video from my YouTube Channel. Next is a ride that will launch and drop riders. 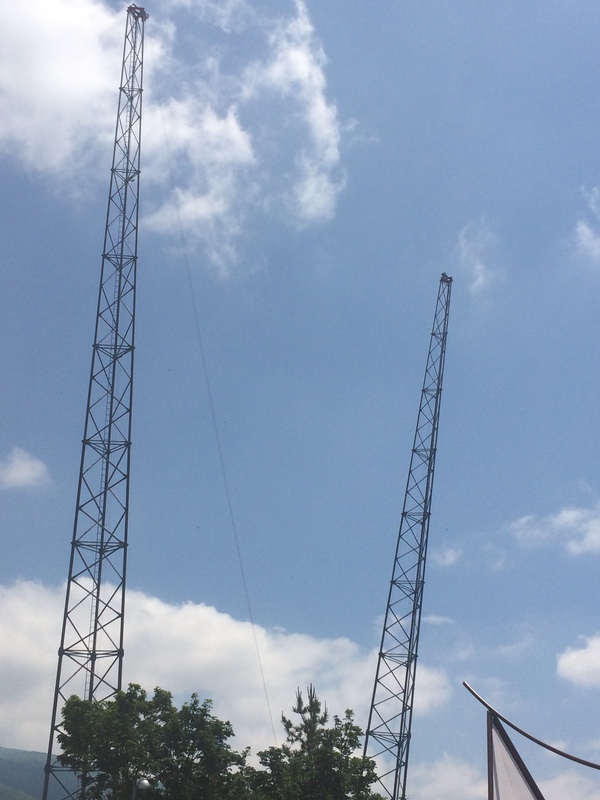 This attraction will launch riders 200 feet high or drop riders from the top of the 200 foot tower. This is a Space Shot Tower from S&S that was built here in 1999. The Rocket side launches riders up 200 feet which is absolutely exhilarating and the Re-Entry side will pull riders up to the top of the 200 foot tower offering a beautiful, if not brief view, of the surrounding area before being dropped to the ground. Here’s an off ride video of both rides from my YouTube channel. This looks like a ride where you’ll surely get wet but that isn’t always the case. Riders get into rafts and are sent on their way and riders rarely get very wet at all. There are two slides that are pretty much the same. The blue slide is a translucent slide and you can see where you are going but the black is completely opaque so you cannot see where you are going which is incredibly exhilarating in my opinion. Here is an on ride video of the blue (translucent) side of the slide from Deathbyillusion’s YouTube channel. The second video is from the black (opaque) side by the same YouTuber. This attraction is a Top Scan model from Mondial that will twist you every which way from Sunday and was installed here in 2000. Here is an off ride, day and night, video of the ride from my YouTube channel. 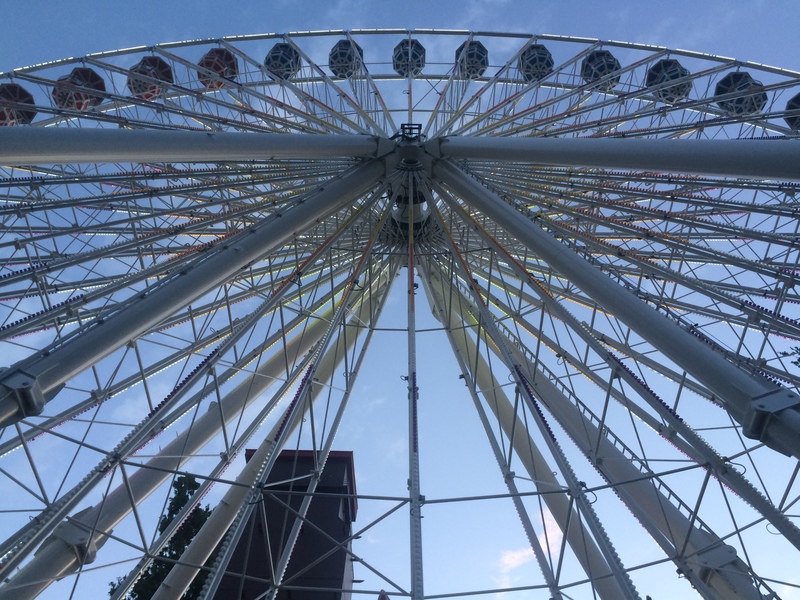 Next up is a staple of just about every amusement park, the Ferris Wheel. This attraction was installed here in 1991 and is a bit unique as the ride gondolas can spin as fast or as slow as the riders want provided that they’re a party of two or more. Like the Jet Star 2 coaster, this ride doesn’t allow single riders. 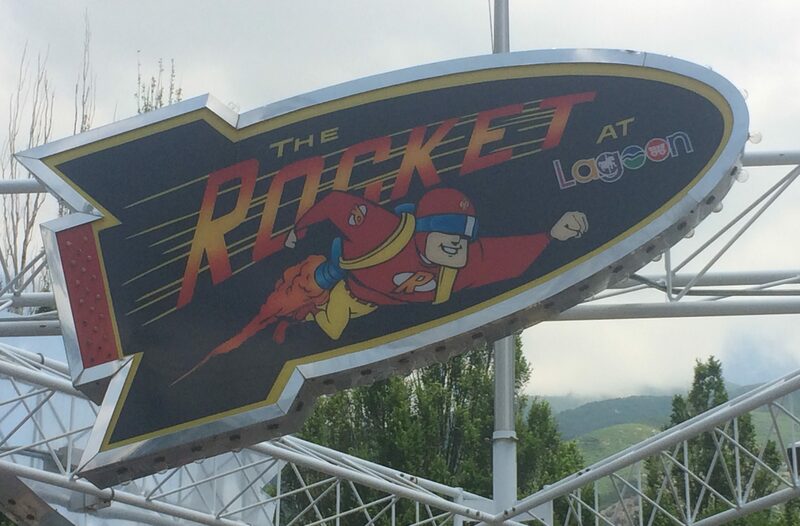 Next up is the star attraction at Lagoon. 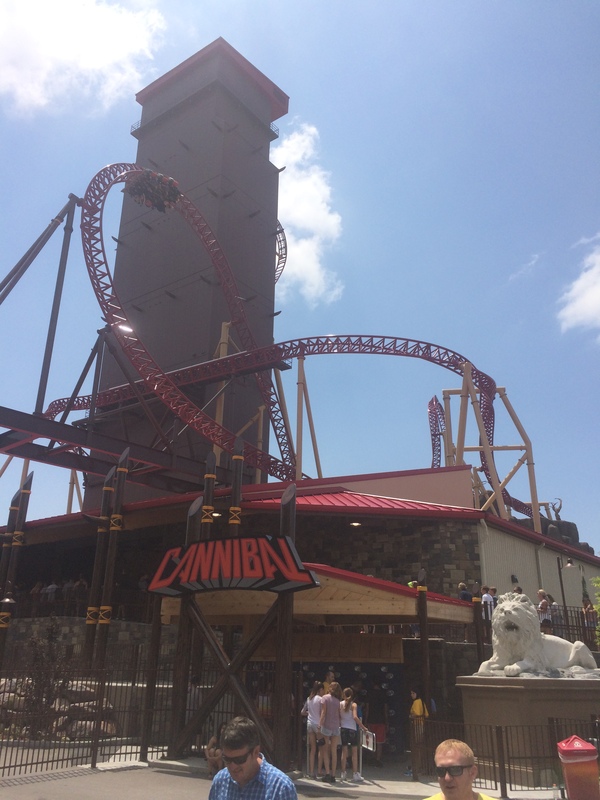 Cannibal is the tallest ride in the park at 208′ tall, and has the steepest drop, at 116 degrees, of any roller coaster anywhere in North America. This is an incredible ride and well worth the wait which can get up to two or more hours long during the summer season. 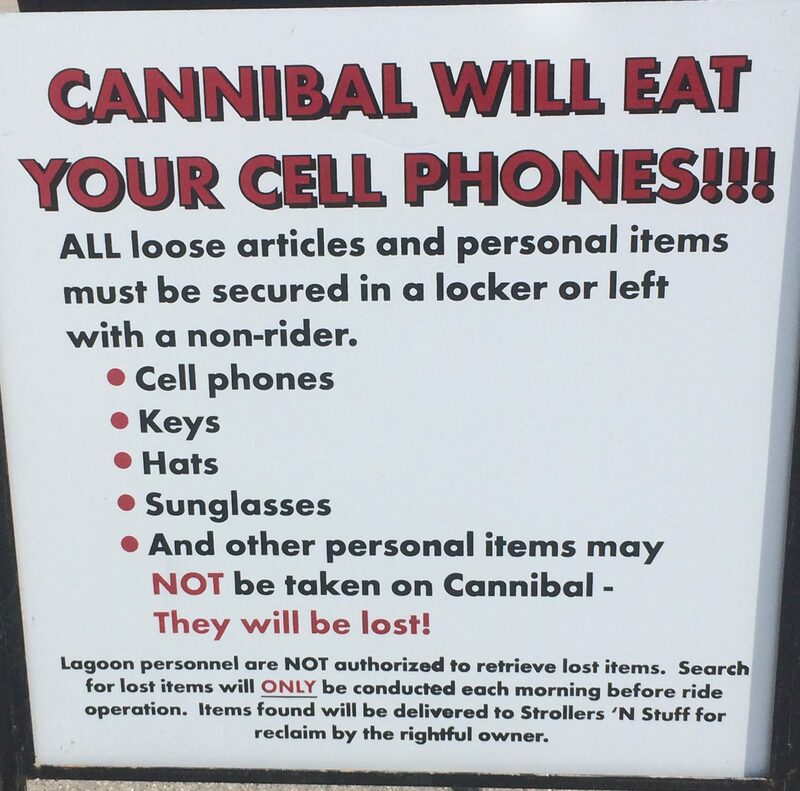 You’ll need to stow all, and I mean ALL, of your belongings in a free locker that are near the entrance because, as the sign below says, “Cannibal will eat your cell phone”. 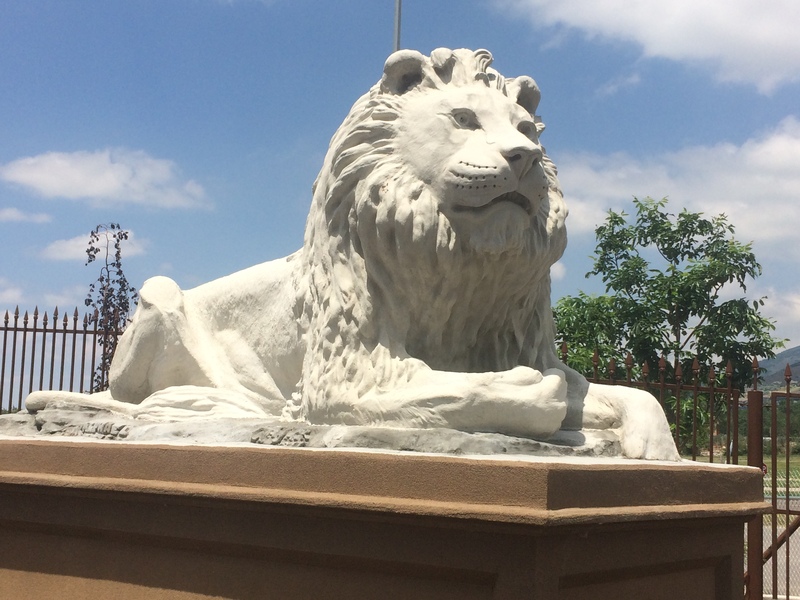 Believe it or not, Cannibal has three of the four Lion statues that used to sit on either side of the marble staircase at the Utah State Capitol building in Salt Lake City. Those statues, two at the entrance and one inside the station, are made of concrete and were originally sculpted in 1915 by Artist Gavin Jack. Lagoon bought them off Ebay in 2009 and faithfully restored them. This coaster is also unique in several ways, one of them is that it was built and designed completely in-house by the parks engineering firm called ART Engineering. Another is that the steel used to build this coaster was forged nearby which allows the track segments to be longer than the normal track segments on the average steel coaster and allows for a much smoother ride. 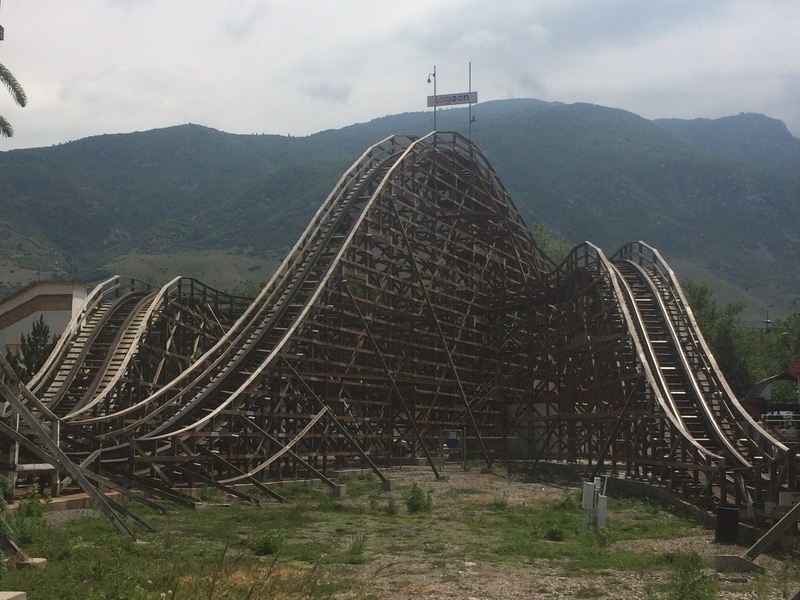 Cannibal also has unique inversion elements such as the Lagoon Roll which is two straight-line inversions and the riders stay upside down longer on the other inversions. 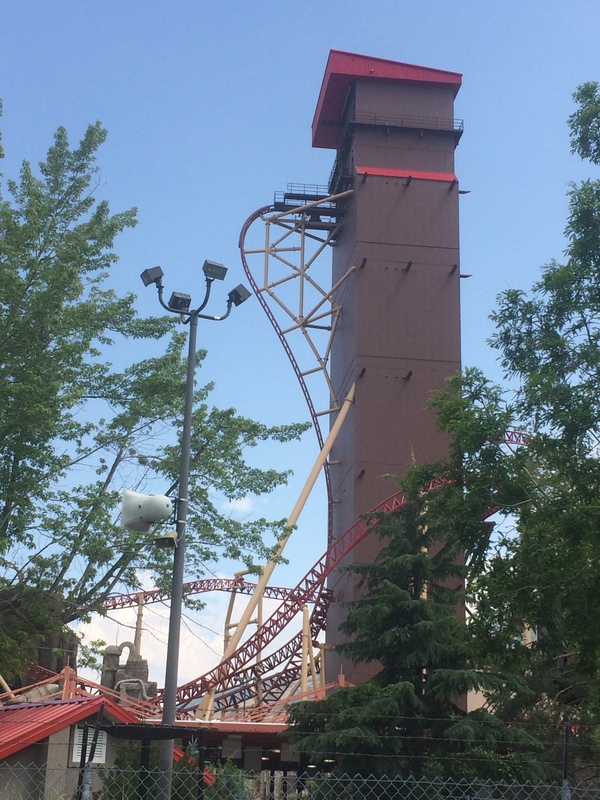 Another unique element is that the coaster doesn’t have the traditional lift hill like the Roller Coaster or Colossus has. 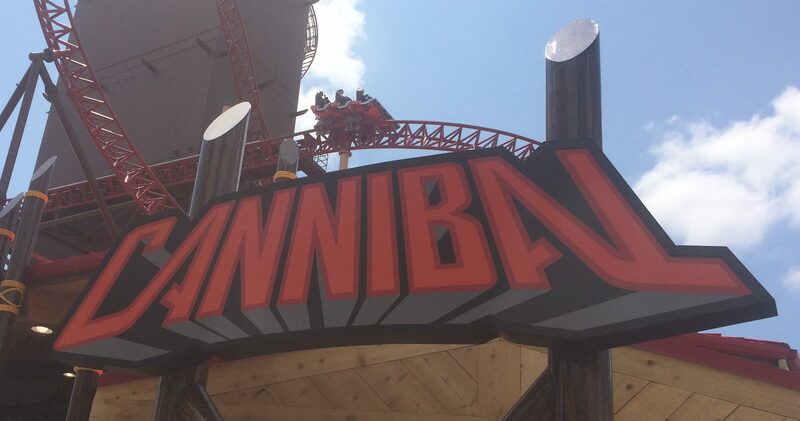 Cannibal utilizes an elevator style lift to bring the cars to the top. Once at the top, a door lifts and the car, which has no over the shoulder restraints just a lap bar and ankle brace to keep you securely in your seat, comes out of the lift, stops for about 10-20 seconds giving riders a beautiful view of I-15 (Interstate 15) and the Great Salt Lake. 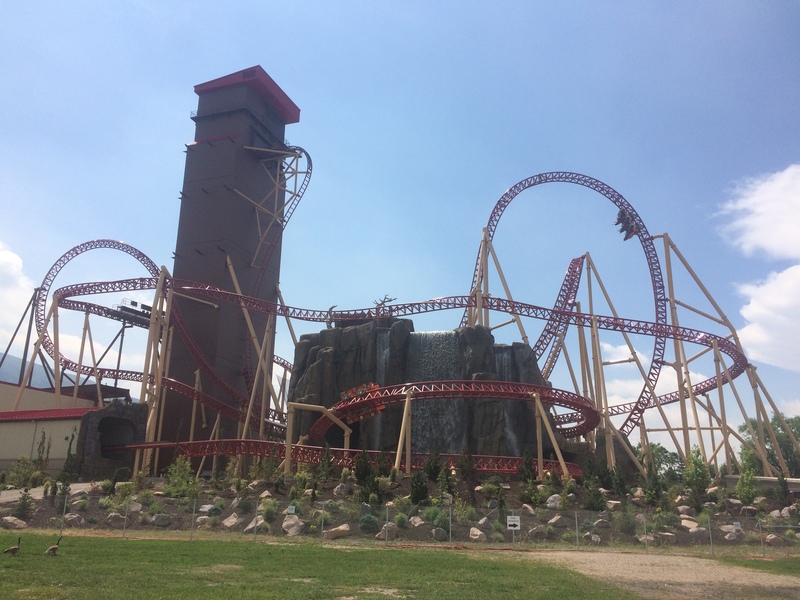 Then riders are plummeted down the 200 foot drop at a 116 degree angle into the first inversion called a Immelmann, which is half a loop where riders enter it at the bottom and exit at the top. 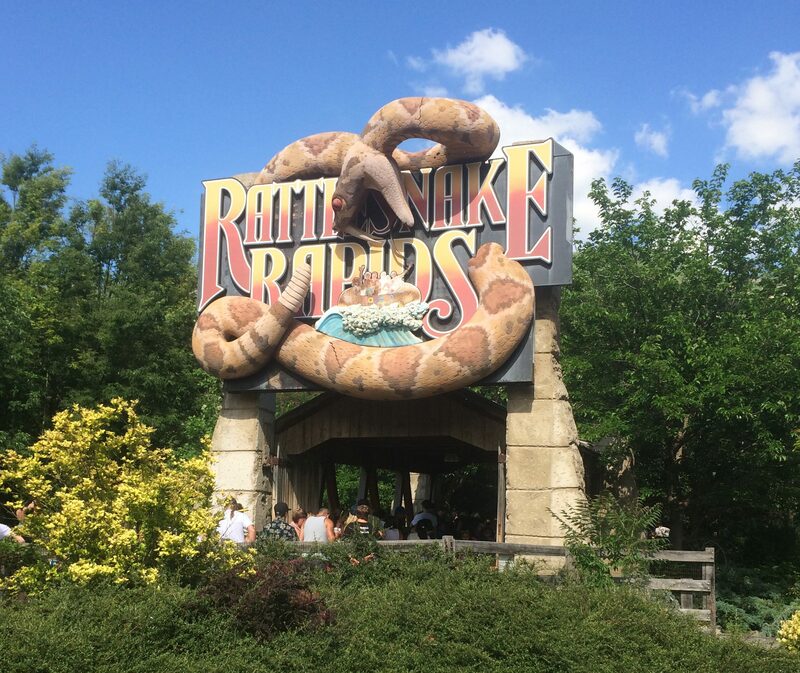 Then riders go through a Dive Loop which is a half a loop where riders enter it at the top and exit at the bottom. Then riders will go through a series of overbanked turns before going through the mid-course brake run. 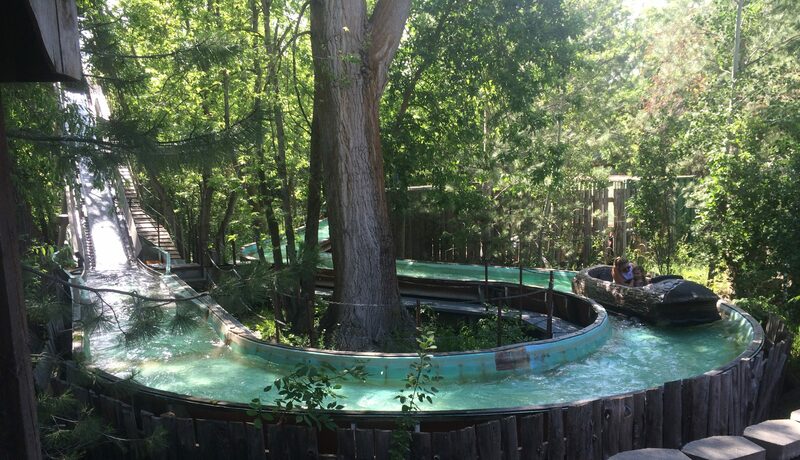 Then then the car turns left into the Lagoon Roll, which is a 400 degree roll to the left and then a 400 degree roll to the right, all of which occurs in a straight line before going into a series of turns and helices while going in and out of a mountain with waterfalls. This ride is absolutely incredible to ride and would highly recommend it for any enthusiast as I came off this ride with the biggest grin I’ve possibly ever had. They do have a single riders line which I used every time as the regular line was a few hours long every-time I wanted to ride. Please use the single riders line if you are a single rider only as you WILL be separated if your party chooses to use the single riders line. Here’s my off ride video from my YouTube channel. 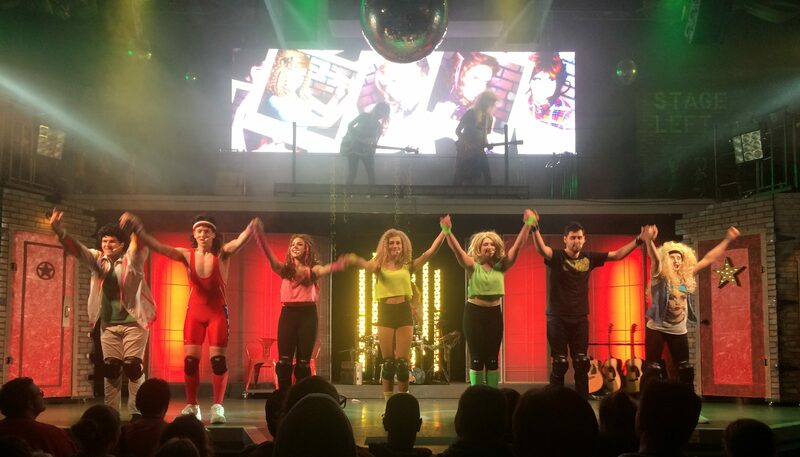 And here’s an on ride video from Deathbyillusion’s YouTube channel. Next up is a up charge area called…. This area opened in 1995 and has three attractions that are an additional cost. This is the newest ride in the X-Venture Zone and was installed in 2002. This ride will launch riders up to 250 feet in the air and those riders can even purchase their on ride experience because they have wireless cameras and microphones inside the ride gondola. This ride opened here in 1995 and is about 173 feet tall. Riders (up to three) put on a special harness and are attached to a set of cables. The group is pulled up the back tower until they are approximately 140 high once they are in the flying position. When they reach the top of the back tower, a voice instructs them to pull the ripcord. Riders then free fall for about a second before the guide wires they are attached to swing them out between the two main towers. The ride is over once the riders grab a large ring that is raised from the ground to help bring them to a stop. Lagoon was one of the first parks to install a Skycoaster at their park. This is an elaborate two-track go-kart track complex that opened here in 2000. The two tracks are Thunder at 1,142′ long and Lightning at 1,146′ long. Each track has several turns, camel back hills, and overpasses which makes it quite fun. Now it is time to finish out our tour of the park by getting back on the Midway. This is one of those classic staples of any amusement park. The Paratrooper is a high-speed attraction that in my opinion, tries to simulate what it must have been like to be a Paratrooper. It has the added bonus of operating forwards and backwards which is fun. This ride opened here in 1958 and has been operating here ever since then. 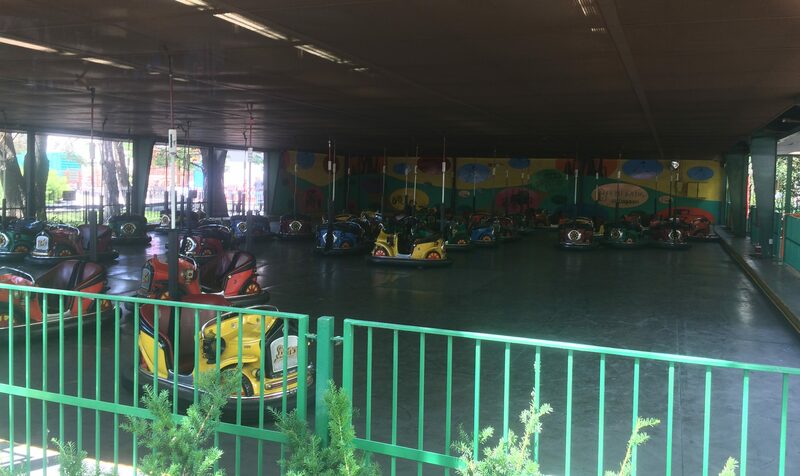 This bumper car ride is another amusement park staple and this one has been here since 1954. 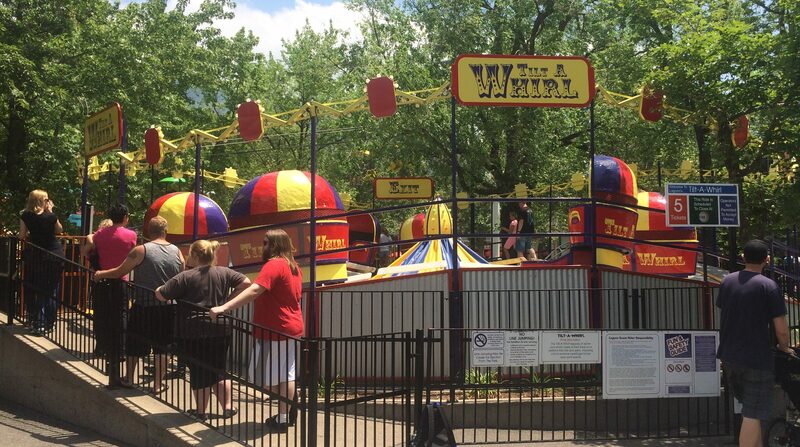 Yet another classic staple of amusement parks, this one has been spinning guests since 1956. 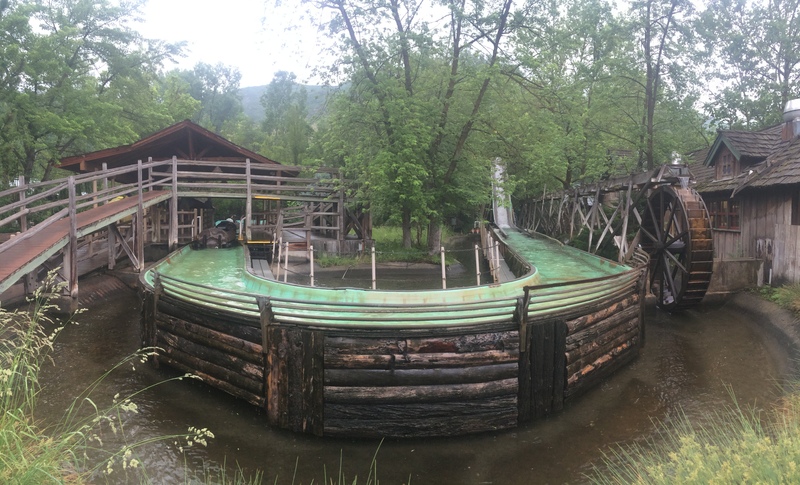 This is also one of the rare ones that has the original domed roof on each gondola. There is an art to getting your gondola to really spin and it is in how you lean into the spin and the timing of your lean. Here is another classic staple of amusement parks. This one spins quite fast with four pods that each have four gondolas that can hold up to three people in each gondola. 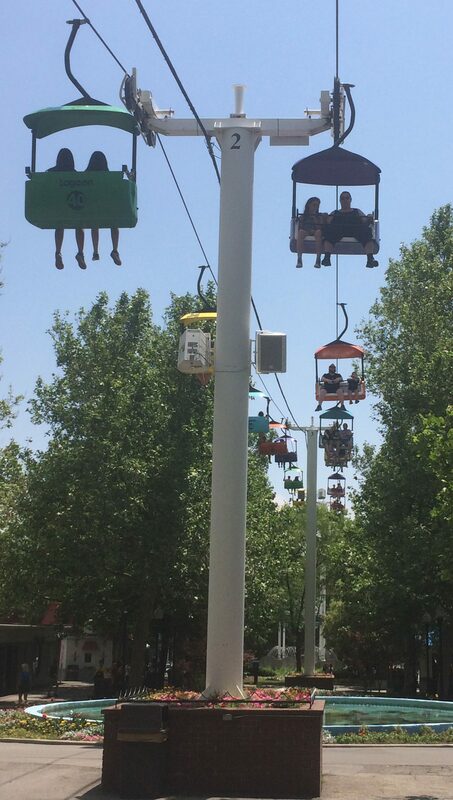 Each of those four pods spin in addition to the ride itself spinning so I recommend that the lightest rider sit closest to the center of each ride pod. This actually is the site where the original Dance Pavilion was that was built in 1906. That pavilion lasted until the great fire of 1953 when the Dance pavilion caught fire and took most of the western part of the Midway with it. The new dance building was built in its place and hosted several nationally known bands and singers such as Stan Kenton, Ella Fitzgerald, Spike Jones, Alvino Rey, Dave Brubeck, Duke Ellington, Louis Armstrong, Mel Torme, Count Basie, Fats Domino, The Everly Bros., Johnny Cash, Nat King Cole, Johnny Mathis, Marty Robbins, The Kingston Trio, The Beach Boys, The Smothers Brothers, Grand Ole Opry, Paul Revere & The Raiders, The Osmond Bros, Ray Charles, The Rolling Stones, Buck Owens, The Doors, The Monkeys, Jefferson Airplane, Evil Knievel and the Jimi Hendrix Experience. 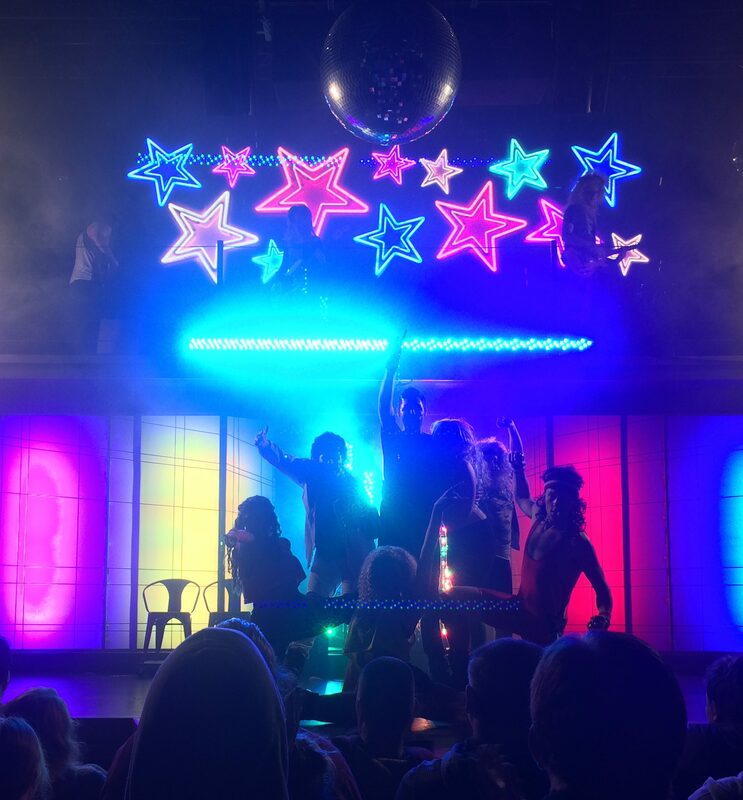 Sometime in the early 1970’s the dance floor was closed and turned into an arcade building with almost 40 arcade games inside. 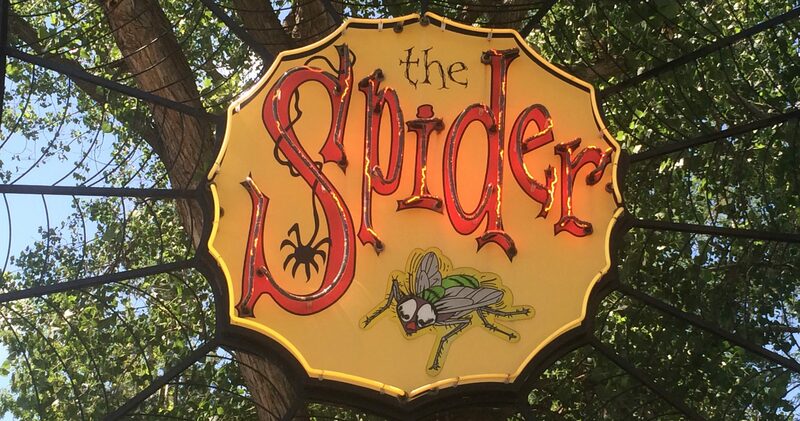 The next, and last ride, is a classic dark ride. 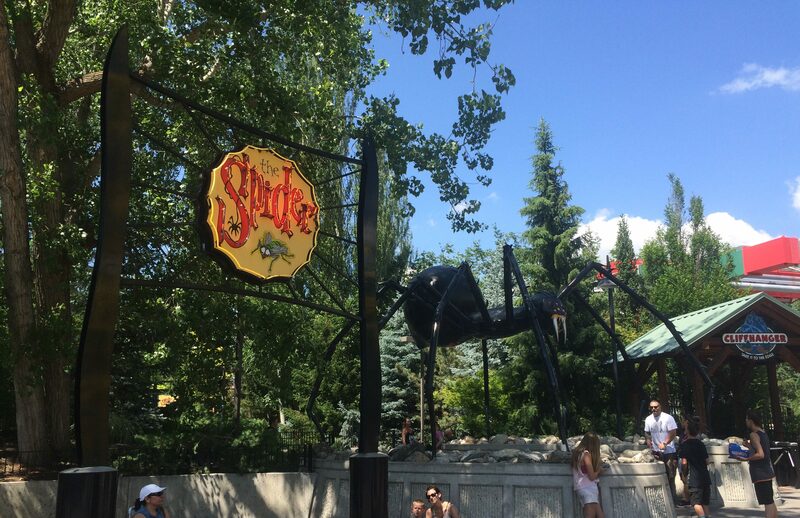 This attraction was built by the famed dark ride builder Bill Tracey and opened here in 1974. As I said before, there are only eight Bill Tracey dark rides left in the US and Lagoon has two of them. This ride should not be ridden by those that are easily scared as this ride definitely is on the macabre side. Here’s my on ride video from my YouTube channel. 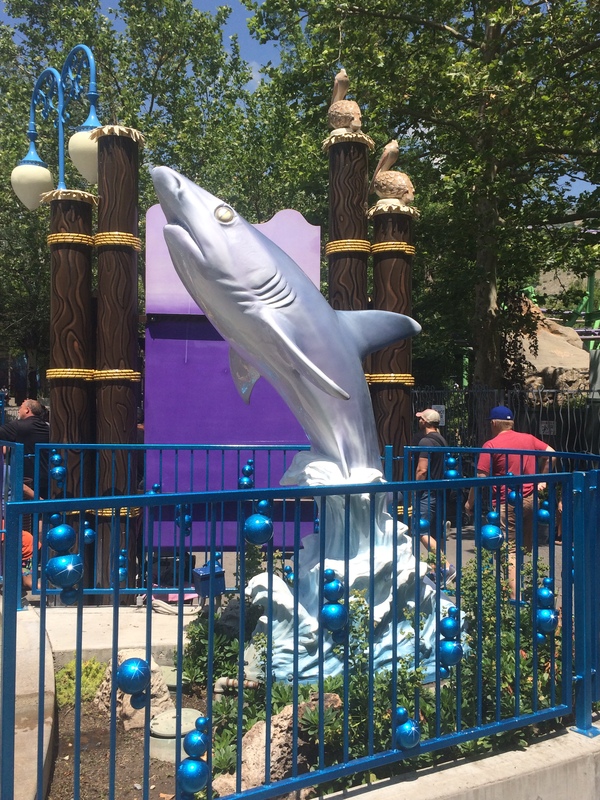 I hope you enjoyed this rather lengthy review of my visit to Lagoon Park and I also hope you found it helpful in planning you trip to the park. I found the park to be very delightful, relaxing, and thrilling all at the same time and I will be returning for a visit sometime in the future.